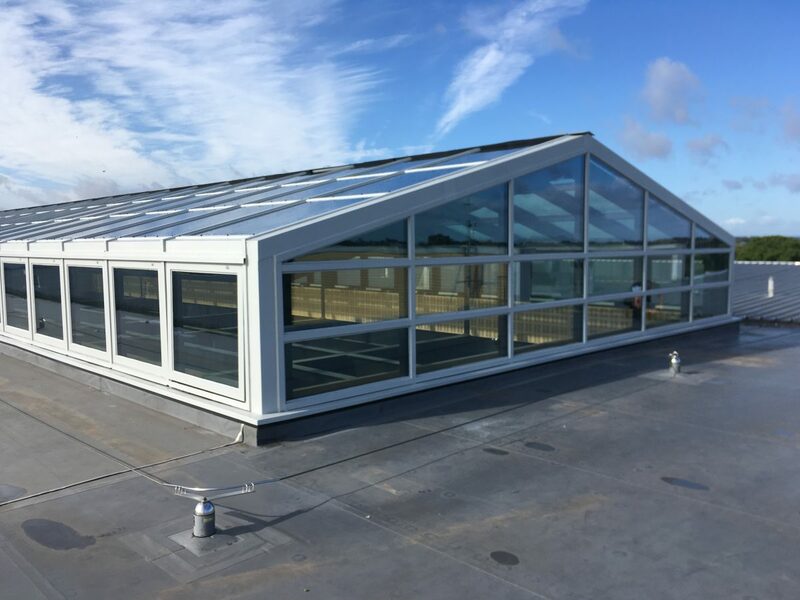 Following our successful appointment onto the framework at York College, Bowman Riley was commissioned to design, specify and project manage the repair of a leaking glazed atrium situated on the College’s roof. York College is ranked Yorkshire’s No 1 further education college with first-class facilities constructed within the last 12 years and designed specifically for post-16 students. 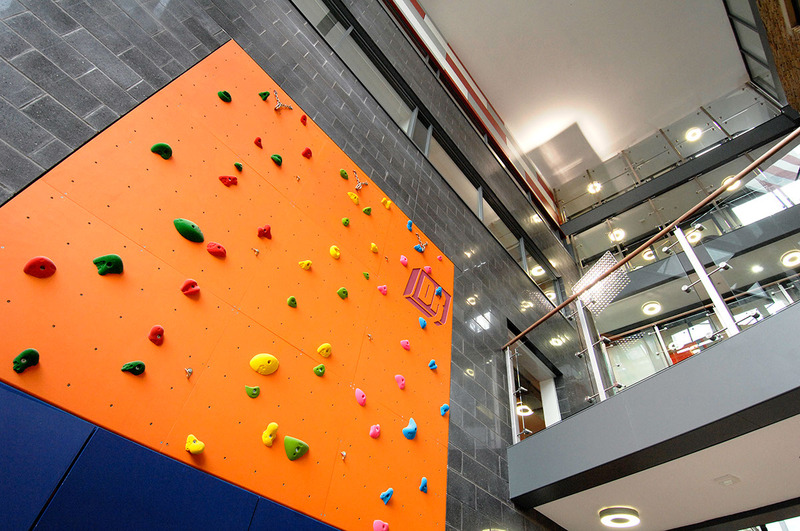 The brief on the York College atrium project was challenging as it involved Bowman Riley facilitating a long-term atrium repair system that fell within their £100k budget and could be undertaken during the student’s six-week summer break. We developed a repair specification that allowed for replacement of failed seals, gaskets and bolts followed by the application of a two-part polyurethane waterproof coating system that carried a 20-year guarantee. 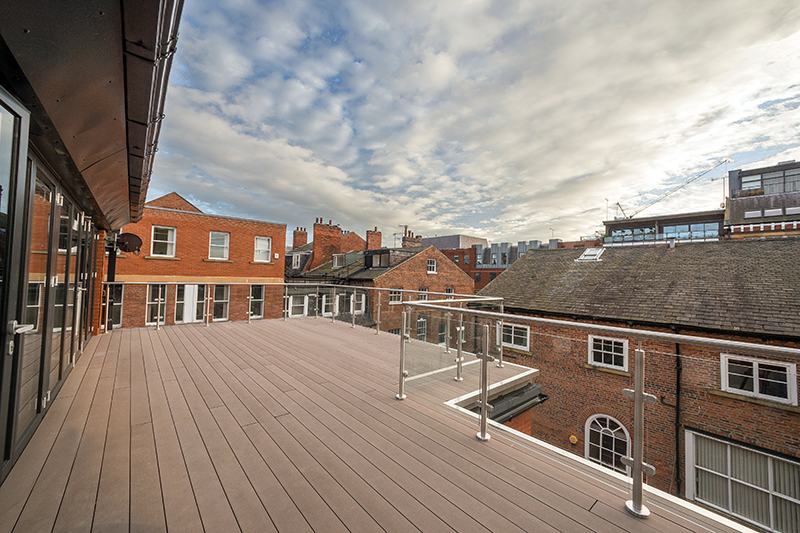 The works were undertaken by means of an Easydeck access system, which allowed safe access to the atrium at roof level and was combined with fall arrest and debris netting fixed beneath the atrium to ensure the health and safety of the contractors and the building occupants alike. 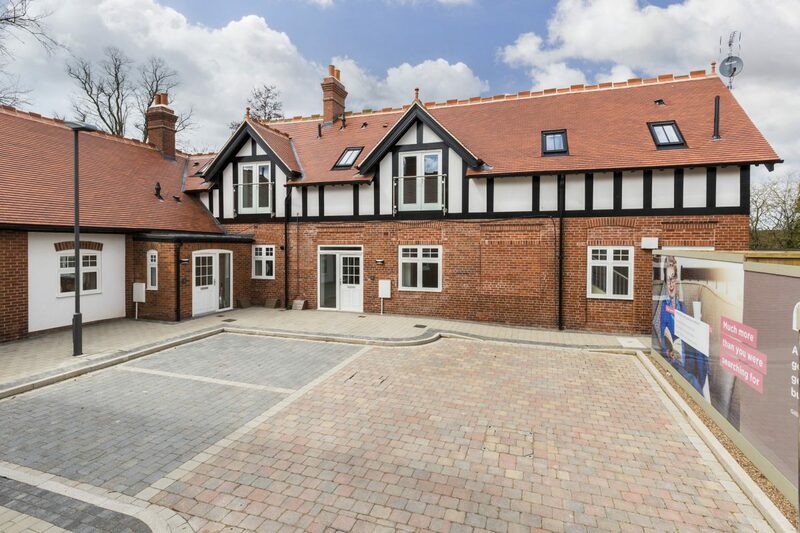 Despite occasionally challenging weather conditions, the works were successfully completed on both time and to budget to the full satisfaction of the College. 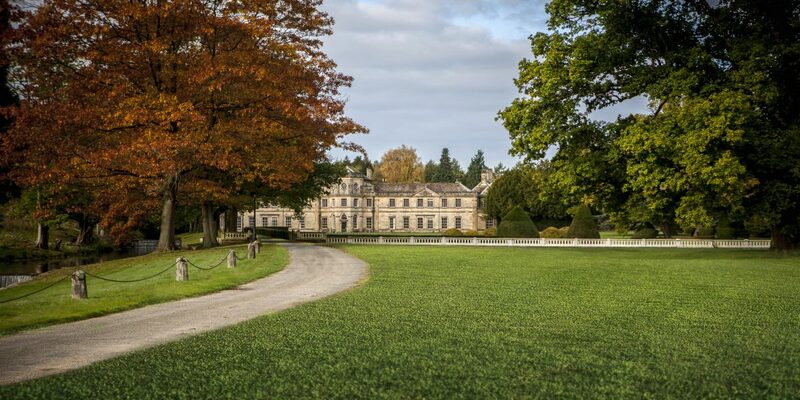 Bowman Riley has been appointed to deliver the transformation of the elegant transform the elegant Grade II* listed Grantley Hall into one of the UK’s finest country hotels and spas. 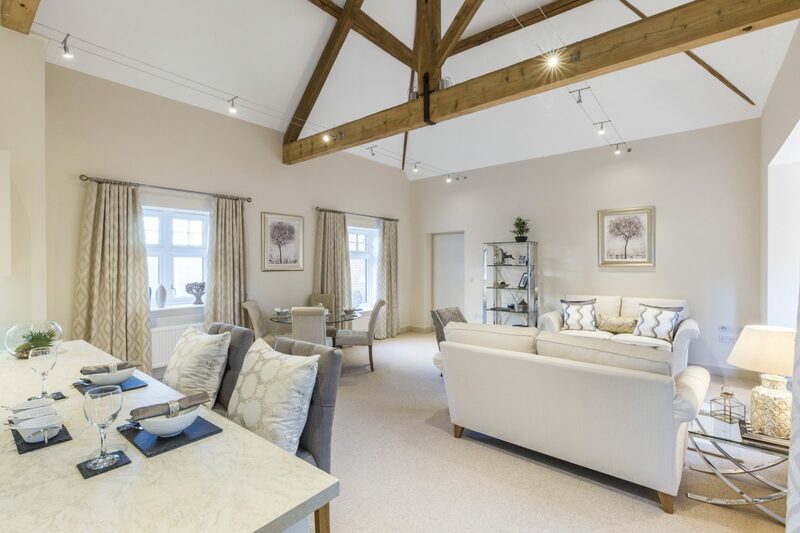 Surrounded by 30 acres of beautiful Yorkshire countryside, the magnificently imposing Grantley Hall is set on an artificial island created by the canalisation of the River Skell in Ripon. 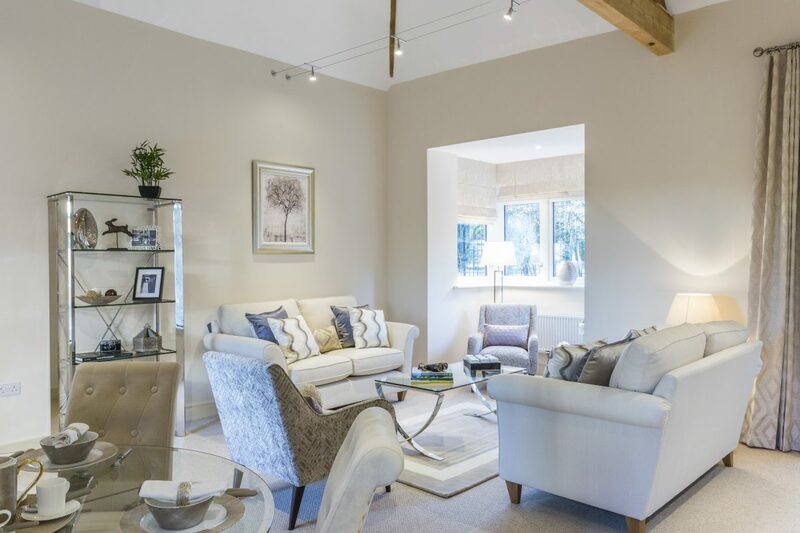 The 17th century classically styled property was built as a private residence for the Grantley family. Extensions in the 18th and 19th centuries followed leaving a principally Georgian elevation. 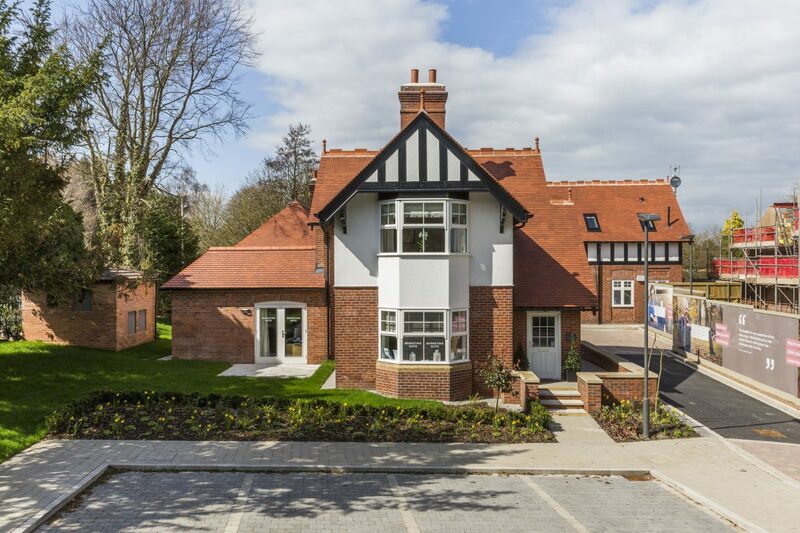 The building has enjoyed a colourful history which includes its use as a shooting lodge, convalescent home during the Second World War and an adult education college. 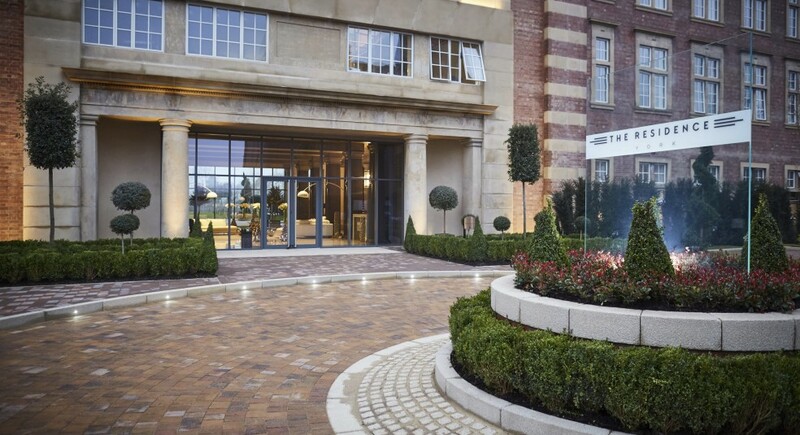 Inspired by its grandeur, the renovation of Grantley Hall accentuates the historic details of the imposing property featuring a magnificent dual height presidential suite, signature restaurant, brasserie and cocktail bar set in exquisite formal gardens. 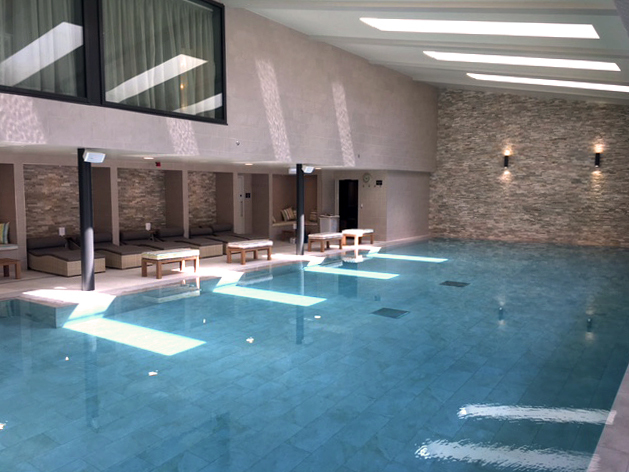 To complement the historic Hall, a new spa building has been created in the classical Georgian style. 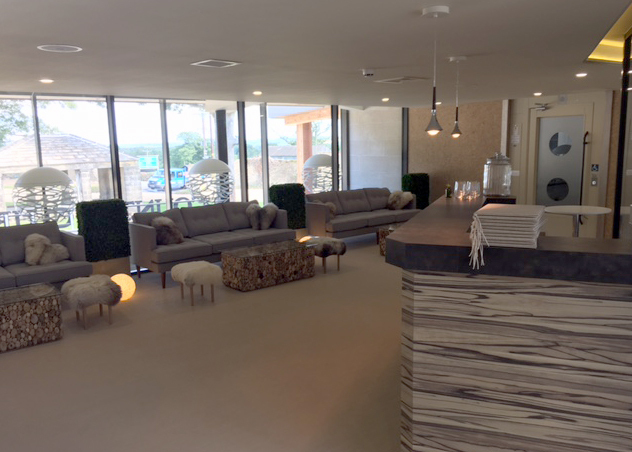 A new special events building featuring a bar, private lounge, an exclusive after-hours club and restaurant has been integrated within the 1910 Japanese garden restored to become one of the most important of its type in the country. 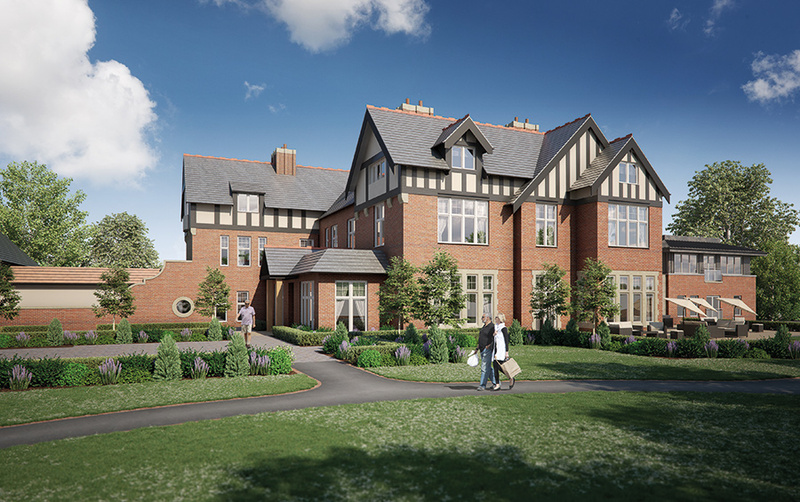 The renovation of the historic hall alongside the creation of two new bespoke buildings will allow hotel guests to experience a five-star luxury getaway in opulent surroundings. 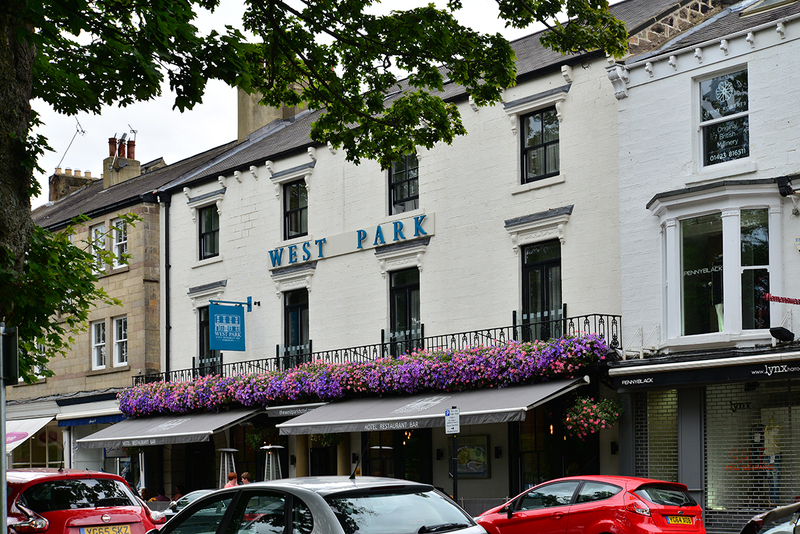 Bowman Riley transformed The West Park Hotel, a former 19th coaching inn located on the Stray, in Harrogate’s Conservation Area into a luxury boutique hotel. 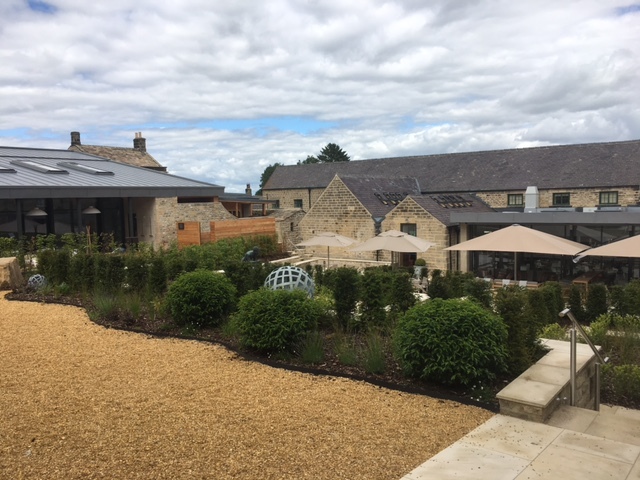 In 2012, Provenance Inns’ purchased the hotel following several years under-performance, due to the unsuitability of the accommodation and facilities. 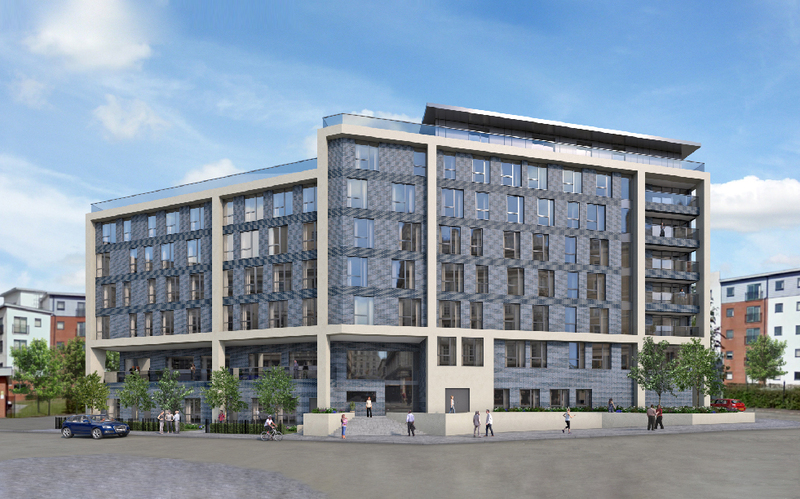 Bowman Riley was commissioned to evaluate the existing building and design the transformation into a boutique five star hotel. 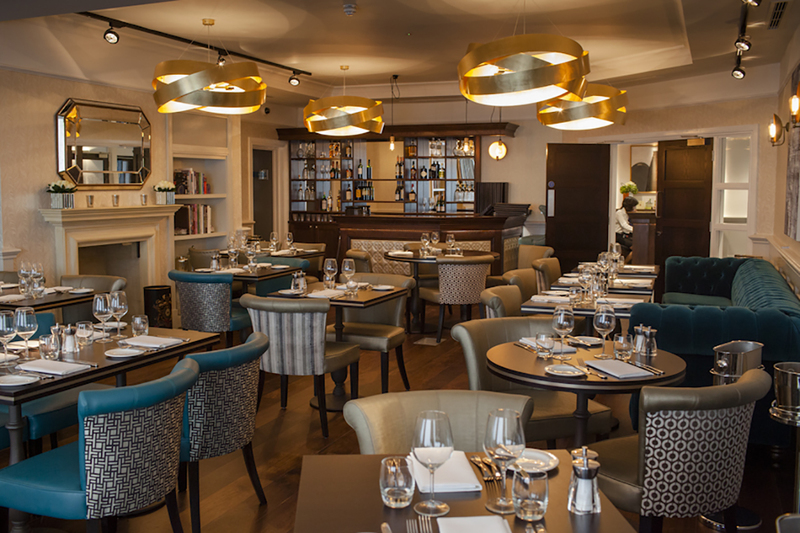 Our design reflects the client’s philosophy to bring together the principles of the great British inn with good food, friendly service and high quality accommodation. 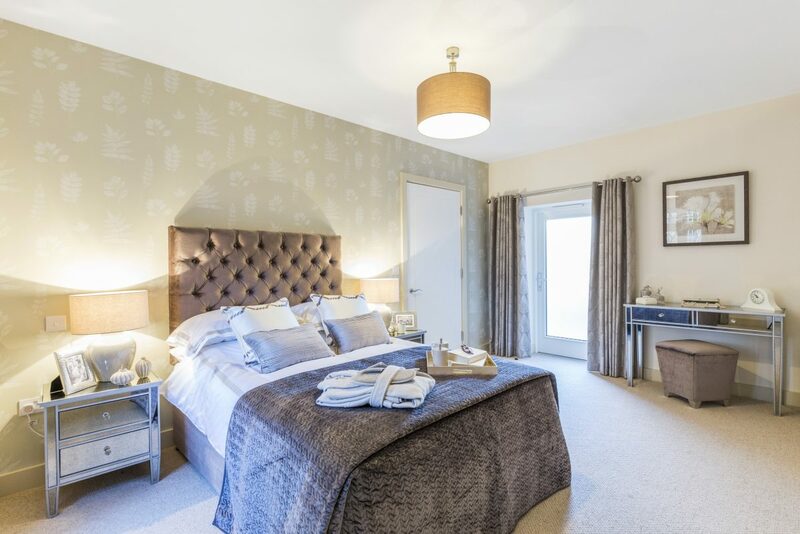 25 of the bedrooms rooms have been individually designed, (eight executive suites), bar, restaurant and function suite. 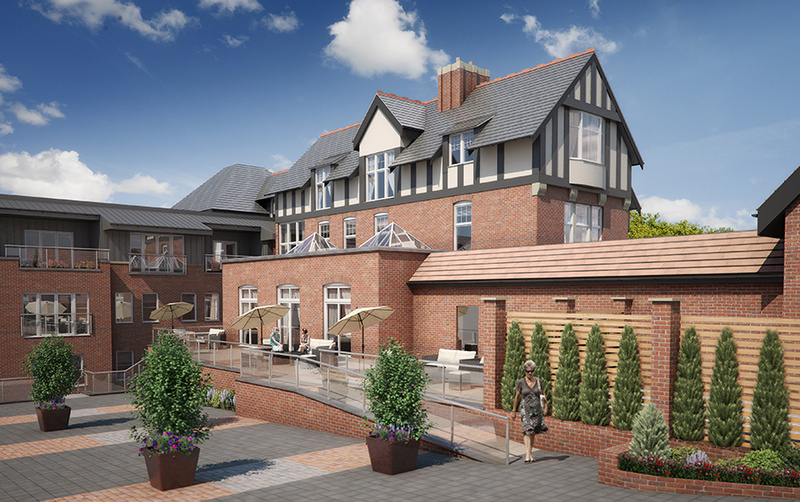 Within the constraints of an incredibly tight urban site, we secured planning consent to demolish the rear half of the hotel and design a new four storey structure (over an extensive new basement), comprising new hotel entrance, lounge, kitchen and en-suite bedrooms. 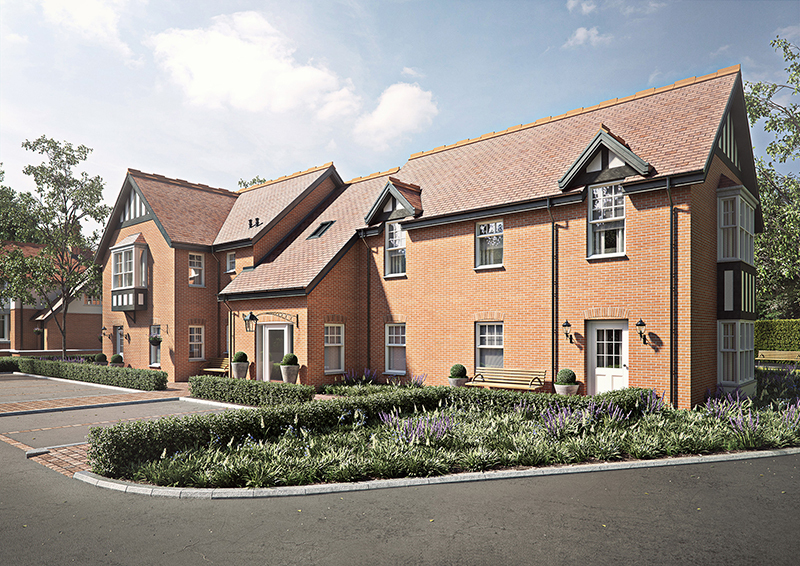 Bowman Riley worked closely with Provenance Inns and the neighbouring property owners to acquire a new private access road to serve the site and provide additional offsite parking for neighbours. 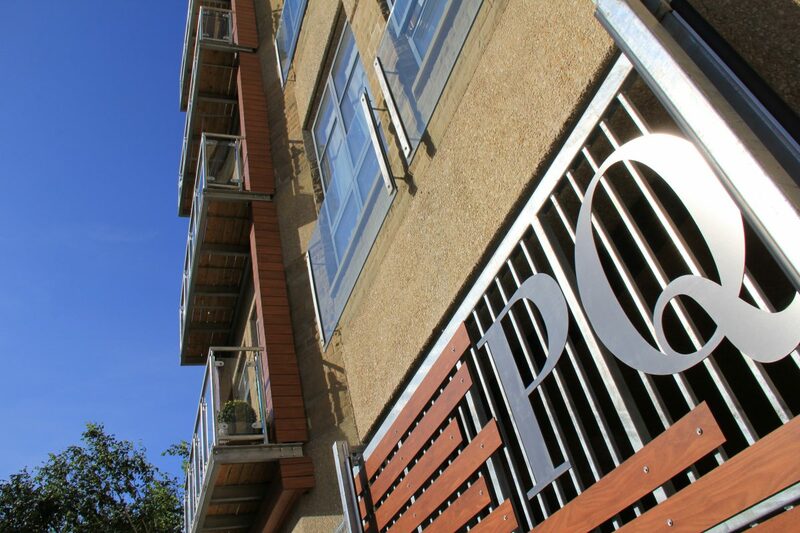 In addition to architecture, Bowman Riley provided party wall surveying and CDM coordination. 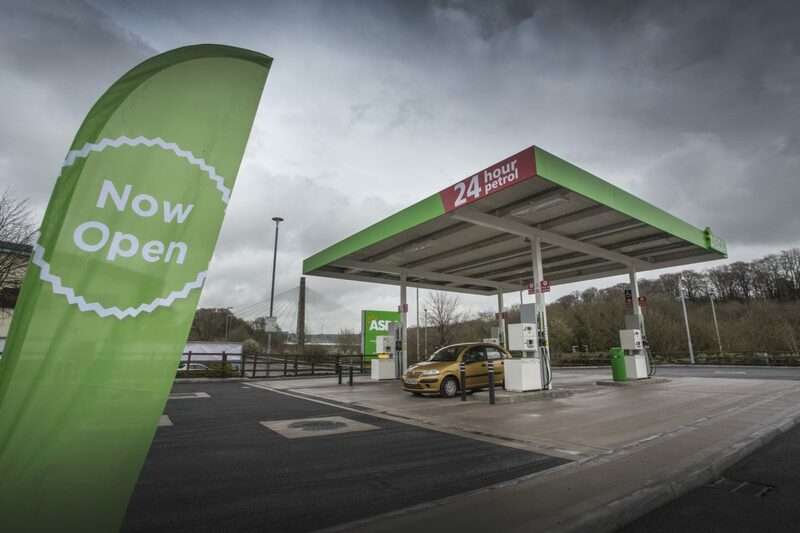 As part of Bowman Riley’s ongoing framework with Asda, we completed a new petrol filling station in the car park of Asda’s superstore in Blackwood. 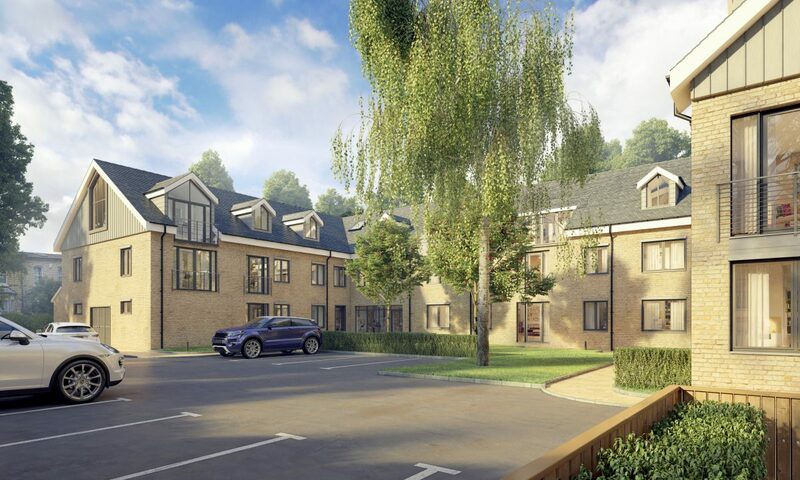 Bowman Riley undertook the design and principal designer roles on the project working alongside main contractor Premier Group, Dudleys, Adept structural engineers and Project Managers, GPS. 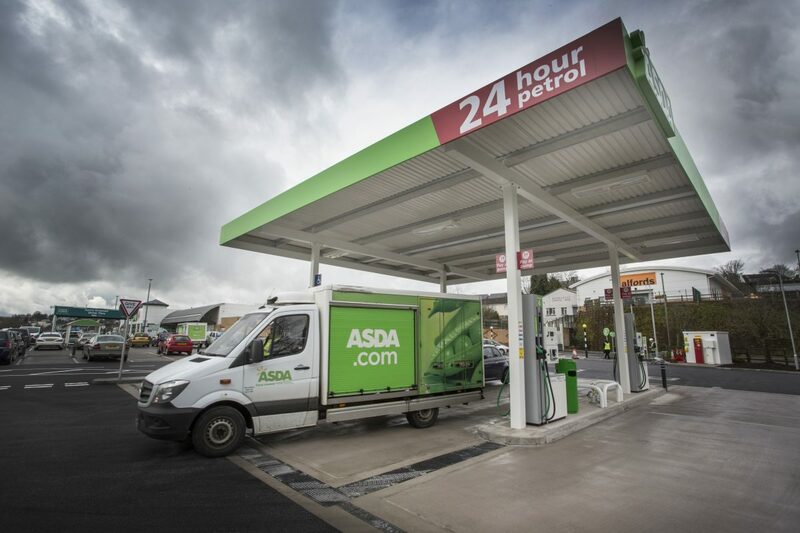 The new petrol filling station houses four pay-at-pump dispensers, two 75,000 litre tanks, canopy, control room, driver controlled delivery unit and totem signage. 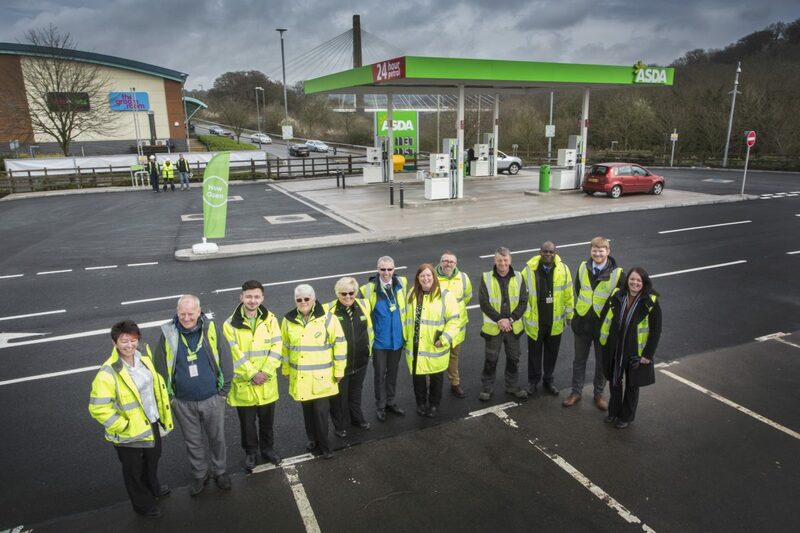 The scheme involved the reconfiguration of the car park to accommodate the petrol filling station. 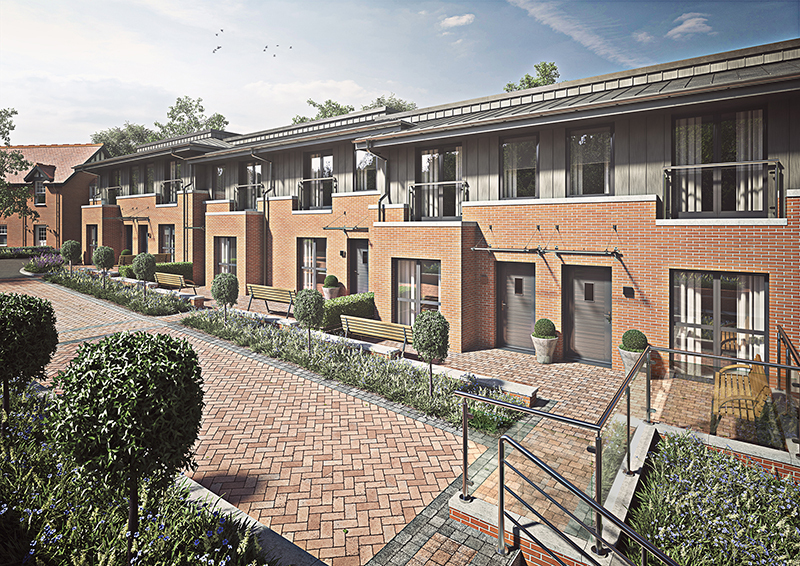 The project is situated on an elevated former landfill site with ground gas contamination and challenging structural requirements. 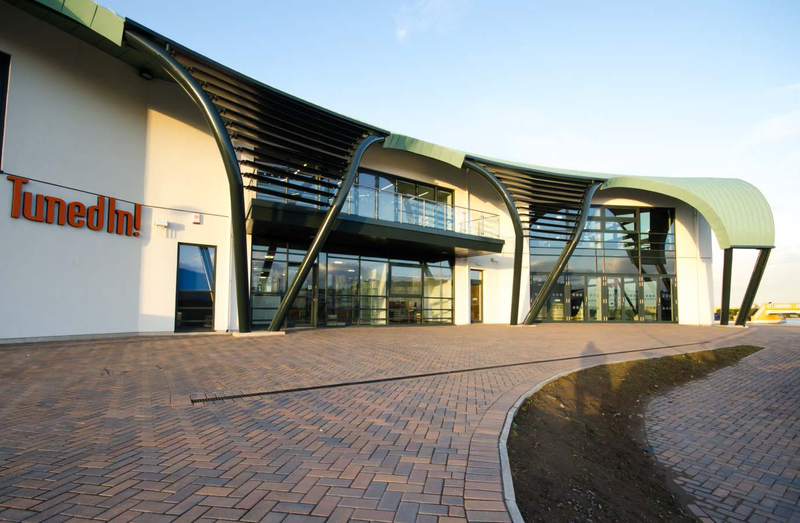 Bowman Riley designed a new hospital entrance and retail building at Milton Keynes University Hospital, a medium-sized district general hospital. 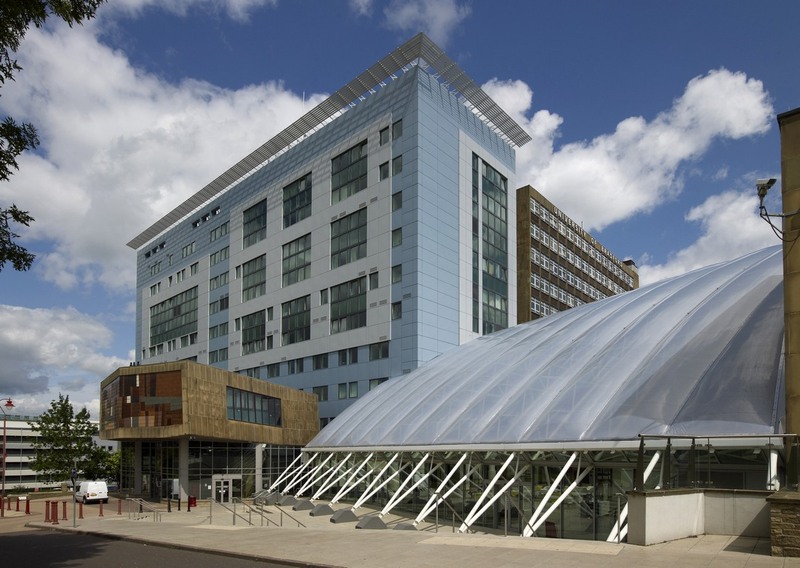 The building accommodates three retail units to be occupied by Amigo, Costa Coffee and Subway for patients, staff and visitors bringing much-needed revenue into the hospital. 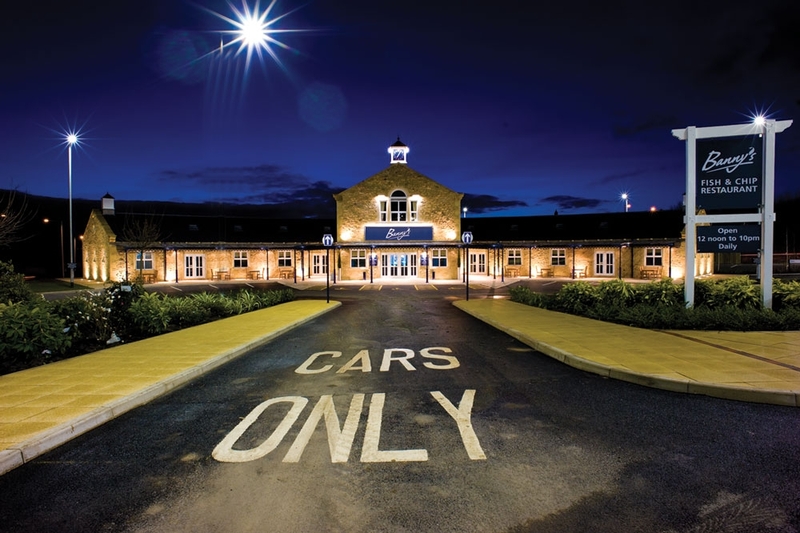 As part of the hospital’s wider redevelopment to upgrade the infrastructure and facilities, the new entrance was designed on a former car park. 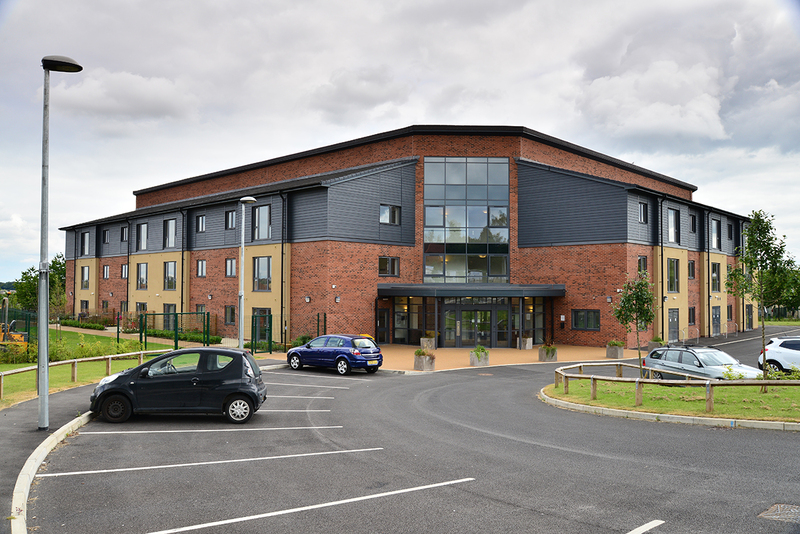 We worked together with the NHS Trust, Compass Group, Catfoss, Kier Construction and the local authority to deliver the 987m² free-standing single-storey entrance building. The South Westerly facing building has brise soleil to provide shading and links building back into the existing the Outpatients, Ear, Nose and Throat, Speech Therapy and Physiotherapy departments. 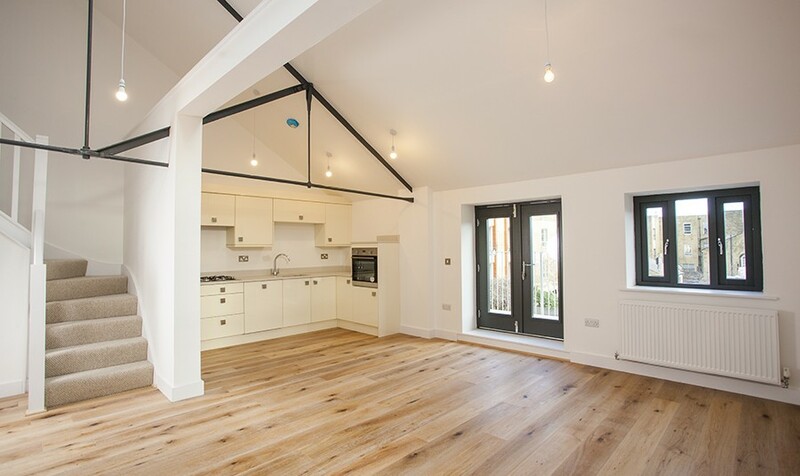 The building was constructed within a controlled environment, which vastly reduced the time spent on site and provided less material waste. 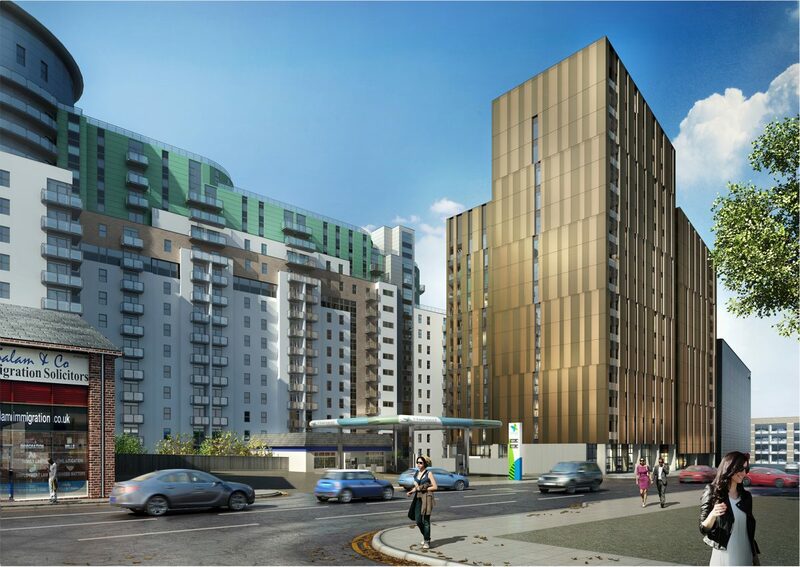 Constructed with a hot-rolled steel chassis, the fabric of the building offers an engineered solution featuring high levels of fire resistance and thermal efficiency. 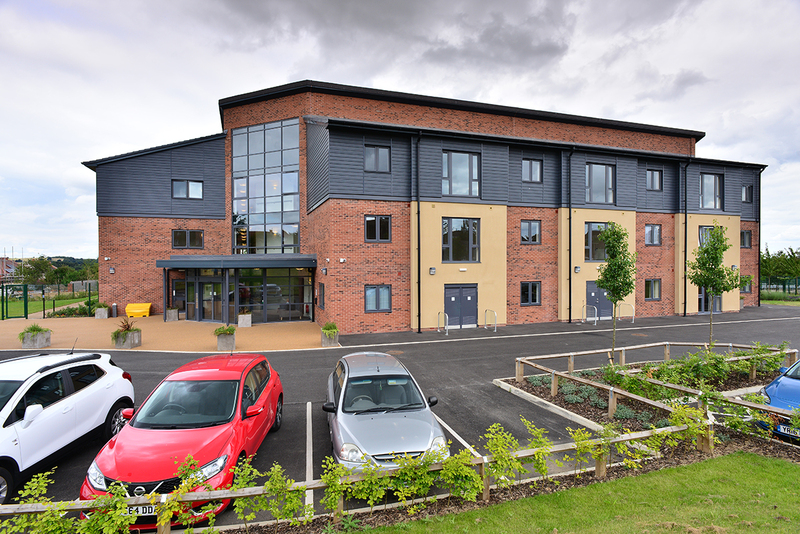 Delivered to the site in 19 modular sections, the building was erected in just three days. The chassis was 15m long x 4m wide, which resulted in challenging transportation and installation. 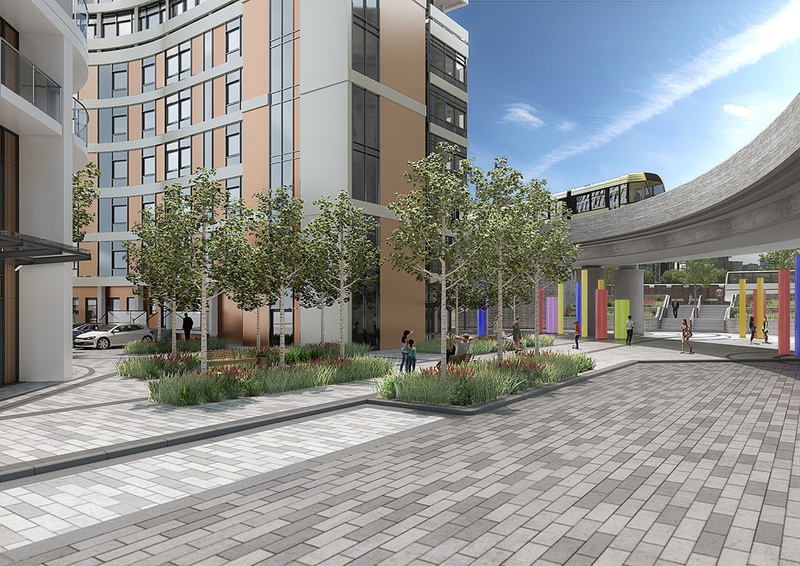 Complex ground conditions included an existing live services tunnel beneath the development. 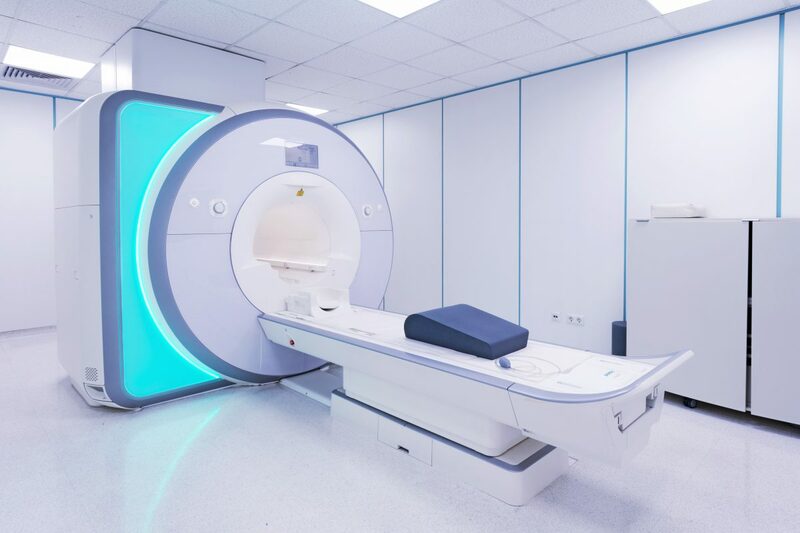 The quick installation time meant that site works were kept to a minimum and air quality conditions were maintained – crucial for a healthcare environment. 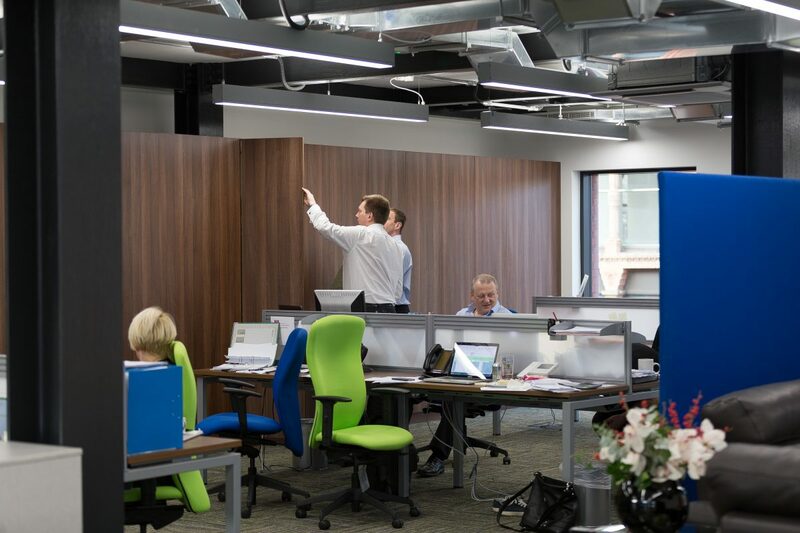 The final fit-out was conducted within 12 weeks keeping disruption to the hospital to an absolute minimum. The Swinton Estate, one of England’s largest privately owned estates, is set within 200 acres, much of which is designated as a Grade II* Registered Historic Park and Garden. 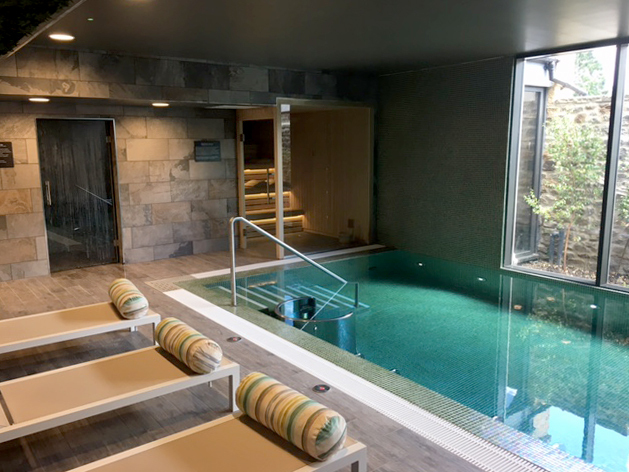 Bowman Riley was commissioned to support the design delivery on site of a new country club and destination spa inspired by the stunning countryside in which it lies. 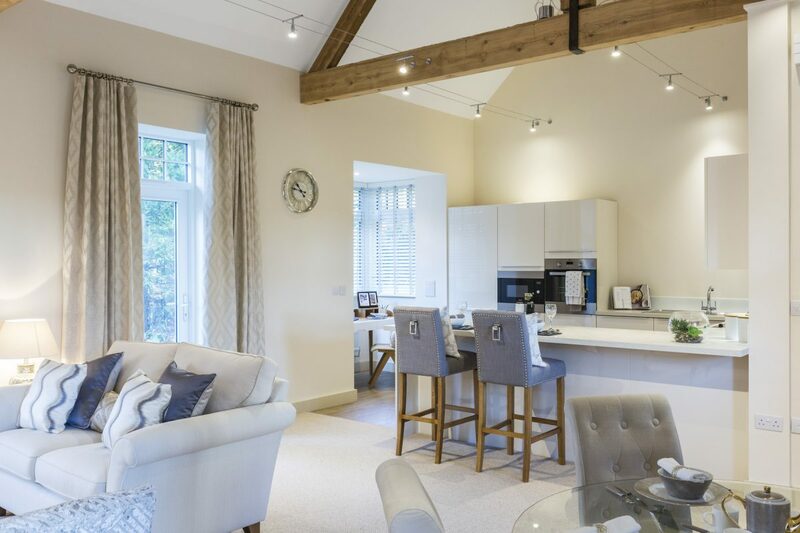 Sitting right in the heart of the estate, adjacent to Grade II listed Swinton Park – a 32-bedroom hotel and cookery school – the design combines both existing estate buildings with new contemporary structures. 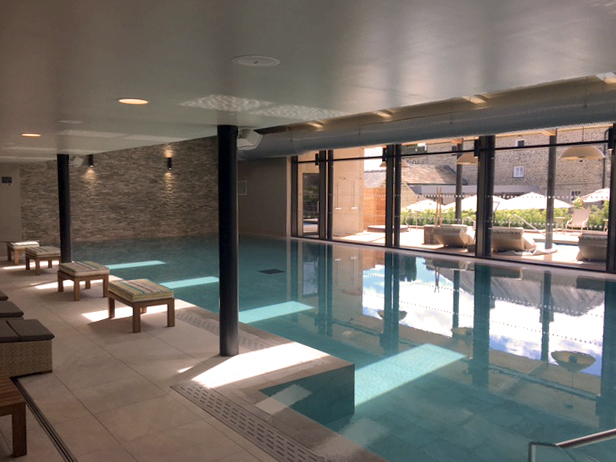 The new spa is home to nine treatment rooms, 18-metre pool, hydrotherapy pool, steam room and sauna. Outside there will be a secluded spa garden with herbal sauna and shower, a cedar hot tub plus a 10-metre natural water swimming pool. 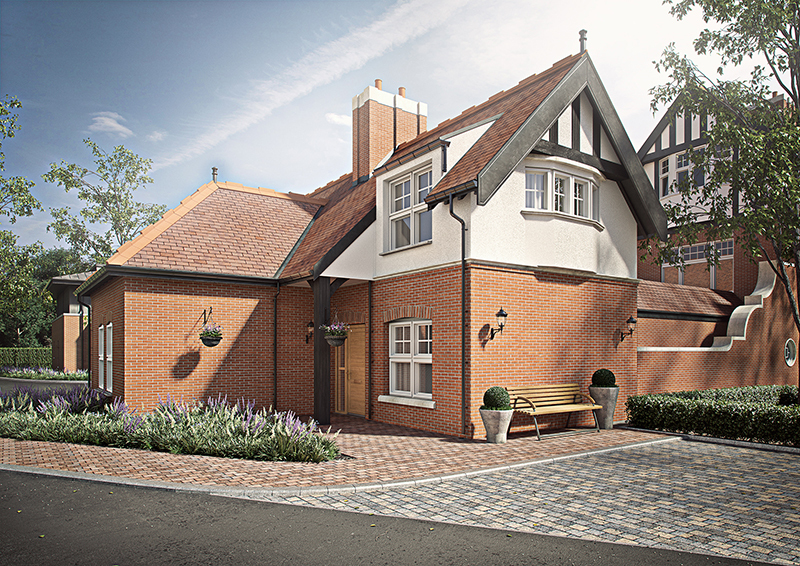 There will also be a beauty cottage in one of the estate’s original buildings and fitness facilities. 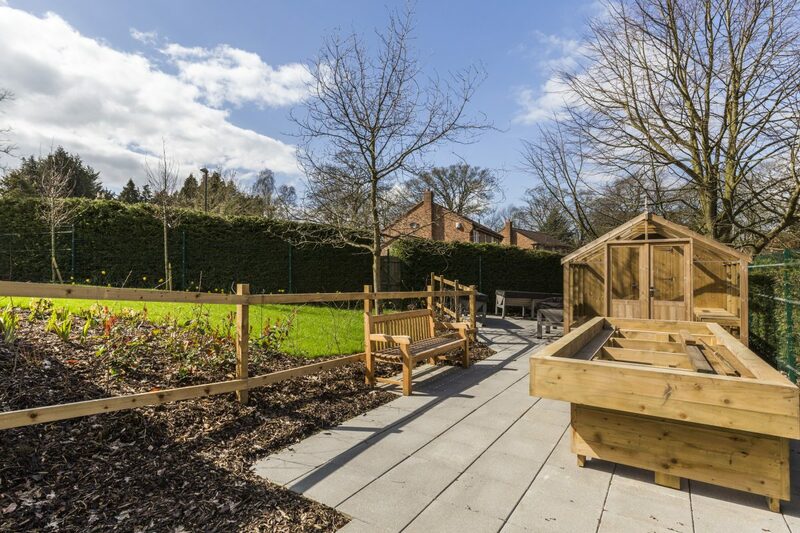 The wider estate has been incorporated into the overall offering with the use of produce from the four-acre walled kitchen garden – the largest hotel kitchen garden in the UK – and using the outdoor space for activities such as walking, hiking, running, cycling or outdoor yoga. 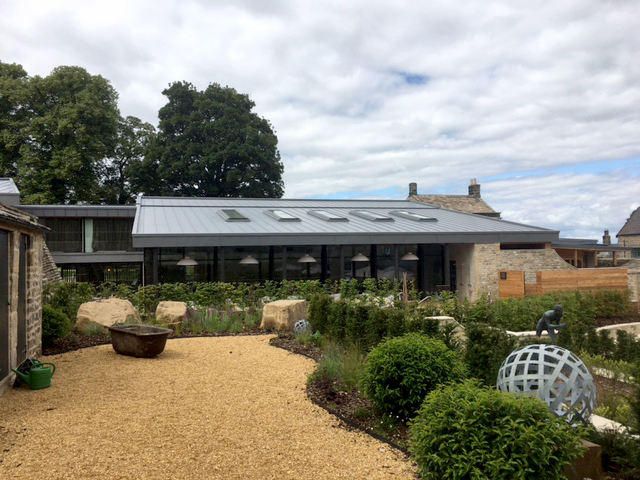 Next to the spa, The Terrace restaurant will serve dishes by Swinton’s Executive Chef Simon Crannage. 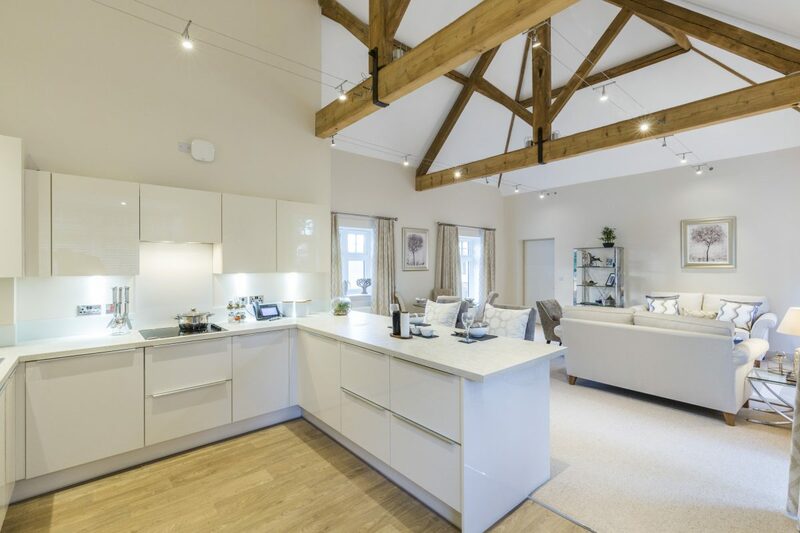 The restaurant, kitchen and lounge are accommodated in a converted and extended joinery shop building, which cleverly brings the outside in with light and airy rooms. 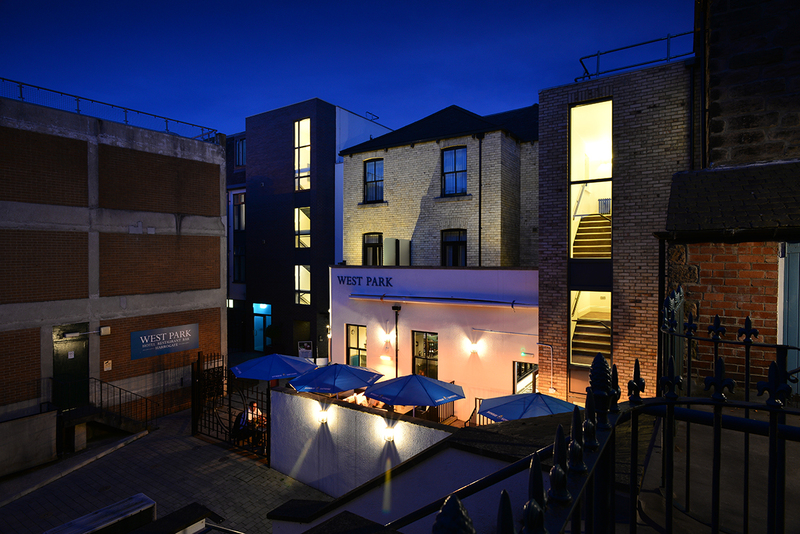 A wood-panelled bar and coffee house adjoins, housed in the former powerhouse, with its own courtyard garden. 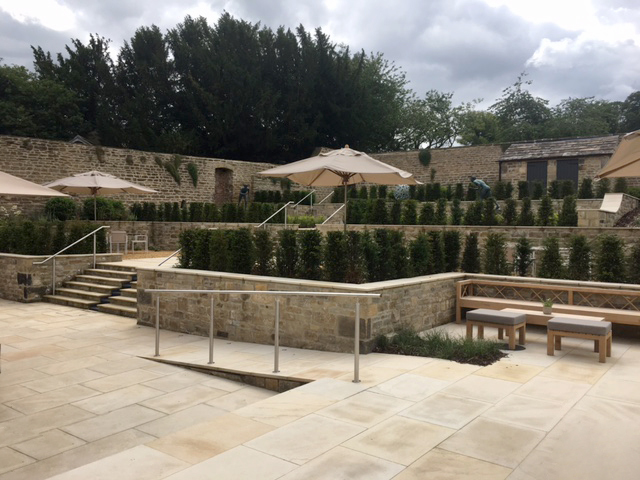 The large terrace garden provides for alfresco dining. 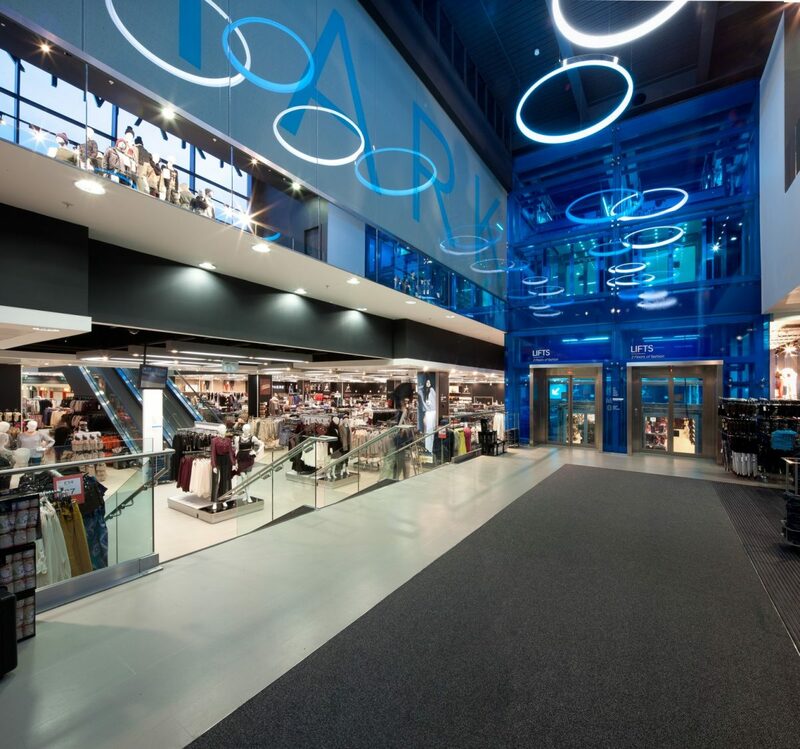 Bowman Riley has been working at The Bridges shopping centre in the city centre of Sunderland since 2006 providing architectural and interior design services working initially for Landsec and subsequently for AEW Europe after they purchased the site in 2014. The shopping centre contains over 100 stores and receives 21 million shopping visits in 2012 and provides employment to 2,000 people. Bowman Riley designed a striking new extension to The Bridges shopping centre in Sunderland city centre as part of a wider £15 million development. 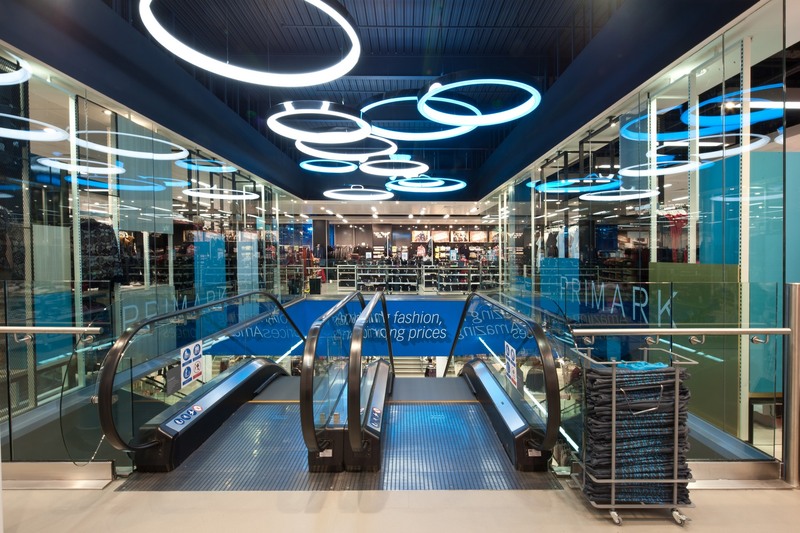 The development’s aim was to enhance the retail experience for The Bridge’s 21 million annual customers by ensuring that the most popular high street brands are located within the shopping centre. 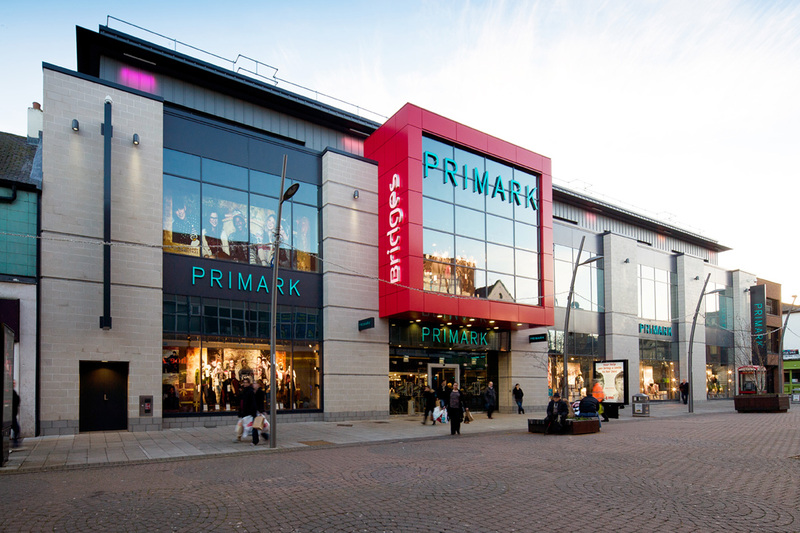 The extension was designed to bring Primark into the shopping centre providing the retailer with larger floor plates not available elsewhere in the city. 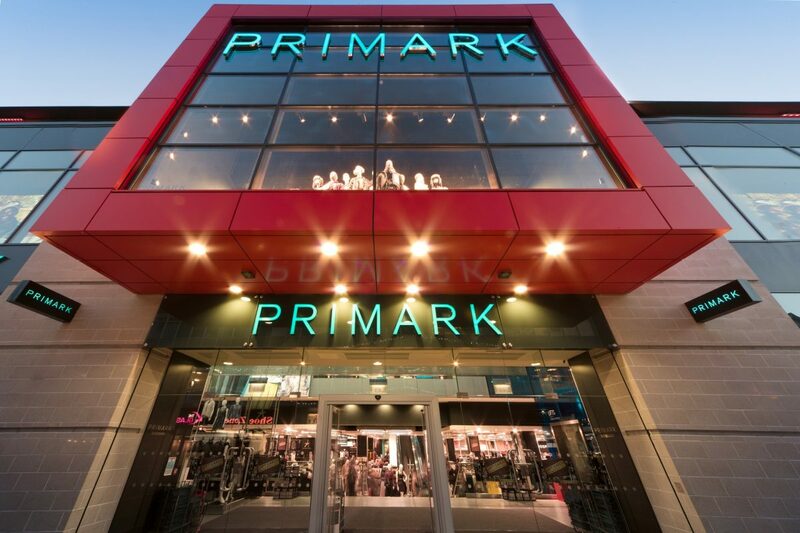 Twice the size of their former Sunderland store at 60,000 ft2 arranged over three-storeys, the new development provides Primark with an enhanced retail space. 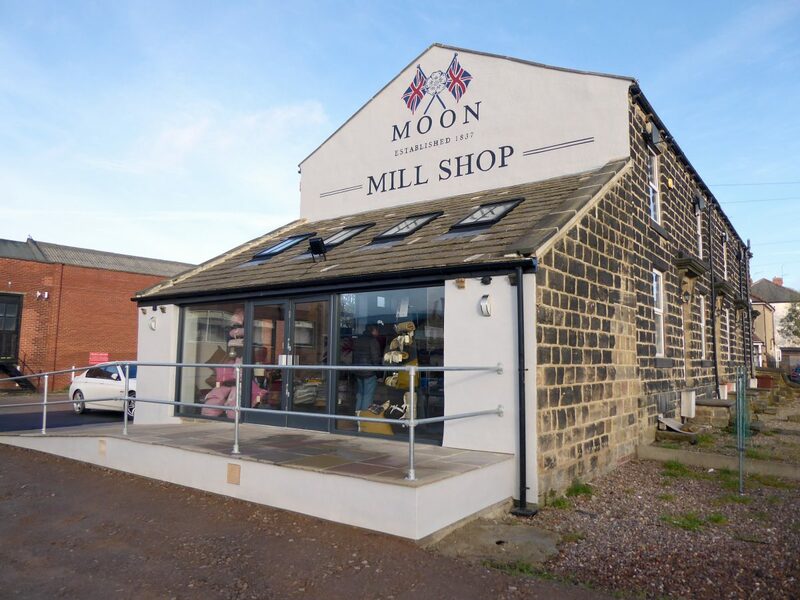 The new store significantly improves the retail opportunities and boosting the local economy with the creation of 150 jobs for local people. 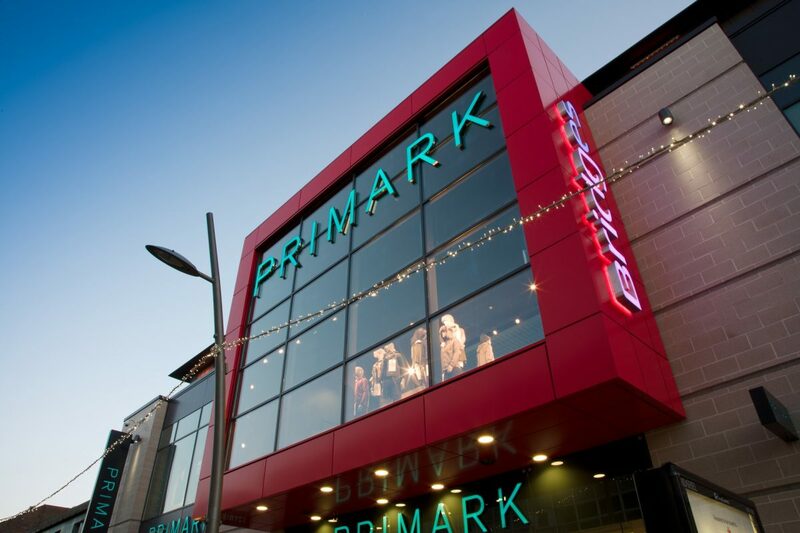 A bold new High Street West entrance was created through the Primark store to replace two 1960s concrete streets of shops updating the streetscape and creating greater footfall for Primark and the Bridges. 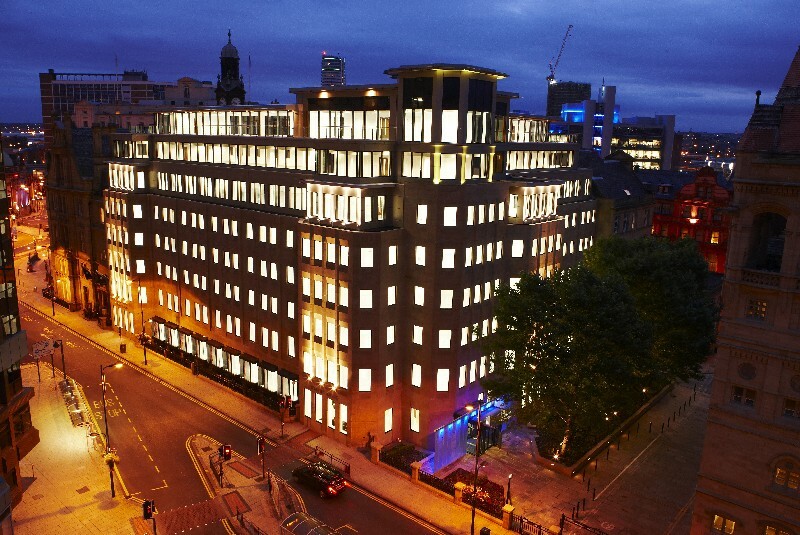 Bowman Riley was involved from the project’s conception through to tender stage for Land Securities and from tender to completion with Morgan Sindall, under a design and build contract. 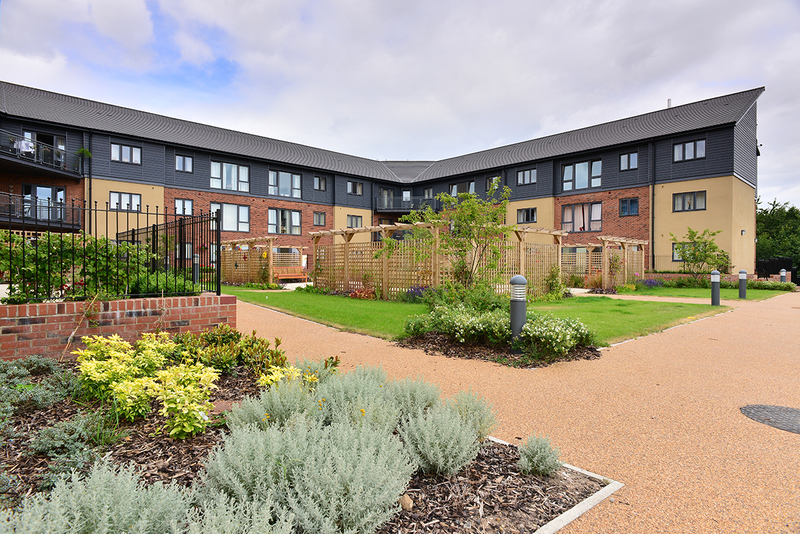 The project achieved a BREEAM rating of Very Good. Following the success of the development, we were appointed to replicate the design across the shopping centre’s three other entrances. 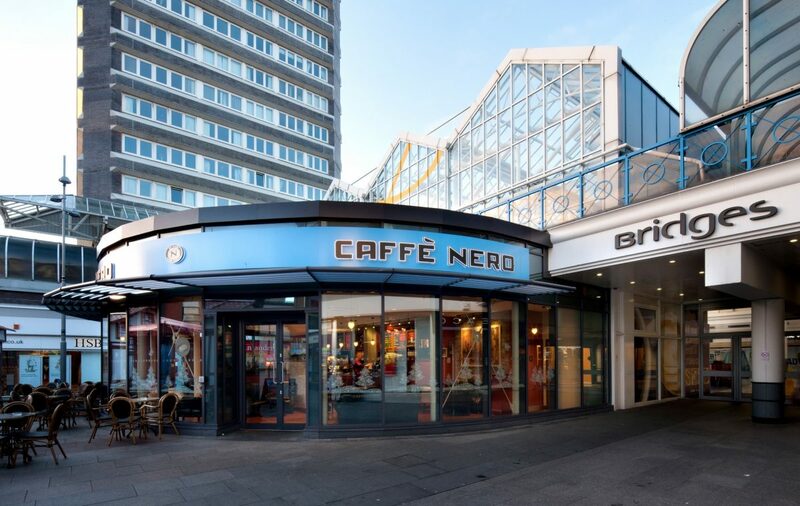 We also designed a new contemporary Café Nero featuring a 180 degree glazed façade. 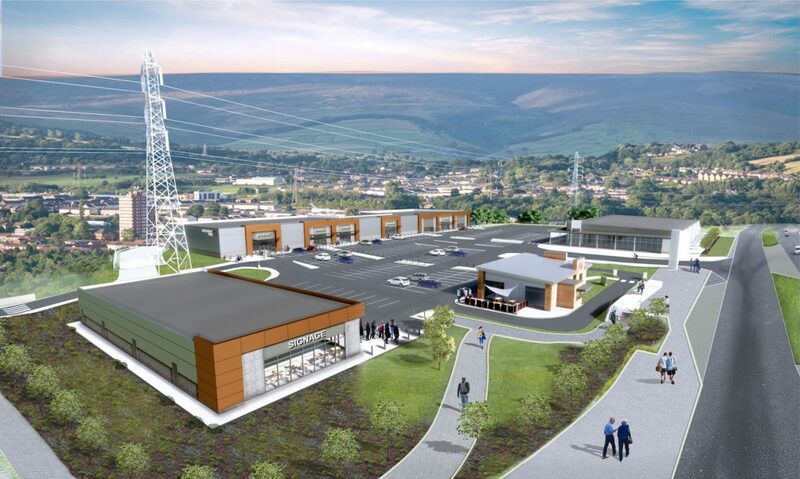 Bowman Riley supported Maple Grove Developments in their bid to Tameside Council to develop a new retail centre in Hattersley, Greater Manchester. 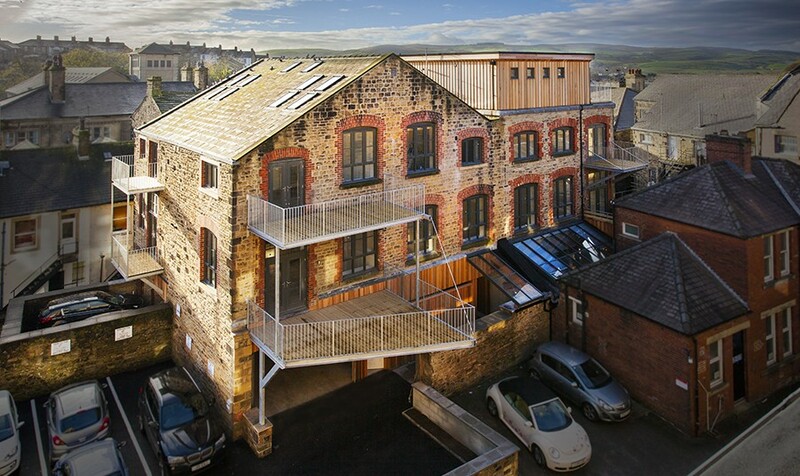 This follows our previous successful projects, Albion Place and No.9 Skipton High Street. 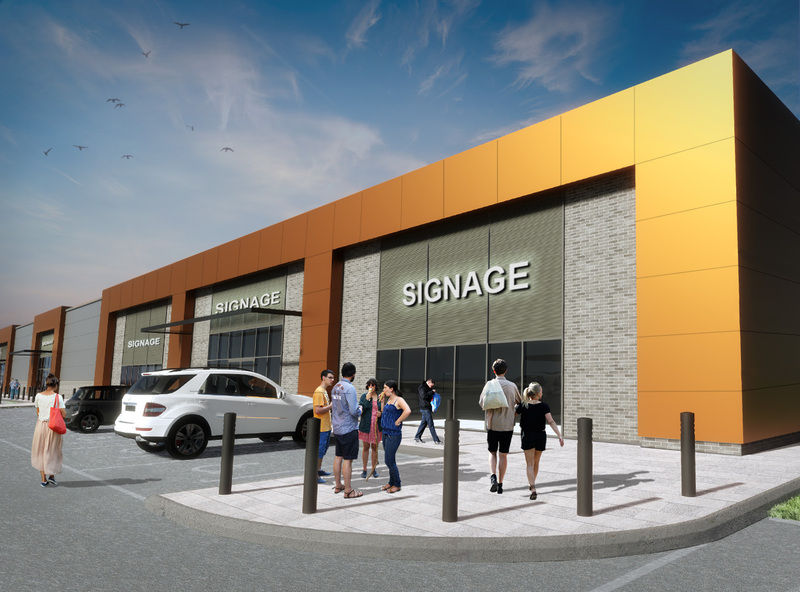 Working closely with Maple Grove, Bowman Riley provided an approach, concept designs and 3D images for the 75,000ft2 retail scheme located on a brownfield site just off the M67 at the junction of Stockport Road and Ashworth Lane. 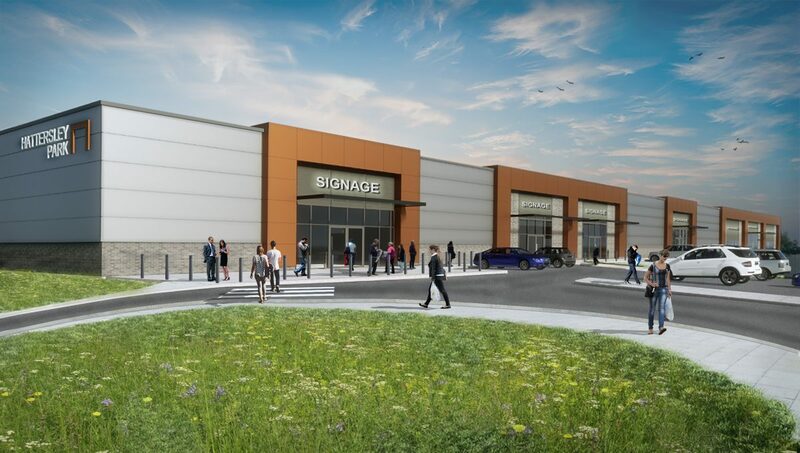 The scheme comprises a mix of units including an anchor store, a drive-through restaurant and retail space. 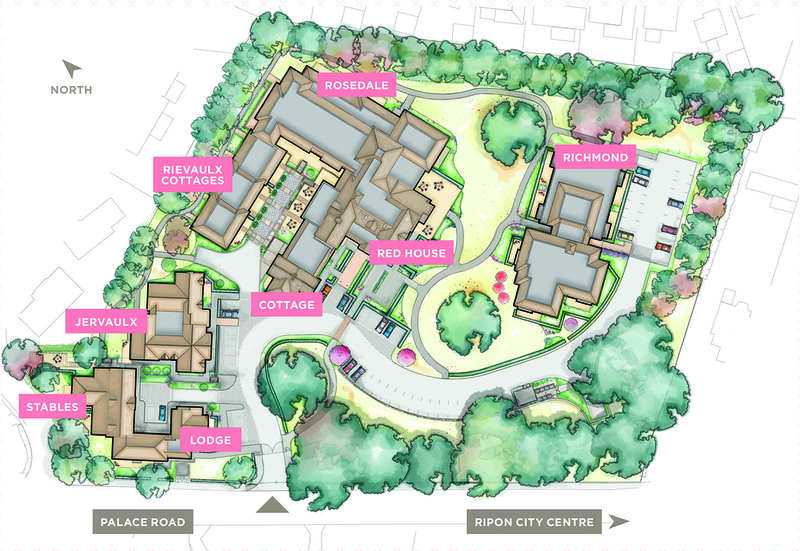 Our site analysis and concept development focused on links with the recently constructed local community hub and supermarket. 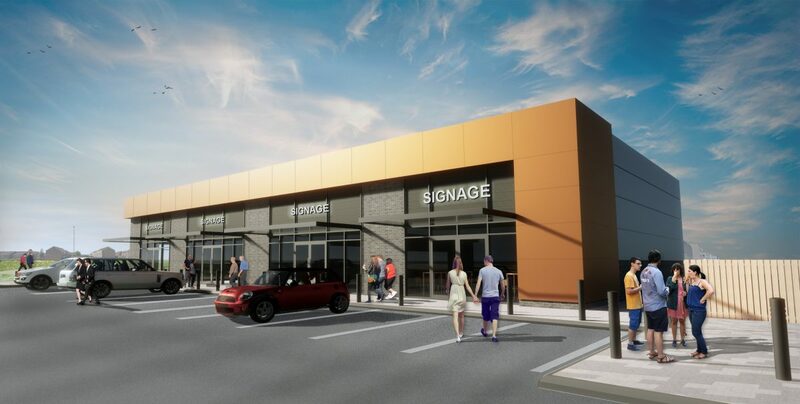 This allowed for smaller retail and drive-through food amenities to be located at the focal point of the junction of Stockport Road whilst maintaining the pedestrian scale and opening the retail centre visibility from the highway. 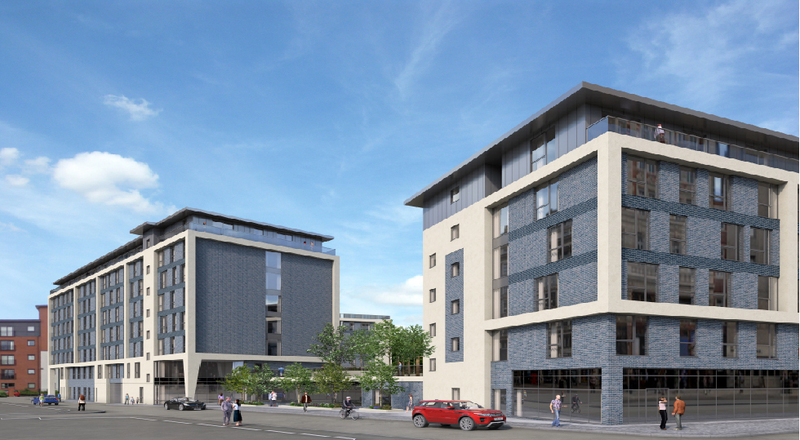 Our proposal offered the best use of the site and was attractive for prospective tenants. 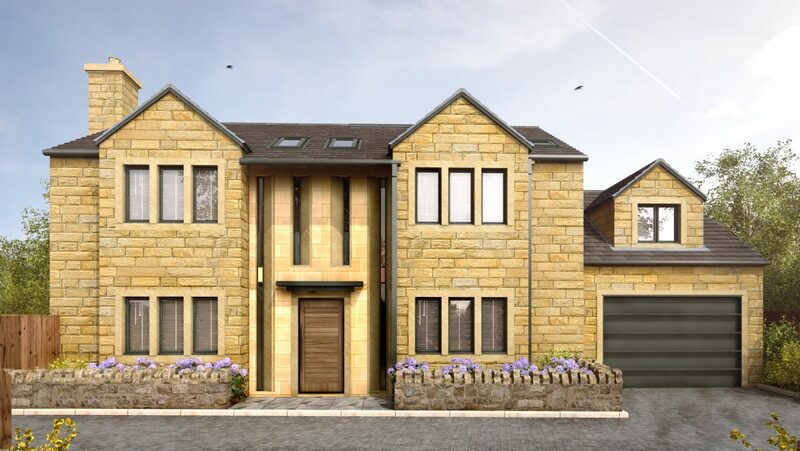 Maple Grove was selected by Peak Valley Housing Association and their partners Tameside Council and the Homes and Communities Agency as their preferred developer to take the scheme forward. 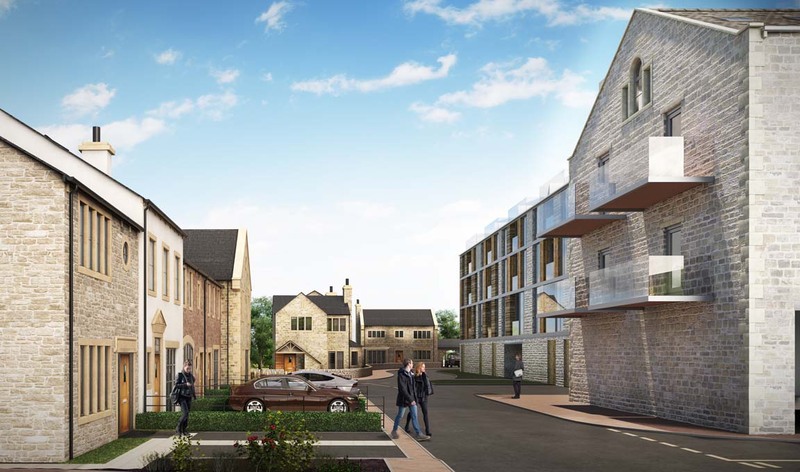 Following the success of the bid, Maple Grove Developments appointed Bowman Riley to follow the design through to completion and provide the role of Principal Designer. 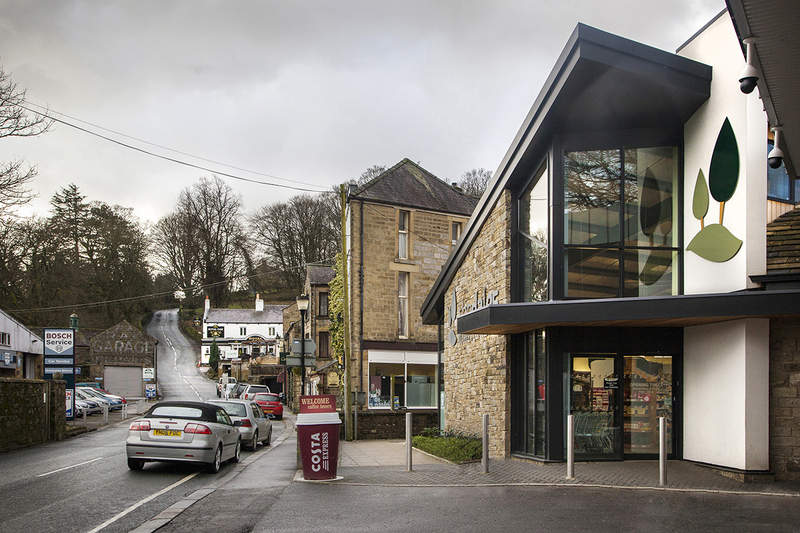 The Dales Market Corner is a uniquely designed, independent convenience store with a petrol filling station in the heart of the scenic market town of Pateley Bridge in Nidderdale, an area of outstanding beauty. 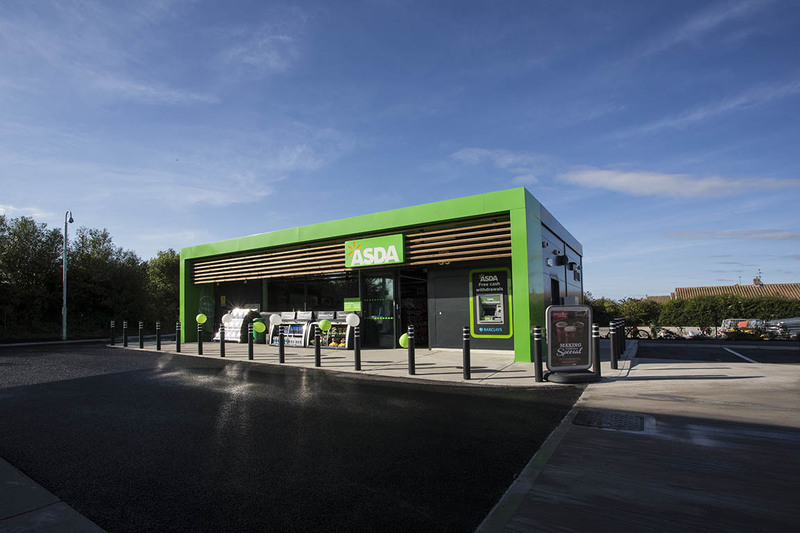 On a brownfield site (formerly a car dealership), a Costcutter kiosk was enlarged, rebranded and reopened as a wholly independent convenience store. 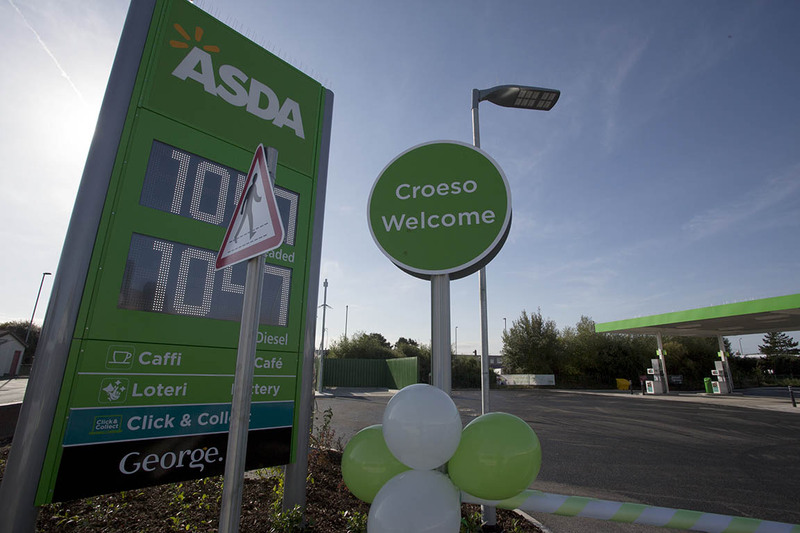 This followed the successful first phase of the development; the refurbishment of the petrol filling station and forecourt. 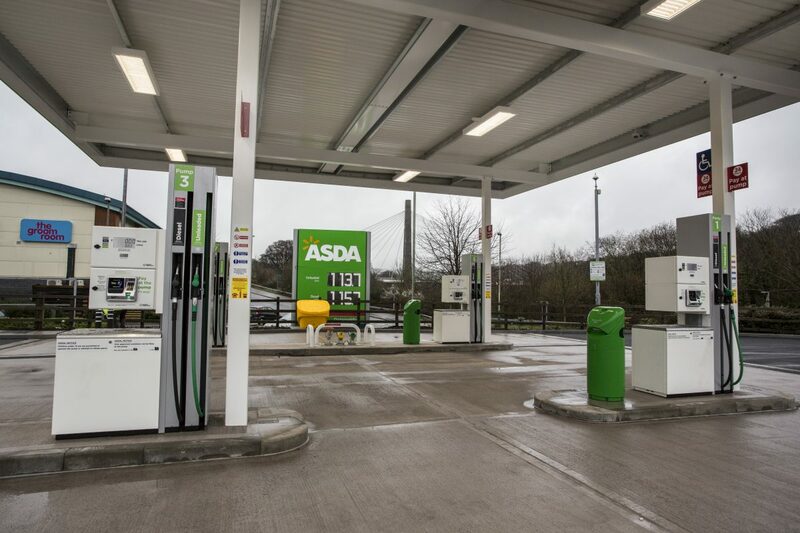 Phase 1 involved the refurbishment of the petrol filling station including a new canopy, forecourt alterations and replacement fuel tanks, pumps and lines in conjunction with a specialist petrol filling station contractor. Phase 2 was the partial demolition and extension to the convenience store building to create a circa 300m² footprint (an increase of 200%). 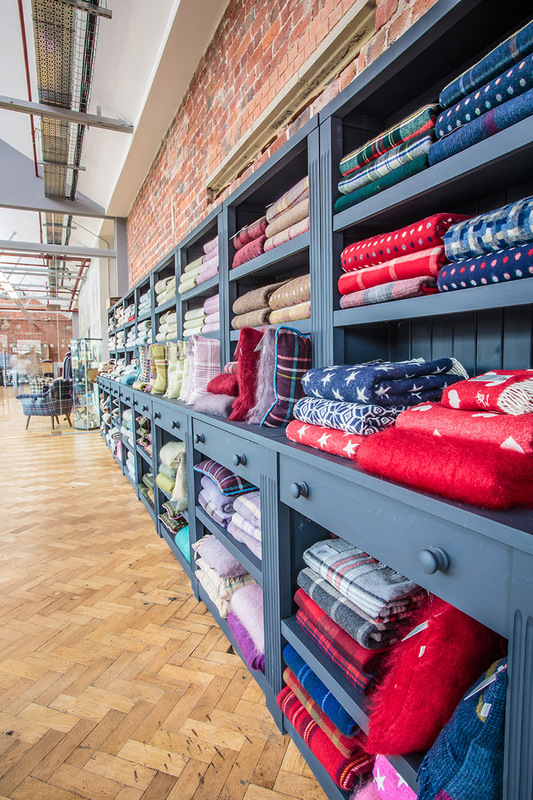 The works were planned to be phased to enable the store to continue to trade with minimal disruption. 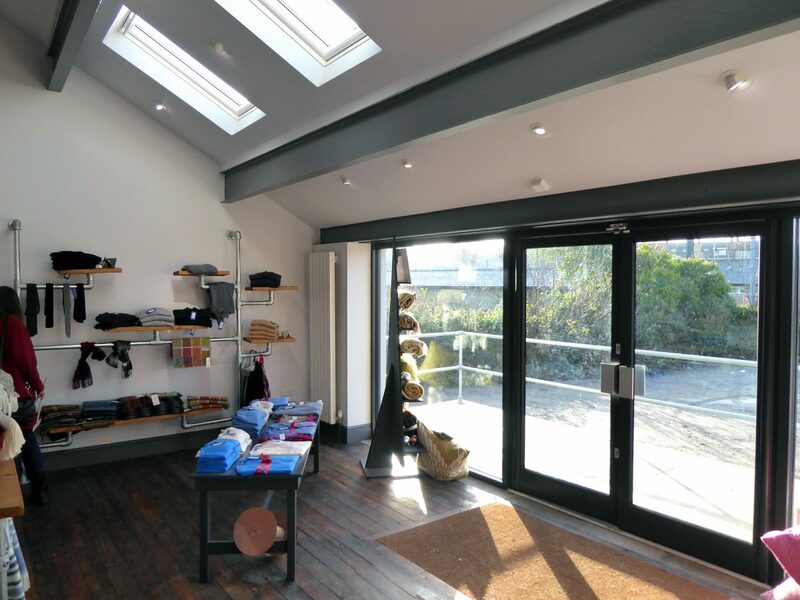 The store is a uniquely five-sided extension seamlessly integrate into the local vernacular with its use of traditional building materials applied in a contemporary form. 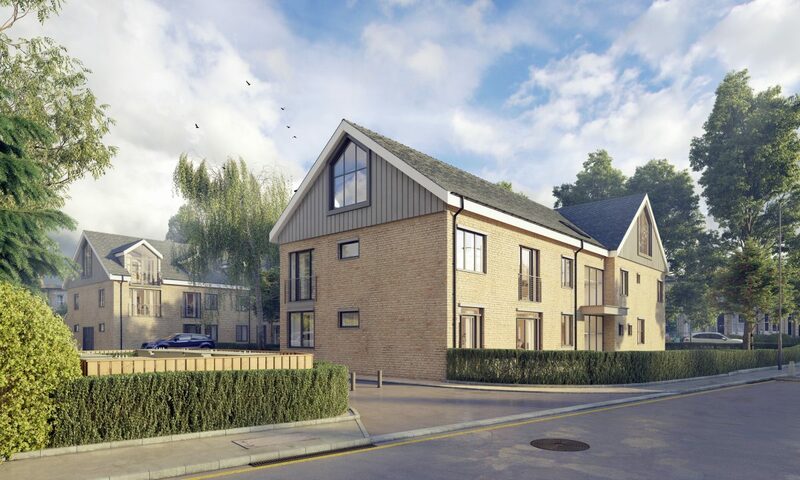 From afar, the angular and split-level roof responds to its unique and varied neighbours both in form and height whilst addressing the client’s need for a single storey building. 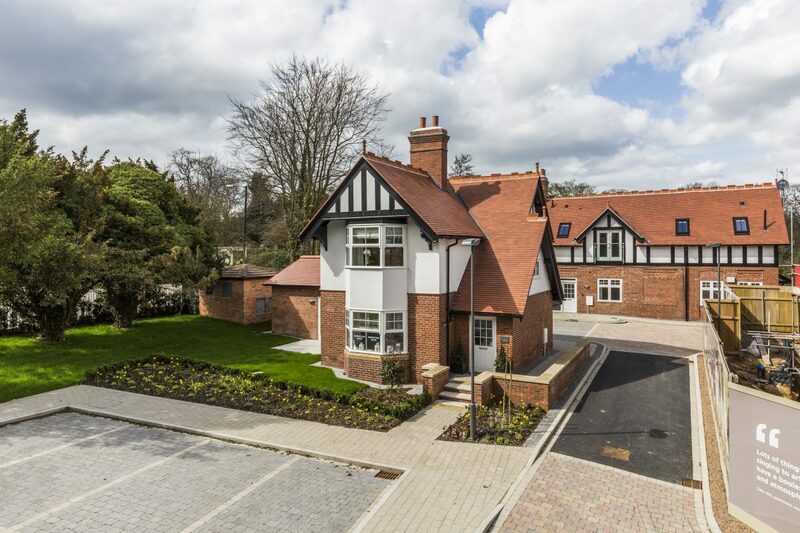 Taking its form from the unusual sized plot, the double-height volume enhances the sense of place and space whilst seamlessly integrating into the original forecourt building. This enabled the store to continue trading throughout and now provides for a logical and considered building. 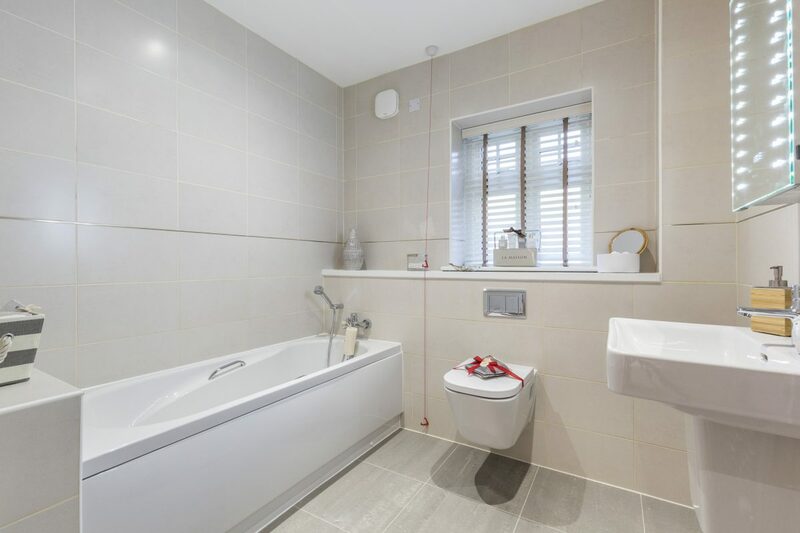 Daylight floods what would otherwise be a typically artificially lit space, thanks to a quirky interpretation of the local dry stone walls and the relationship to contemporary glazing arrangements. 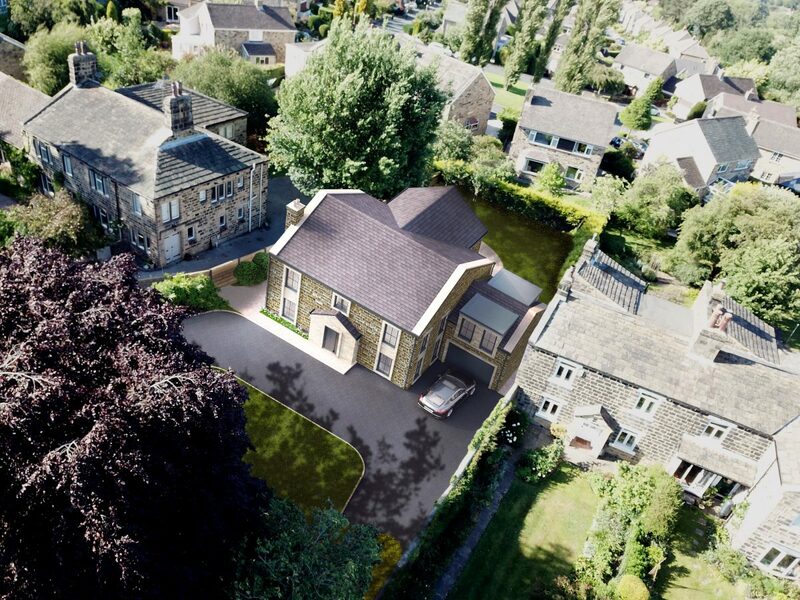 This bespoke development responds specifically to the needs of the local community and makes a positive contribution to the public realm and is a valuable asset to the community, who had to travel as far as Harrogate to buy groceries. 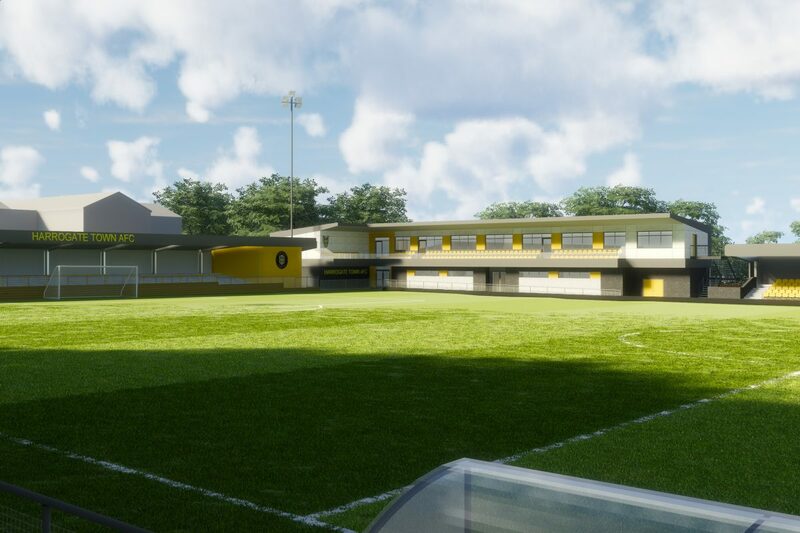 Semi-professional Harrogate Town AFC needs to significantly redevelop its Wetherby Road ground by adding new facilities and almost doubling capacity to support the club’s aim of securing promotion to the Football League. 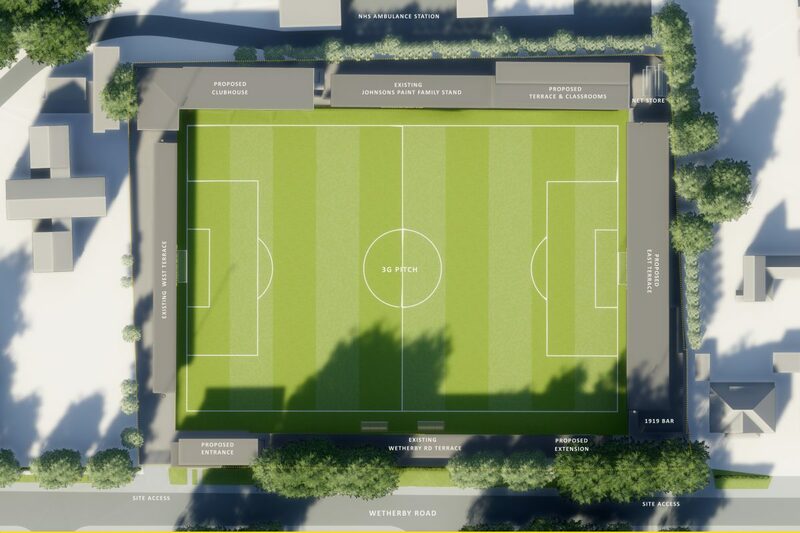 Bowman Riley’s design includes upgrading its player and spectator facilities in four phases to aid the club’s continued success and growth. Their facilities and capacity needed to increase from 2,800 to over 5,000 to meet the ground criteria of higher football leagues. 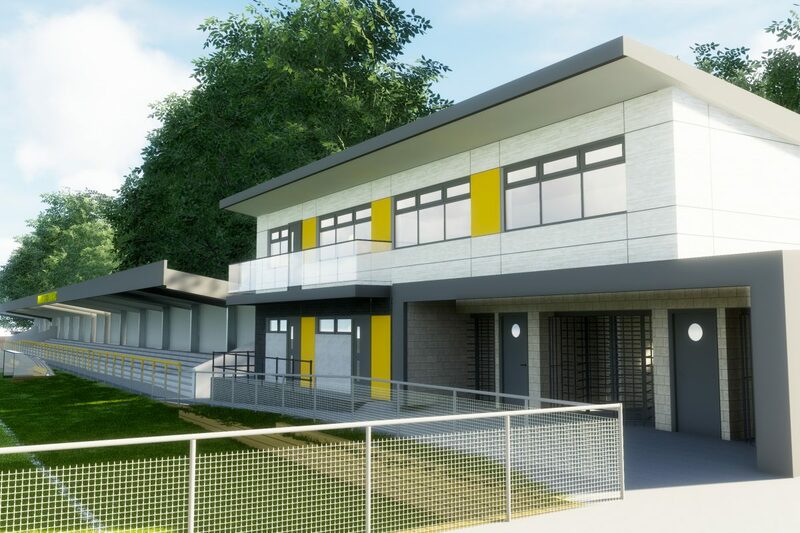 Proposals included a new two-storey clubhouse, seated terraces, an office building, classrooms to be used as community facilities and a new, improved floodlighting solution. 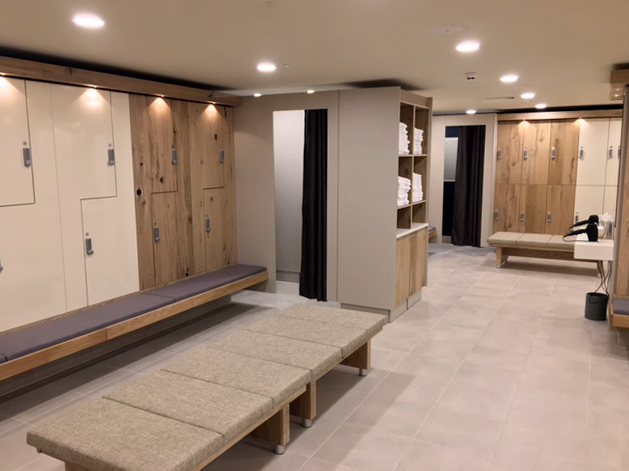 The first phase comprised a new two-storey clubhouse offering modern changing facilities at pitch level in a striking new building. The first floor provides a hospitality space with external elevated terrace seating for 128 spectators overlooking the pitch. The location of the new clubhouse allowed construction while maintaining use of the existing facilities. The second phase provides a new face for the club to strengthen its existing presence. We replaced the existing entrance structure to include improved turnstile access, ground floor ticket area and staff offices. 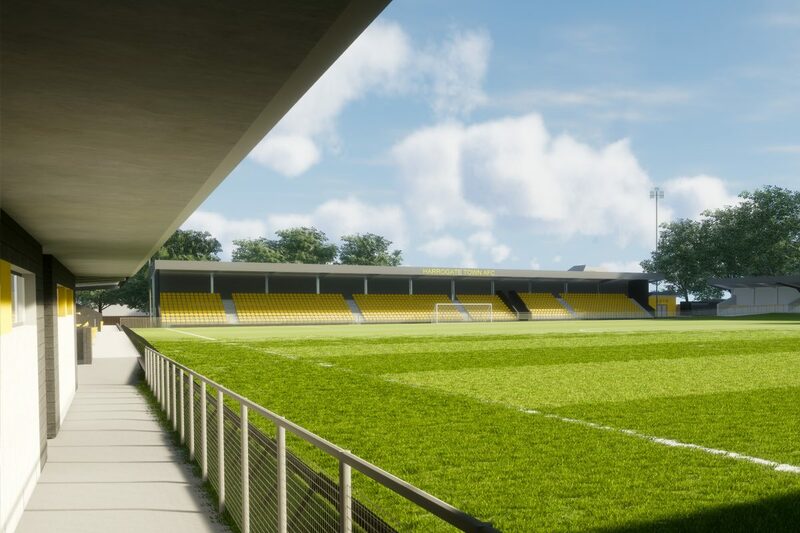 Following demolition of the former hospitality area, a new terrace will be introduced in 2020 to increase seating capacity under cover of a projected roof. 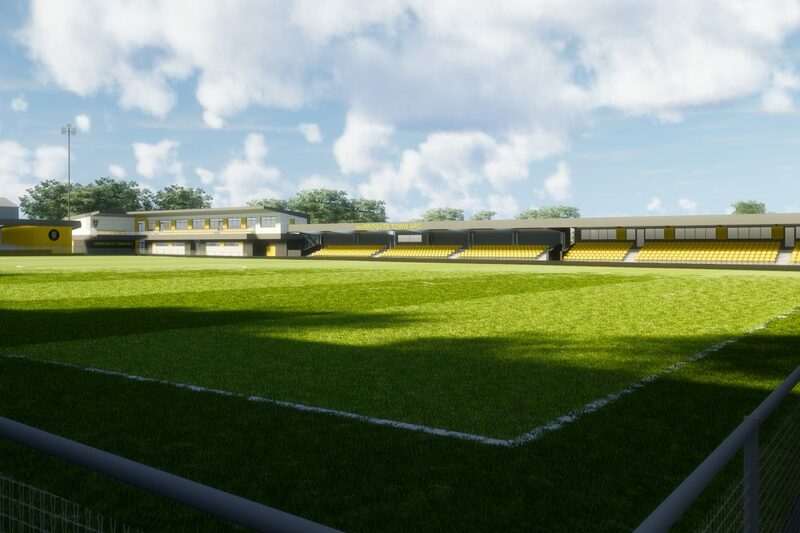 The final phase in 2021 – 2023 will ensure that the stadium is eligible for entry into the English Football League. This sees the construction of a new terrace to bring capacity of the stadium to 5000. 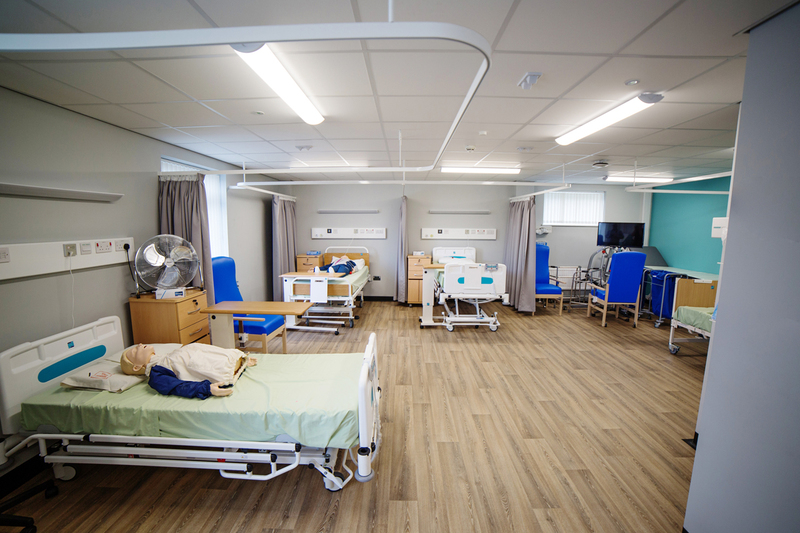 Bowman Riley designed and managed The Oakwell Centre, a new School of Nursing at the Dewsbury and District Hospital under the framework agreement with the University of Bradford. 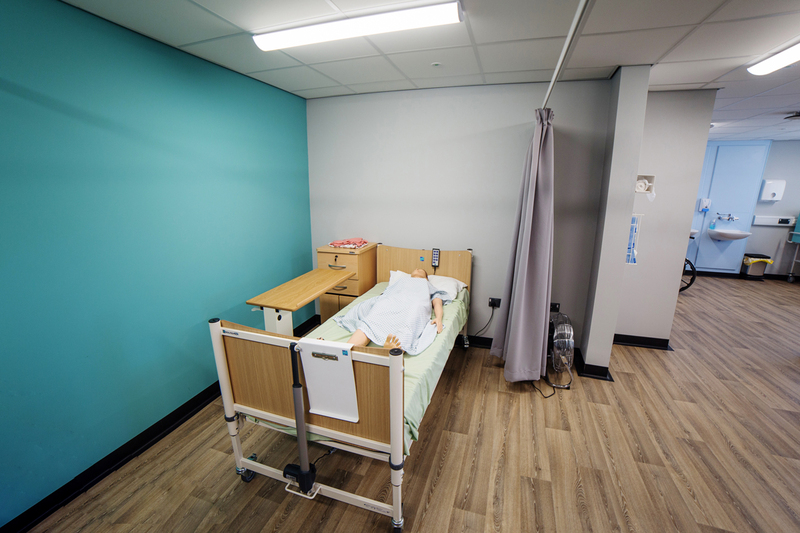 Mid Yorkshire Hospitals Trust identified the need to offer a locally based degree programme to attract student nurses that may not otherwise apply to a University nursing course outside of the district. With this in mind, the Trust approached the University to deliver a satellite nursing degree programme at Dewsbury and District Hospital. 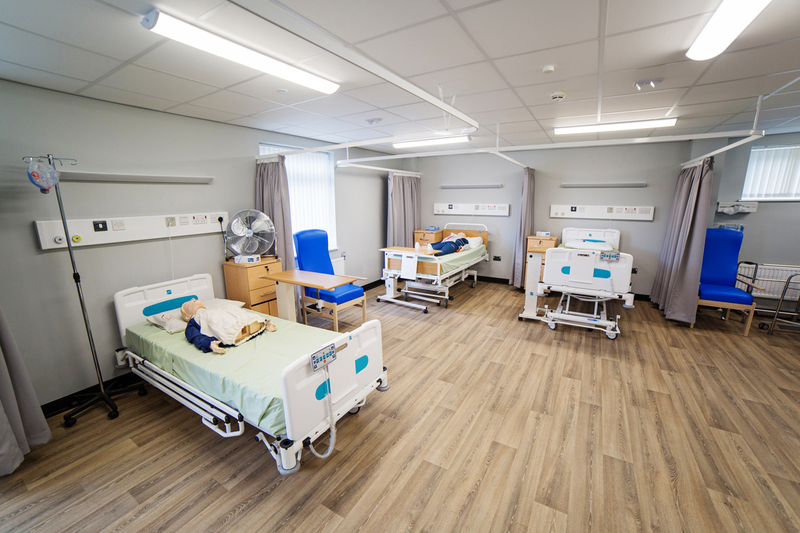 The objective was to create an on-site learning facility that will allow for up to 80 trainee nurses to learn whilst gaining practical hospital experience. 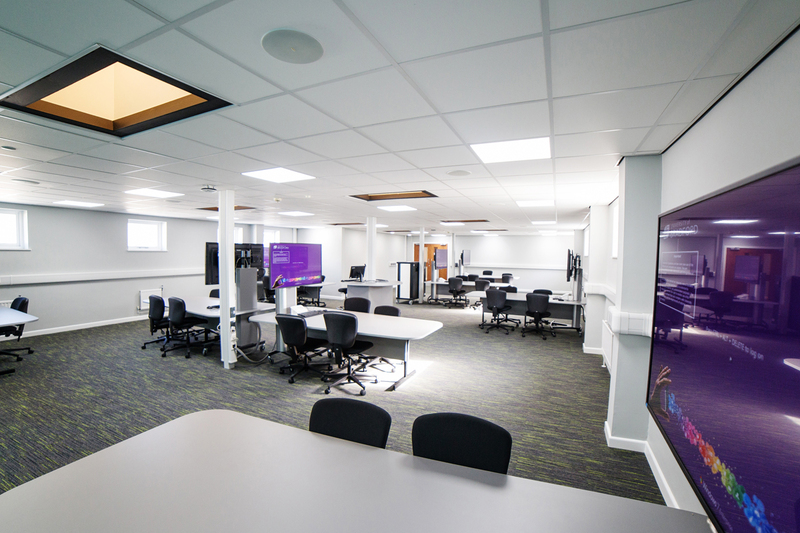 The project involved the refurbishment and reconfiguration of a 460m2 flat-roofed building constructed in 1960 that had been used as a training and archive facility and had not been extensively refurbished for forty. 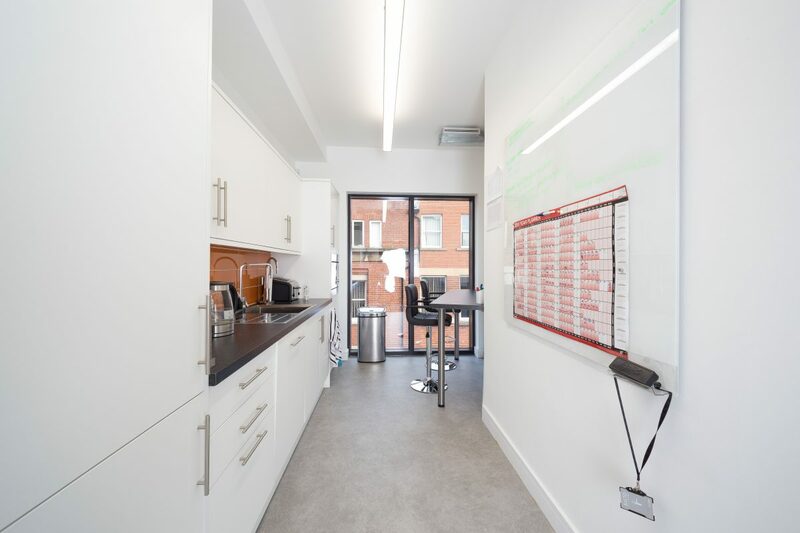 We undertook a space planning exercise to make sure the spaces meet the needs of the users and to create the best use of the available space. 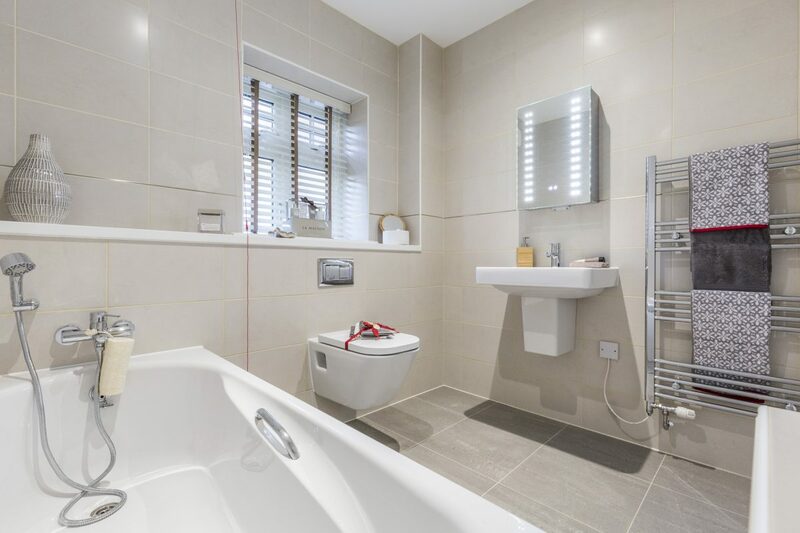 We specified and arranged the installation of all finishes and fittings. 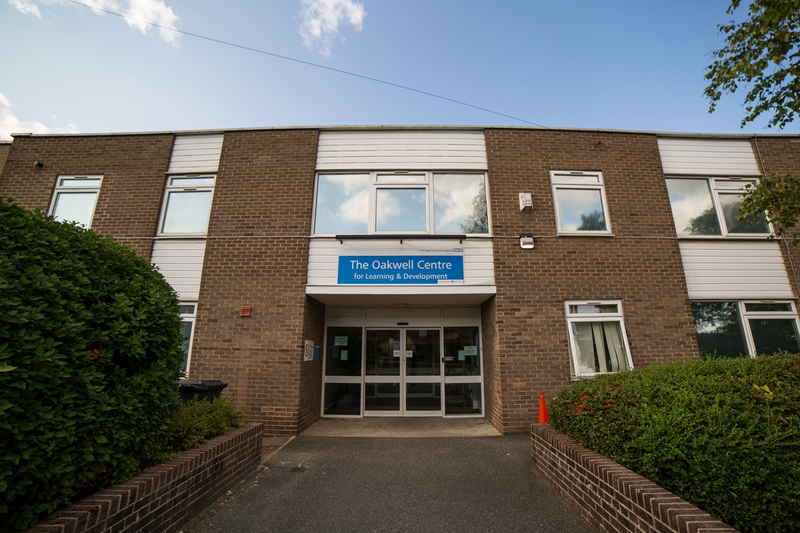 The Oakwell Centre was completed within the client’s target timescales in preparation for the intake of students in the new academic year and opened by Professor Jane Cummings, Chief Nursing Officer for England. 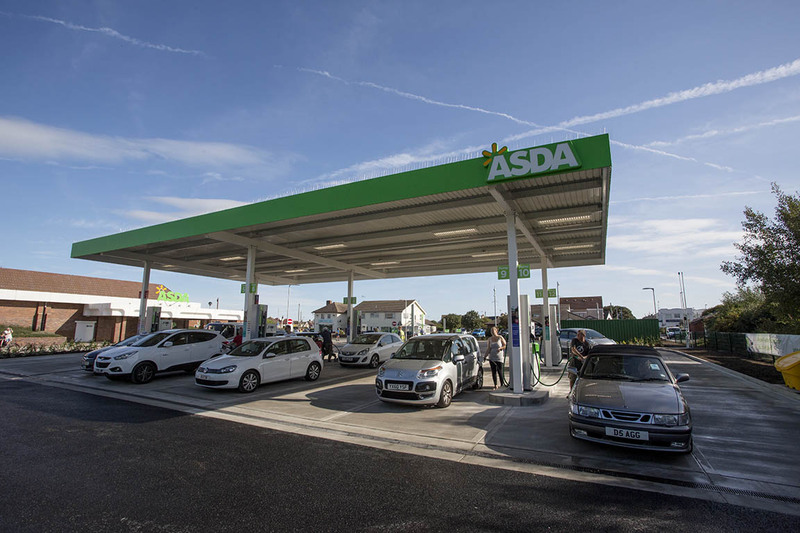 As part of our ongoing framework agreement with Asda, Bowman Riley was commissioned to take over the design and delivery of a new petrol filling station in Rhyl from another architectural practice. 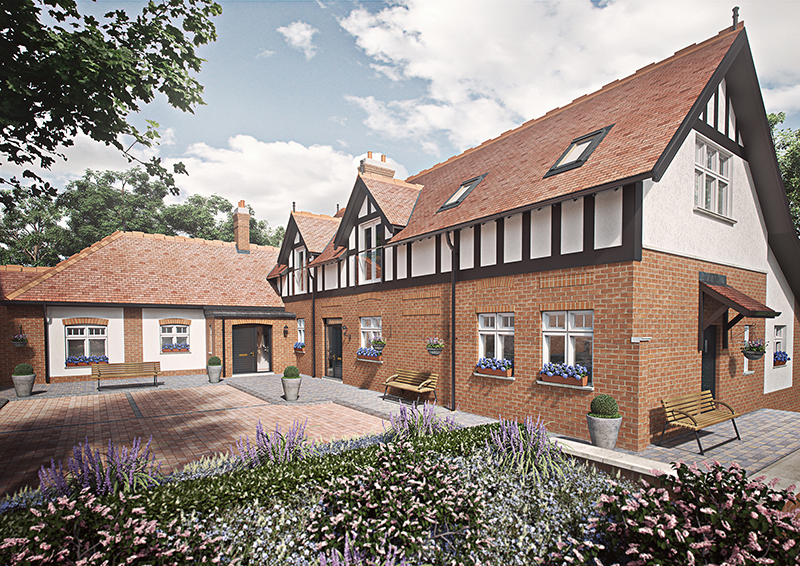 With only two weeks before start on site, it was critical to appraise the design quickly and produce construction detailed drawings to ensure the smooth delivery of the project. 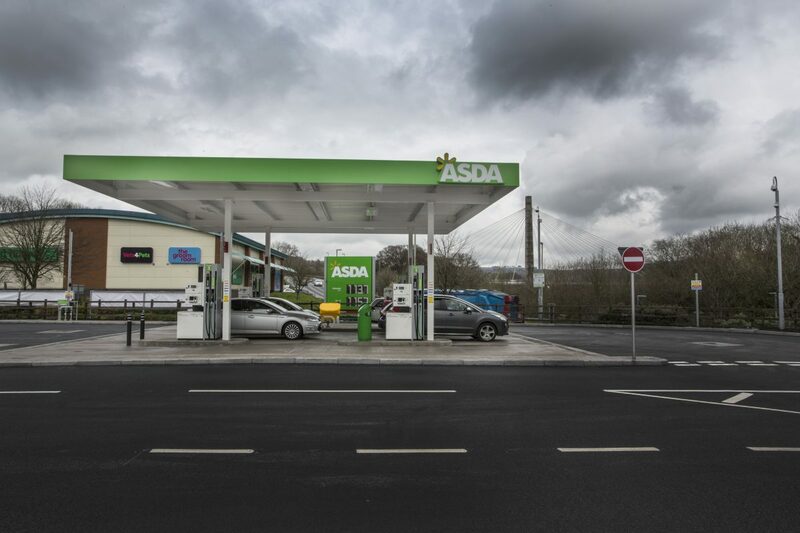 Sited next to an adjacent to an existing Asda superstore, the new petrol filling station was previously occupied by a single two storey ommercial building. The facility is a six pump station with two new 75,000 litre underground storage tanks, canopy, kiosk, dual jet wash bays together with a vacuum/air/water bay. 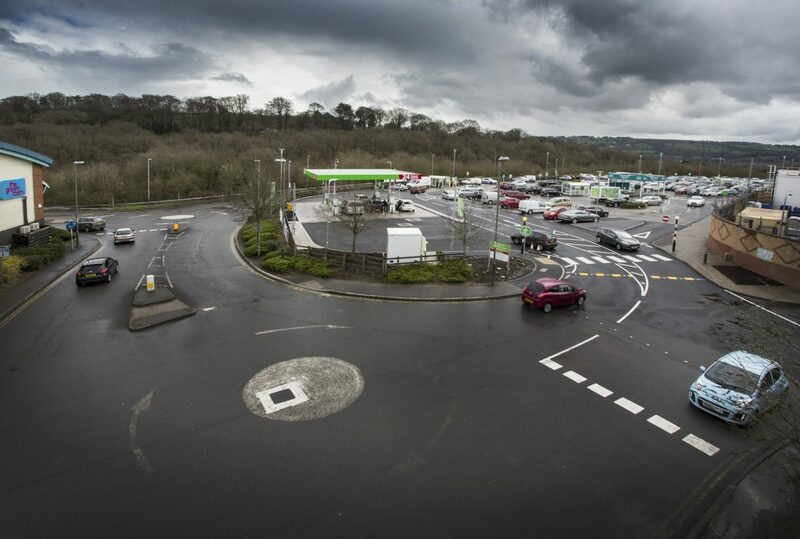 The scheme involved creating new access, a forecourt, car parking and service bays, drainage, lighting, CCTV and signage totem. The site is close to the seafront and as such we liaised with Natural Resources Wales to agree the best design solution to protect the tidal ground water table. 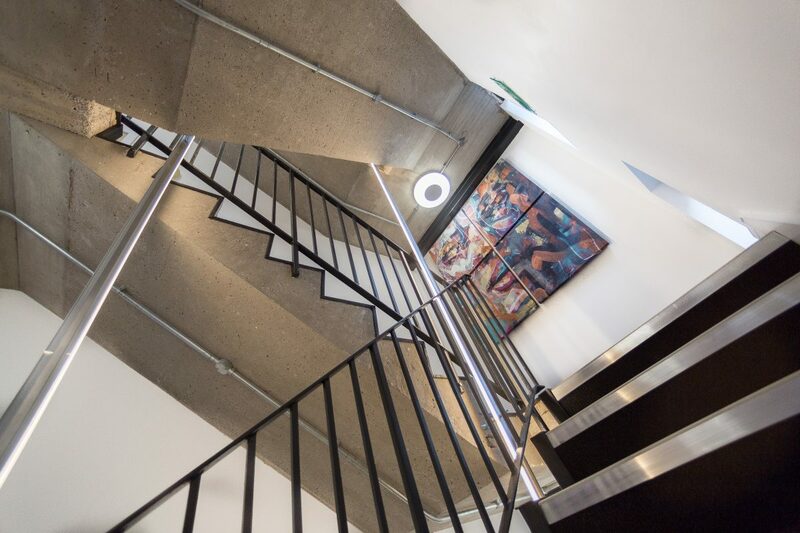 Working with the structural engineer, a concrete sealed underground space was created to house the fuel tanks. This design solution will further reduce the potential of seawater pollution in the event of a failure of the containment of the tanks. 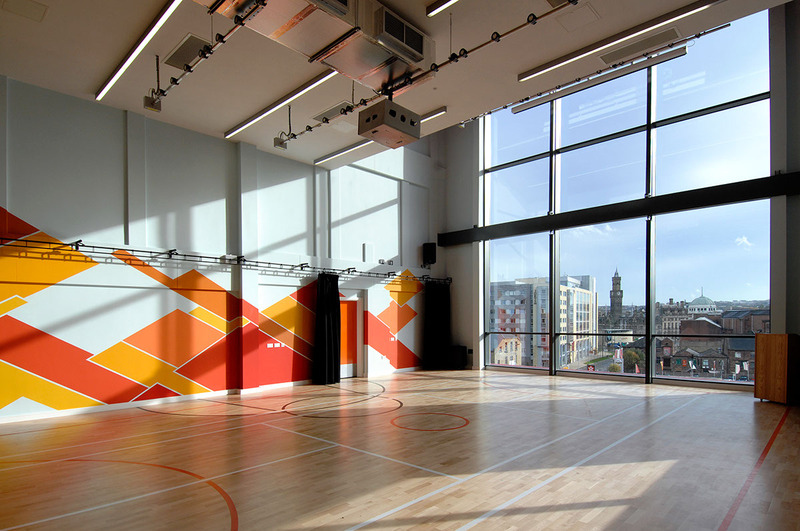 Bowman Riley designed the award-winning Culture Fusion, a state-of-the-art youth centre for Bradford YMCA. 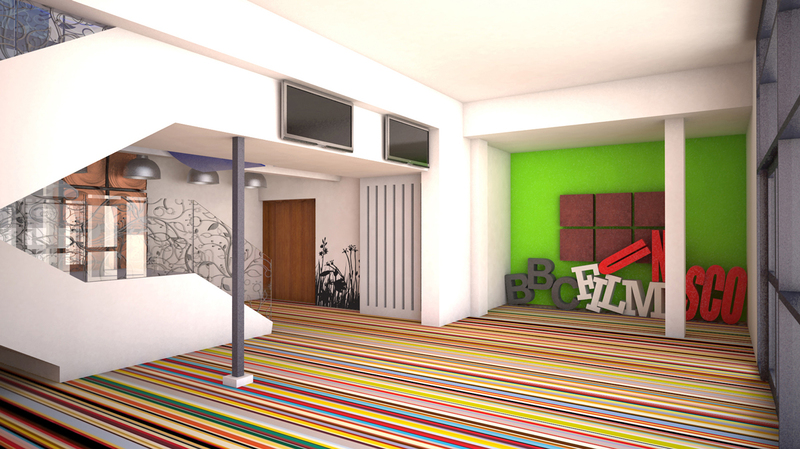 The centre has been designed to provide inspiring learning, creative, training and recreational spaces for the young people of Bradford. 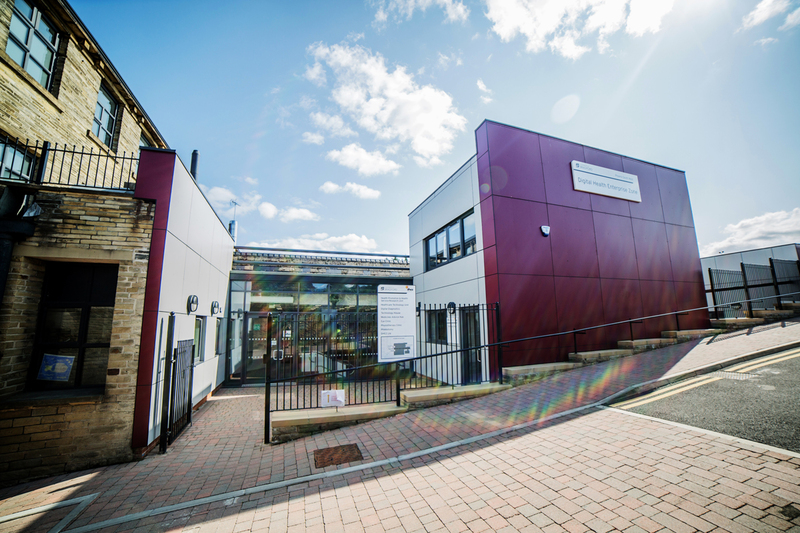 The centre provides 3200m² accommodation for tenants offering services to young people on issues ranging from employment, healthcare, housing to counselling. 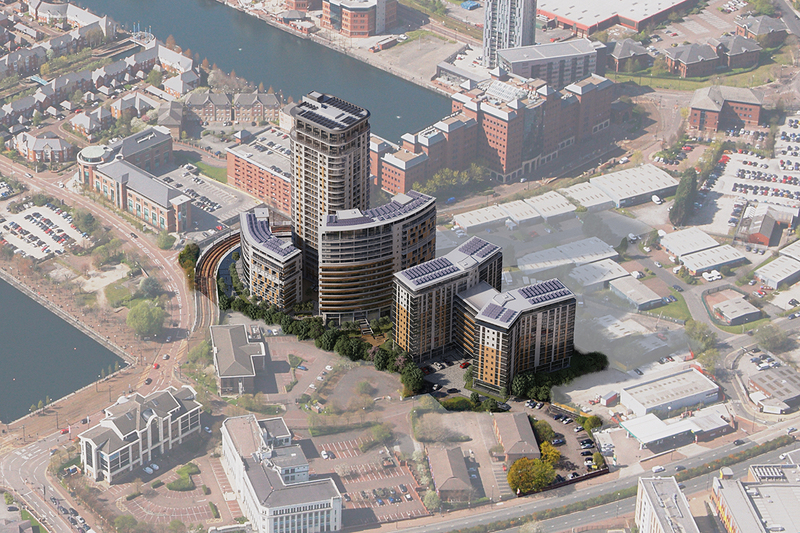 The centre includes unique features such as a rooftop performance venue and café with views across the city, an urban meadow and a secret rooftop garden. 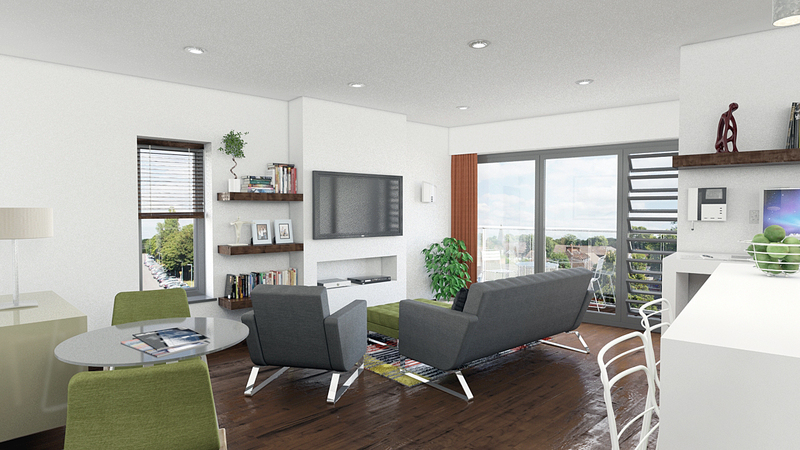 Won through competition, Bowman Riley’s design was selected by a panel of young people as their preferred choice. Engagement from the outset with the young advisors set the tone for the collaborative approach taken throughout the design. 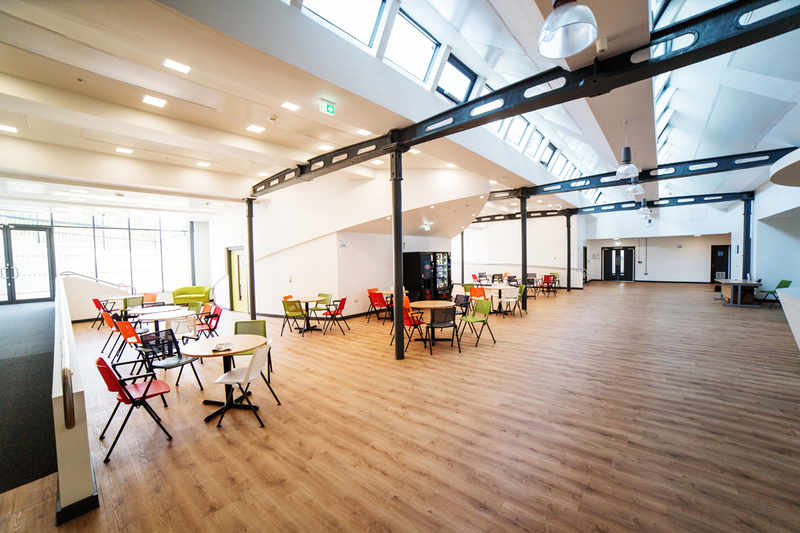 The project comprised the transformation of a derelict warehouse building into a vibrant new youth centre by linking it with a new five-storey extension. 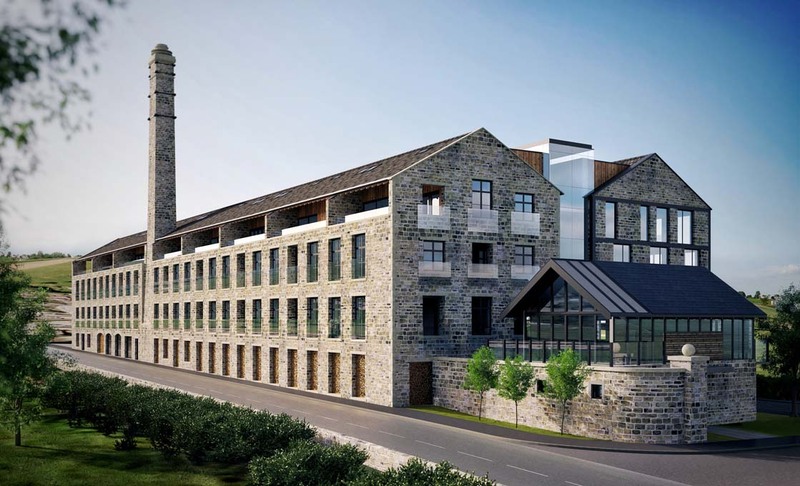 The design responds to the historical significance of its former industrial site and provides a striking new building, which makes a significant contribution to the regeneration of the city centre. 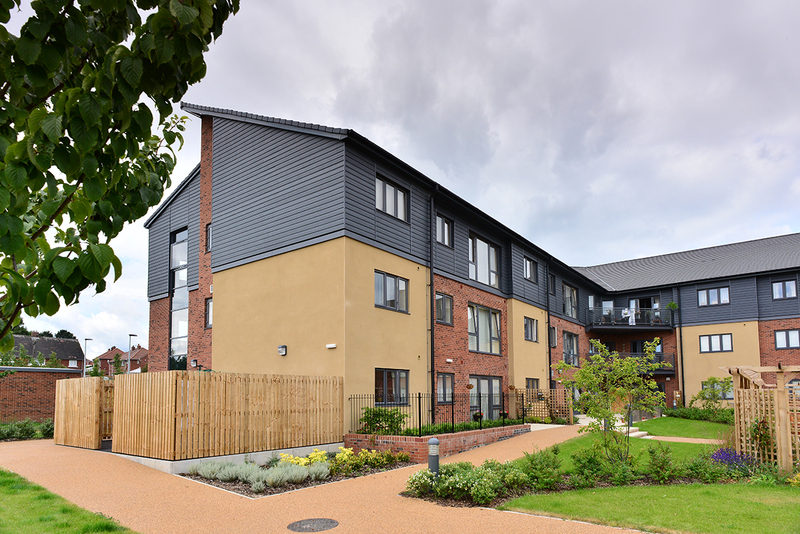 Culture Fusion was awarded the 2012 LABC Building Excellence award in the category of community and achieved BREEAM Excellent at the design stage. 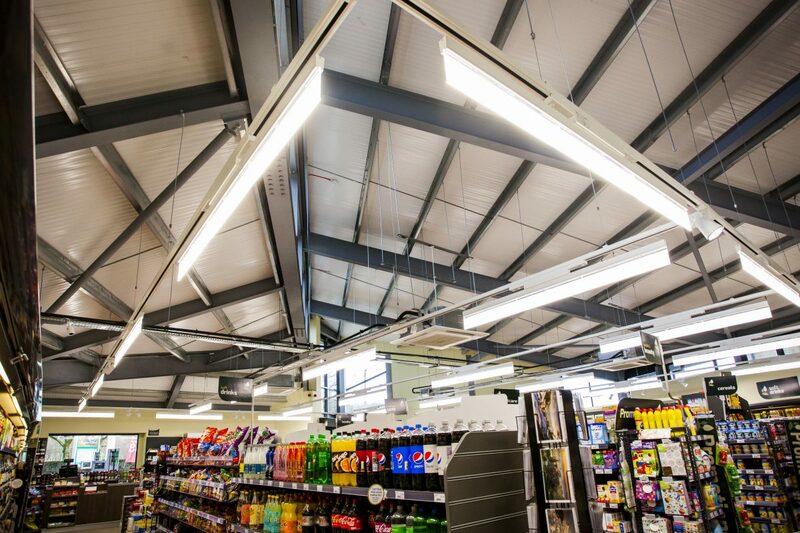 Bowman Riley was commissioned by Brakes Food Wholesalers, a leading supplier to the foodservice sector in the UK. We supported their ambitious plans to move into the business to business food market capitalising on a strong brand and distribution network. 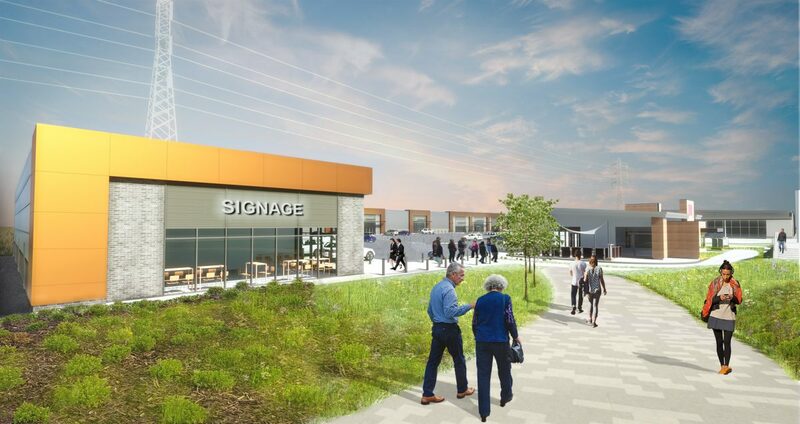 Working in partnership with Brakes and the wider design team, we provided architecture and CDM coordination bringing our considerable expertise of designing and master planning developments in the retail sector. 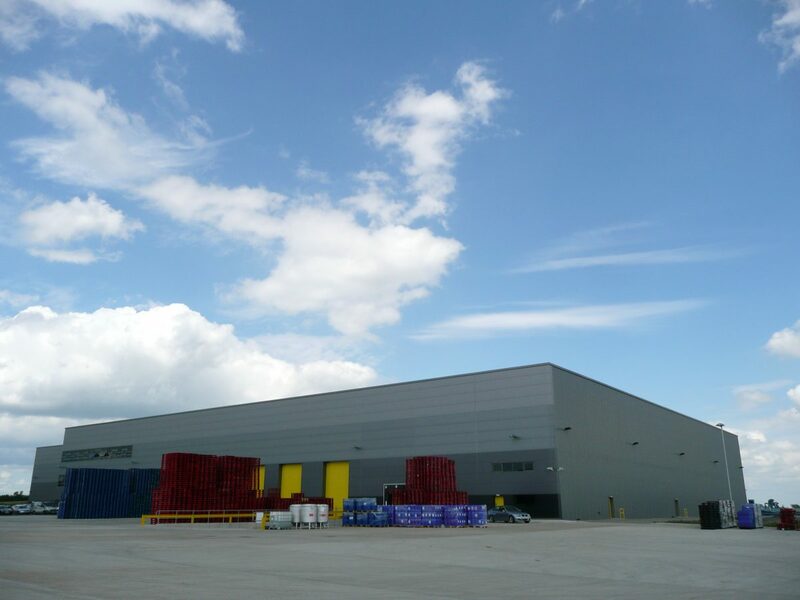 The first project was a refurbishment of an existing warehouse to convert it into a 25,000ft² food market in Croydon. 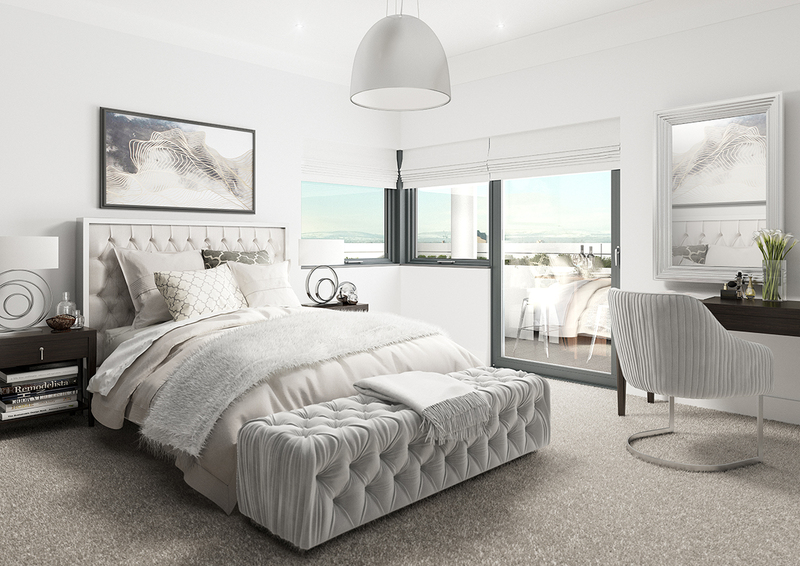 The designs provide a friendly and appealing environment whilst maximising the functionality and efficiency of the development. 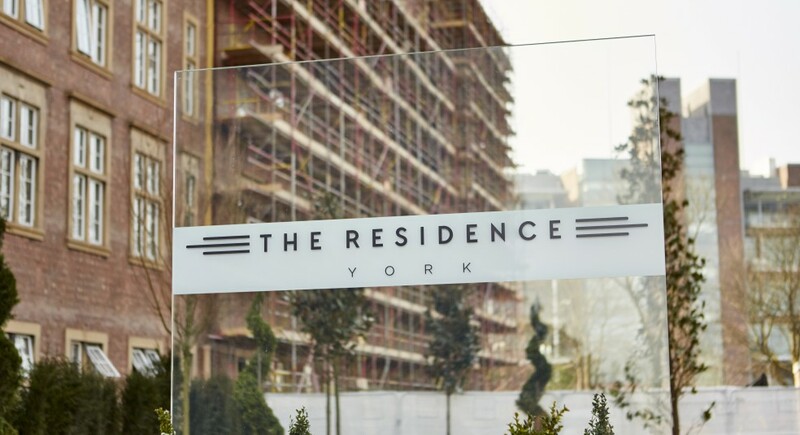 We were involved in the concept planning of the scheme, store layout and the design of the building envelope including a new customer entrance to present their branding on the first scheme. 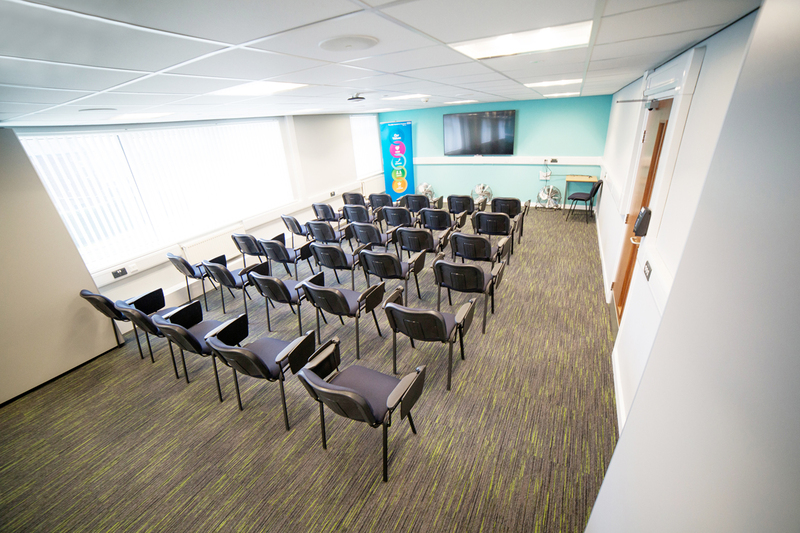 We facilitated a quick delivery on a nine week programme to a high standard. 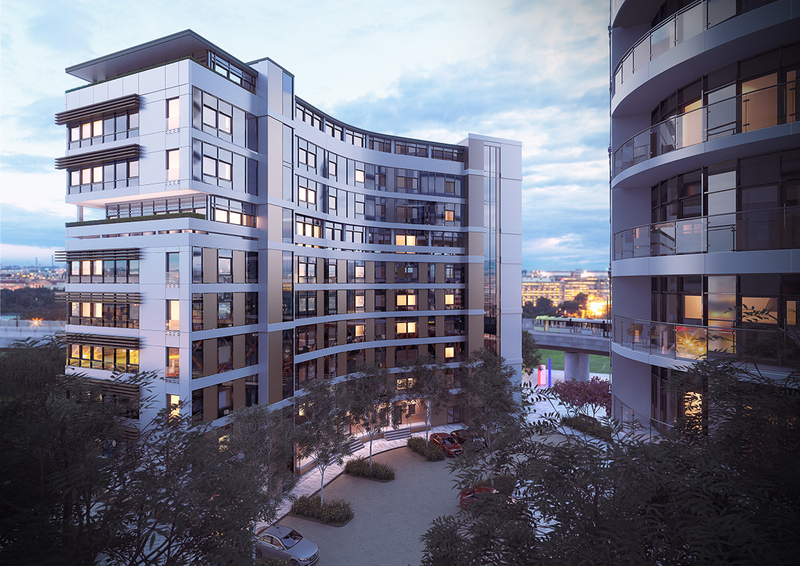 We introduced value engineering details to ensure the project was delivered within the target budget. 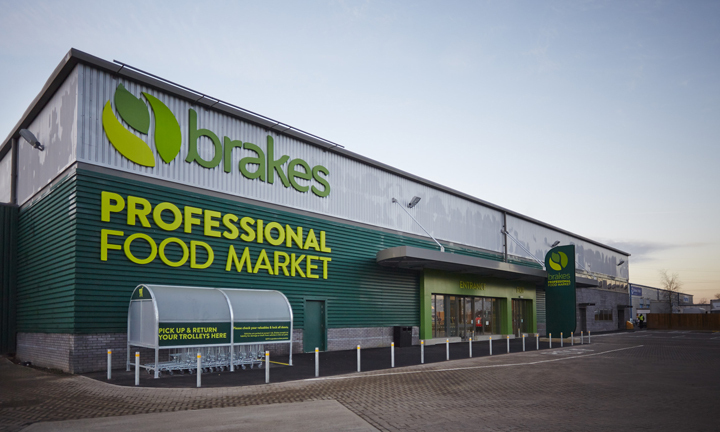 The new food market we delivered has allowed Brakes to start their journey in this new venture. The specific internal layout and design has given Brakes a unique identity differentiating their offering from their competitors’ brands. Bowman Riley is continuing to work closely with Brakes to develop their standards and specifications, whilst reviewing new sites to assist them in their expansion plans. 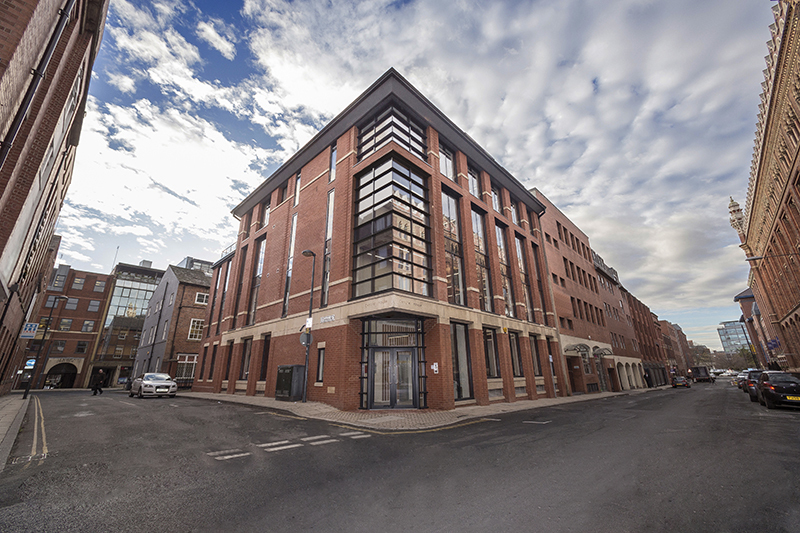 Bowman Riley designed the refurbishment of Central House, a prominent five-storey 1980s brick building in a prime location in Leeds city centre’s business district. 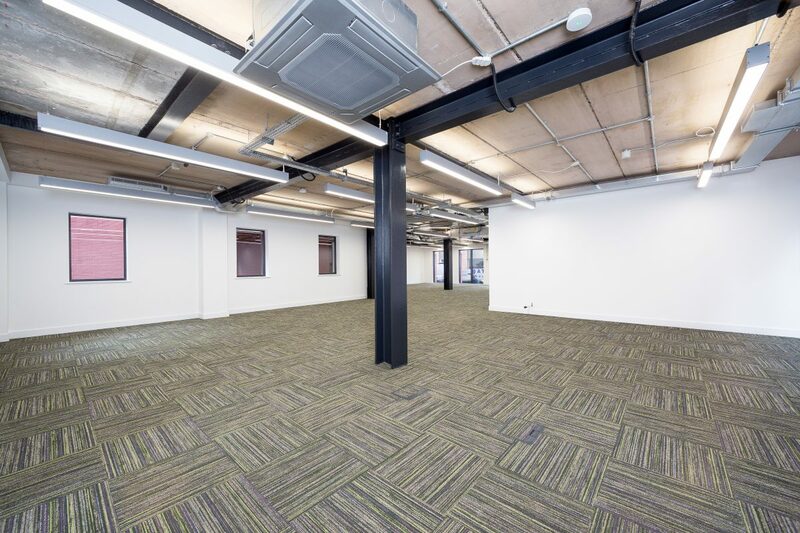 Developer, Moorgarth Properties purchased the building as their new home and identified the need to renovate it to create high-tech offices to showcase their talents and attract high calibre tenants to lease the remaining offices. 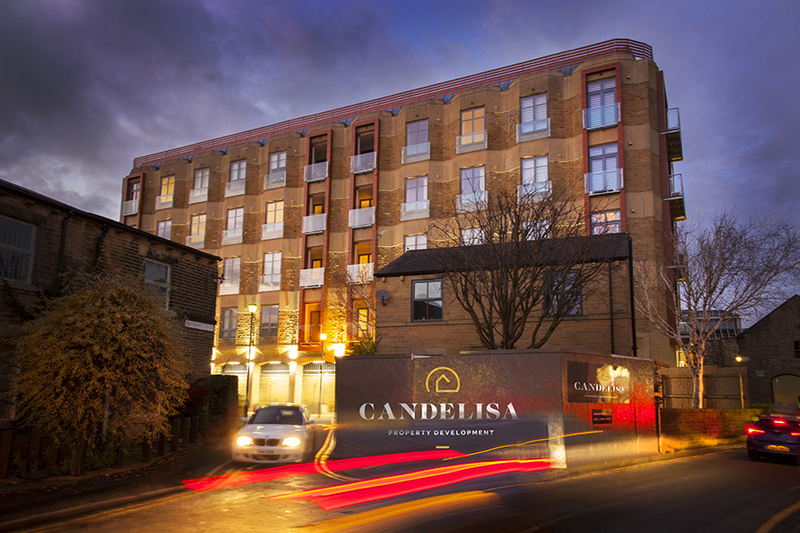 Adjacent to a listed building, the 10,435ft² building is classified as an important building of architectural merit. This influenced the design and led to a careful manipulation of areas to retain the classical order of the façade. 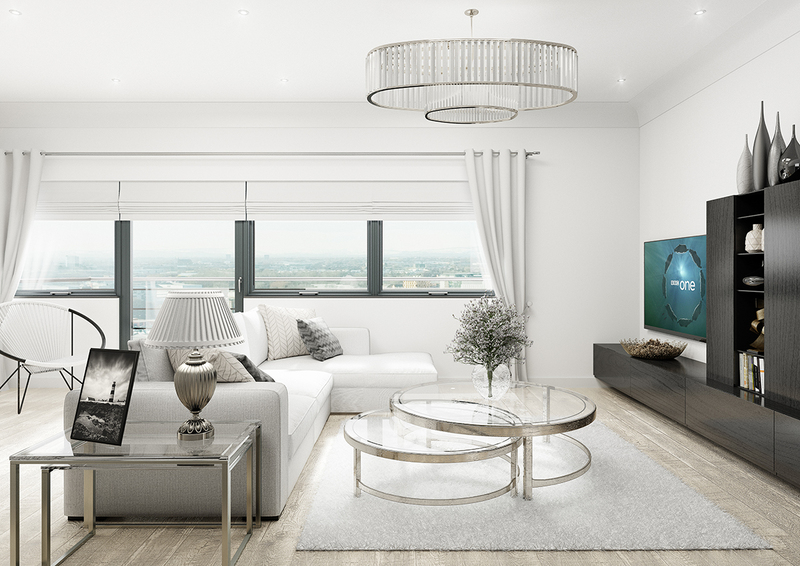 Key features were enhanced with the introduction of striking new contemporary elements including: balconies and Juliet balconies, a large external entertainment space and new full height windows on the upper floors. The result is that the building is now flooded with natural light and all floors offering views of the surrounding cityscape. 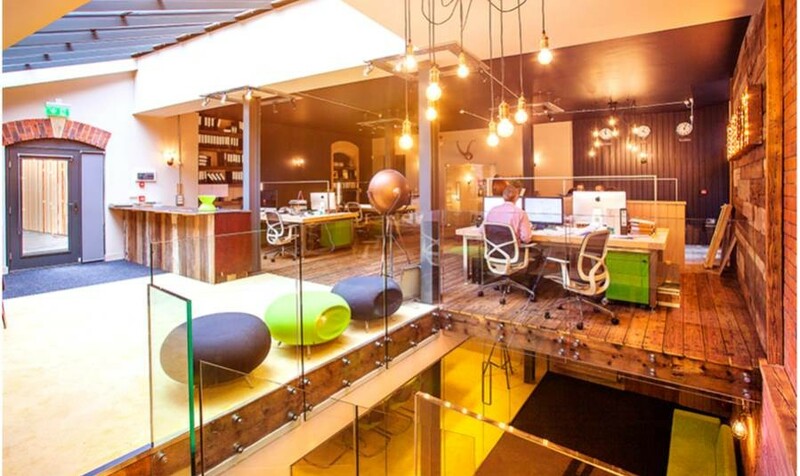 The building was transformed into Grade A office space and was three quarters occupied soon after completion. 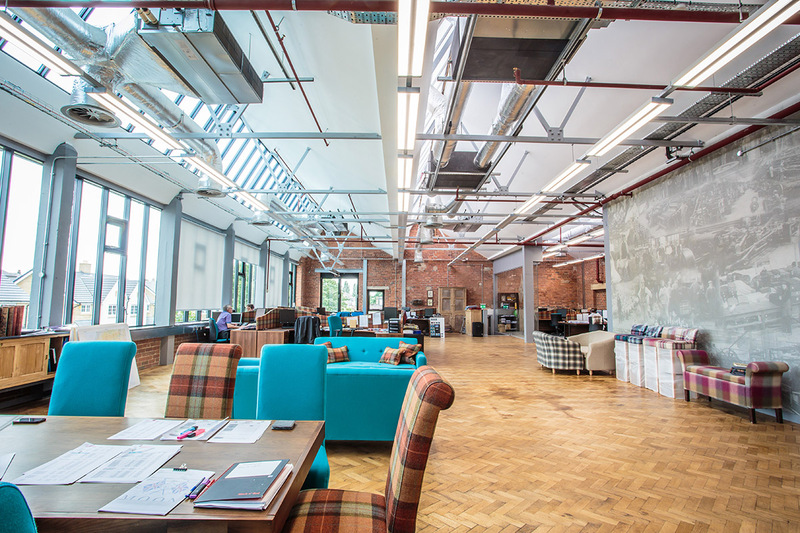 Central House reached the finals of the 2016 British Council of Offices (BCO) Awards and RICS Yorkshire Awards. 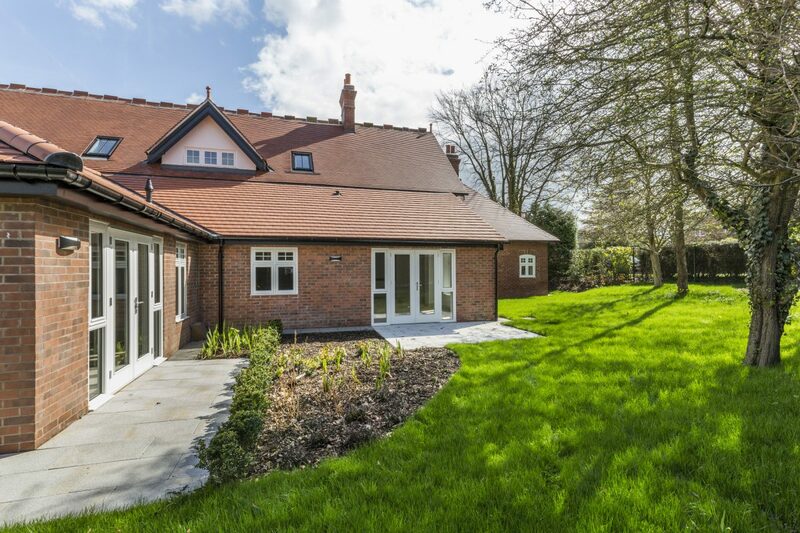 Bowman Riley has provided architectural services to The Co-operative Group for almost 50 years. 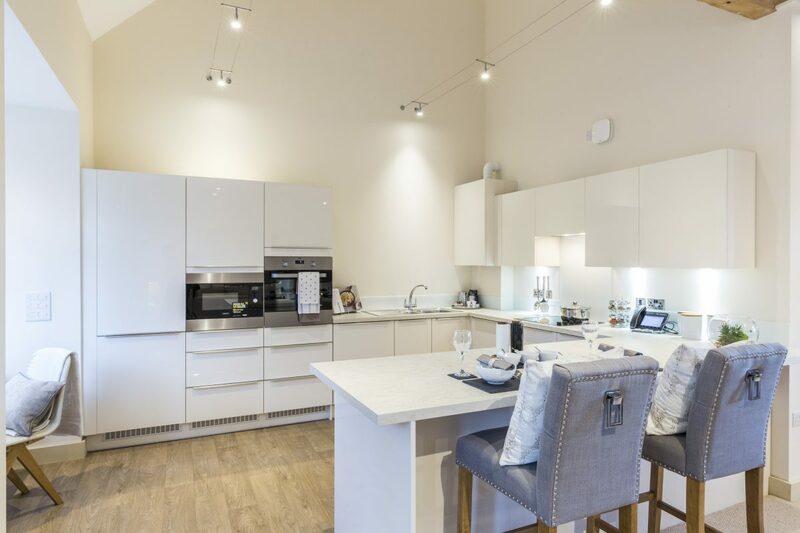 We have supported a host of developments across the UK comprising food and non-food retail stores, department stores, petrol stations, funeral homes, car dealerships and warehouses. Working in collaboration with AECOM, we undertook a feasibility study for a new sustainable design concept for their food retail architectural identity. 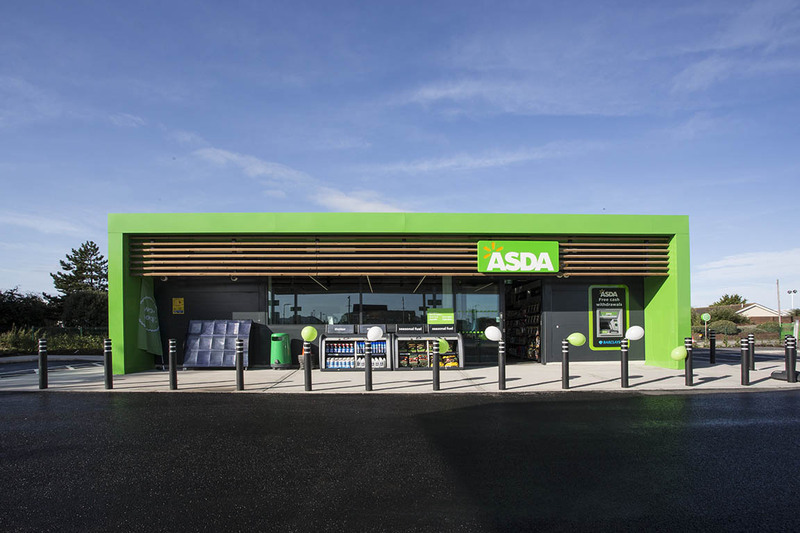 A prototype green store was designed that could become the first BREEAM Outstanding supermarket in the country and be adopted across their food retail portfolio in the UK. 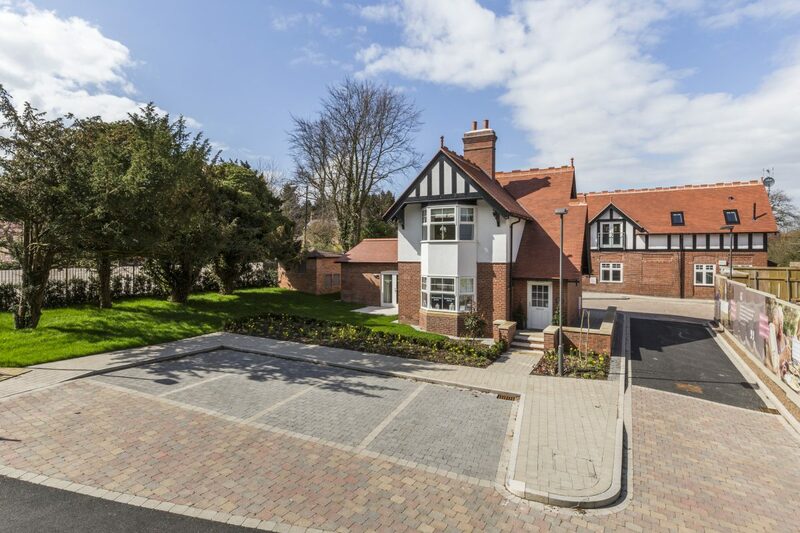 Estate rationalisation and strategy to maximise the value of their properties through assessing the development potential of existing stores. Property surveying and providing updated records of their assets for future remodelling projects from the Orkney Islands to Exeter. 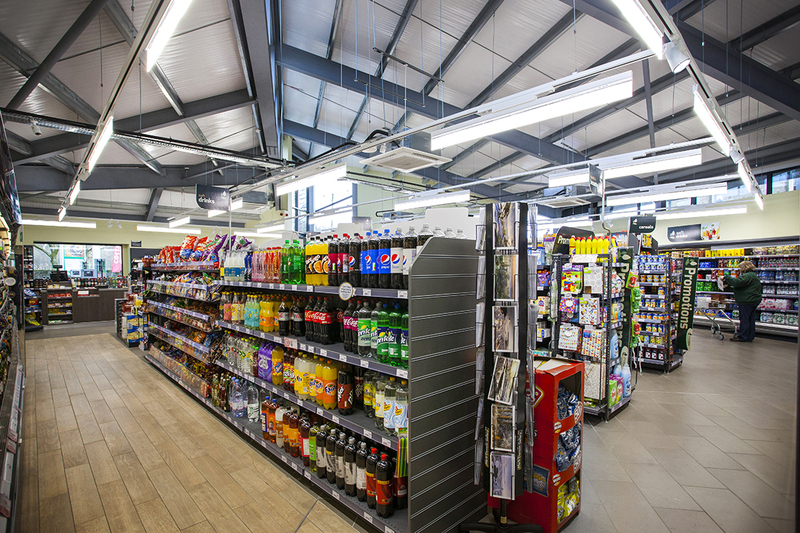 Producing feasibility studies to assess the development potential of various existing buildings for conversion into convenience stores and if practical, we then take the design of the store from planning to completion. 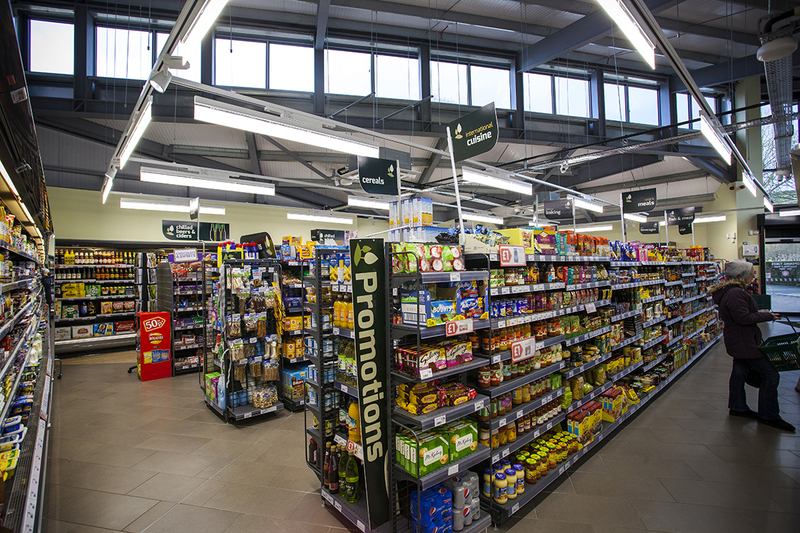 Providing internal store planning and refurbishment designs in line with the organisation’s corporate identity. 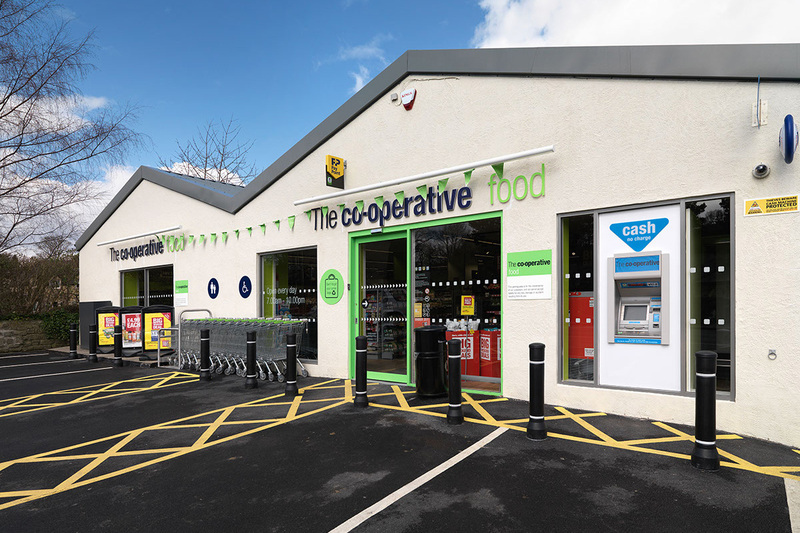 Programme management of roll-out projects to support The Co-operative’s store investment programmes. 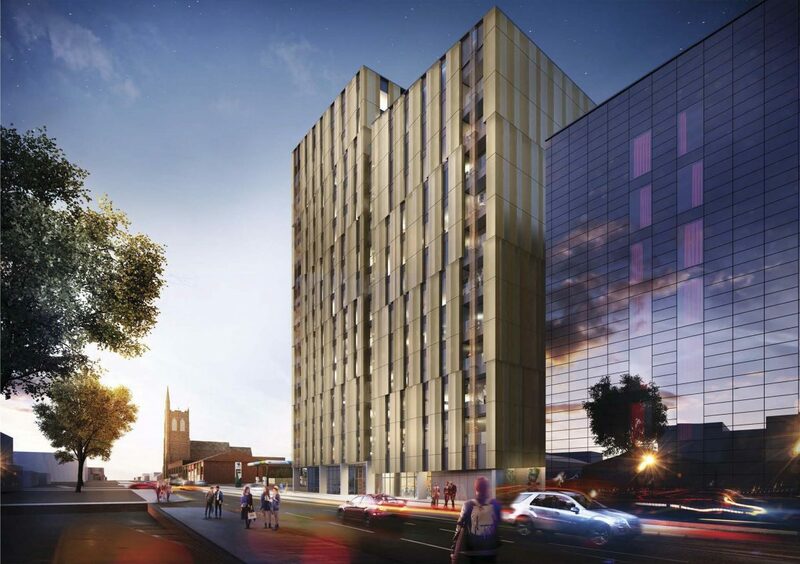 Under a framework agreement, Bowman Riley provides multi-disciplined services as the single supplier for the provision of the University of Bradford’s professional services. The University of Bradford received its Royal Charter in 1966 but its origins date back to the early 19th century. The University has a diverse and complex estate with many Victorian and 1960s and 1970s buildings. Our support helps the University to get the best out of their assets. 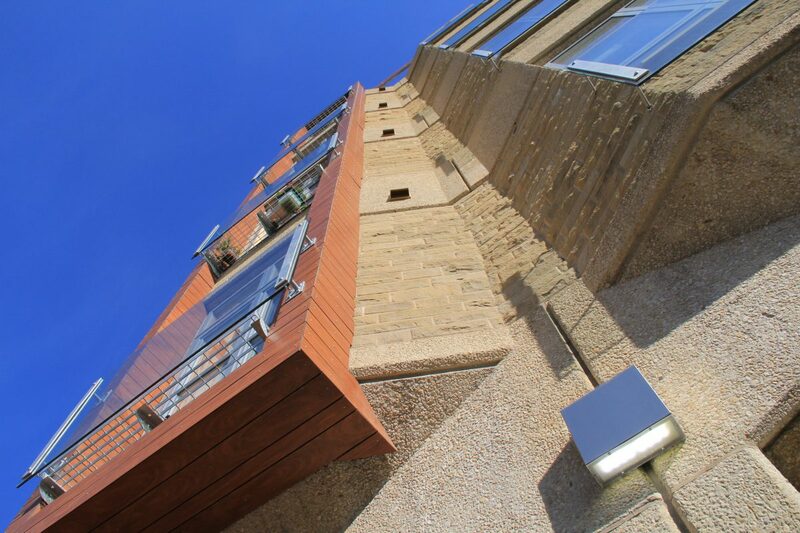 Our team has worked at the University for over nine years successfully delivering over 500 schemes. We understand the multifaceted stakeholders, evolving priorities and objectives and the requirement for flexibility and future proofing. 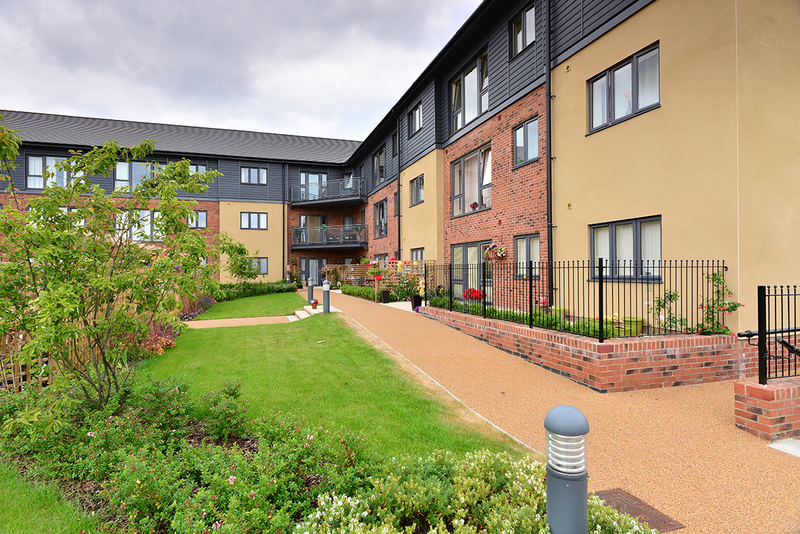 Our knowledge of the construction forms and the service installations across the estate enables us to respond quickly to the inherent design confinements and challenges such as frame span restrictions, wall construction, floor slab and rebar limitations, vibration issues, access/fire compliance, thermal performance and asbestos. Identifying design considerations from the outset provides greater efficiency for the University. Our knowledge of the University’s procurement processes, stakeholder sign-off procedures, project board and workbook processes has enabled us to deliver fast-track strategies to ensure the design, programme and financial objectives are achieved. 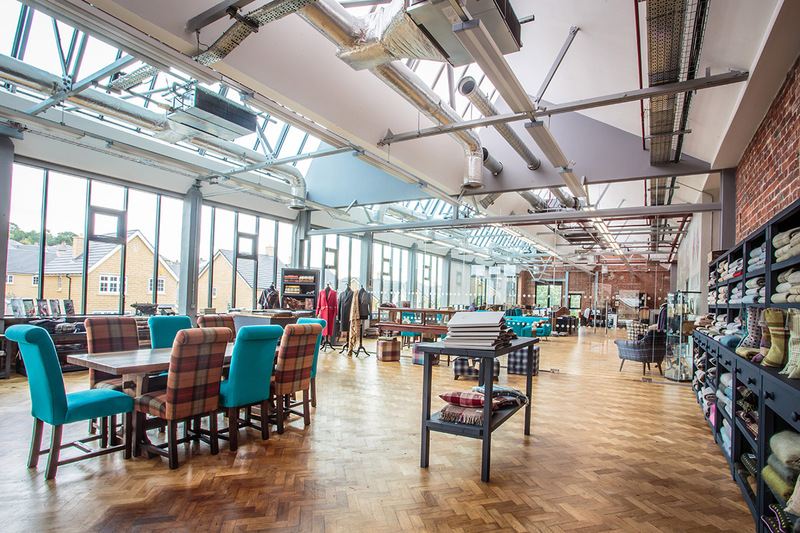 We completed a £500k refurbishment of the Workshop Block following a five-week design and tender period. Our extensive knowledge of the estate and our team’s expertise and commitment to the University has formed a trusted advisor relationship with the university’s estate team. 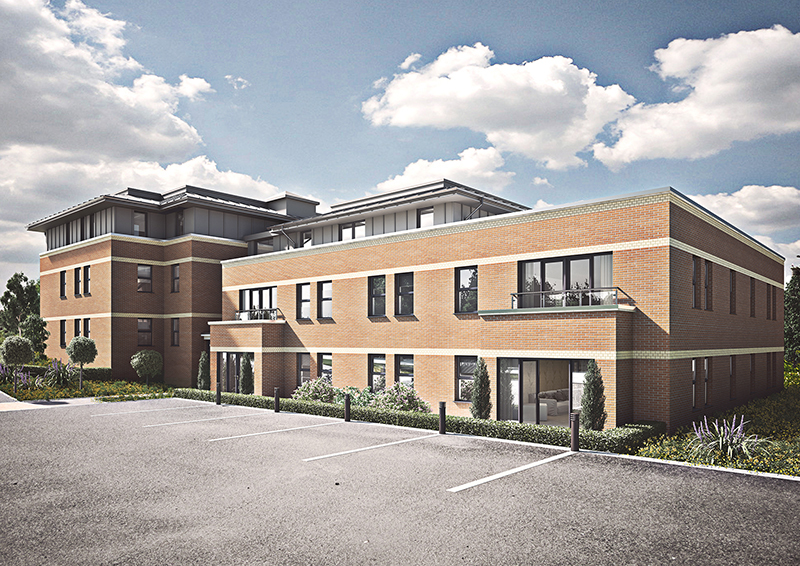 Bowman Riley provided the detailed design for a new 365m2 modular building at Wythenshawe Hospital, part of the University Hospital Southern Manchester NHS Foundation Trust to create a new main hospital entrance. 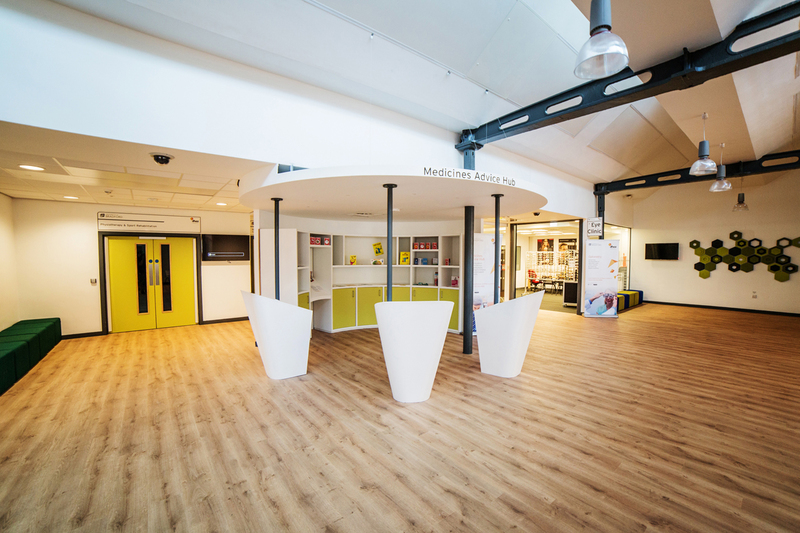 The building houses a Costa Coffee and M&S Simply Food to provide an upgraded food retail offering at the hospital and bring in much needed additional revenue to the NHS Trust. The building was constructed beneath an undercroft of an existing tower, which was the original hospital’s main entrance. The existing structural columns were integrated into the new building’s fabric. 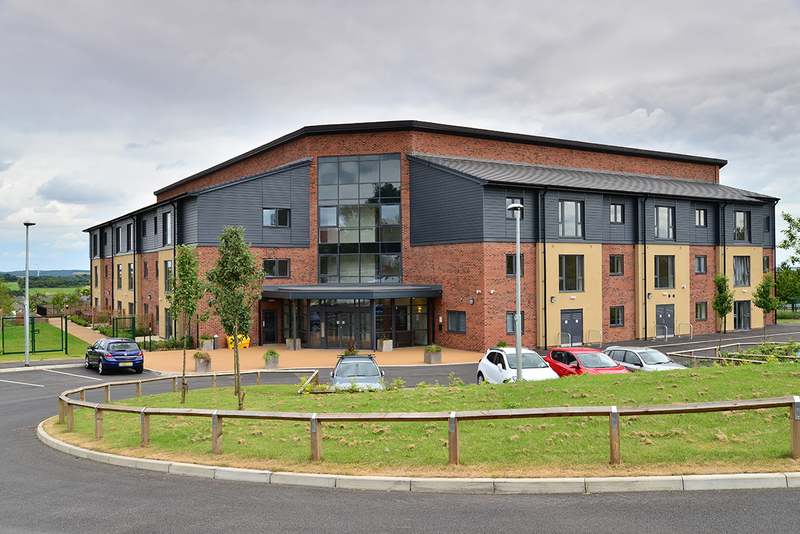 A modular solution was ideal for the live hospital environment with the project delivered on site in only 12 weeks. Site access was very tight resulting in all materials brought in on a gurney through an access corridor between two existing buildings. 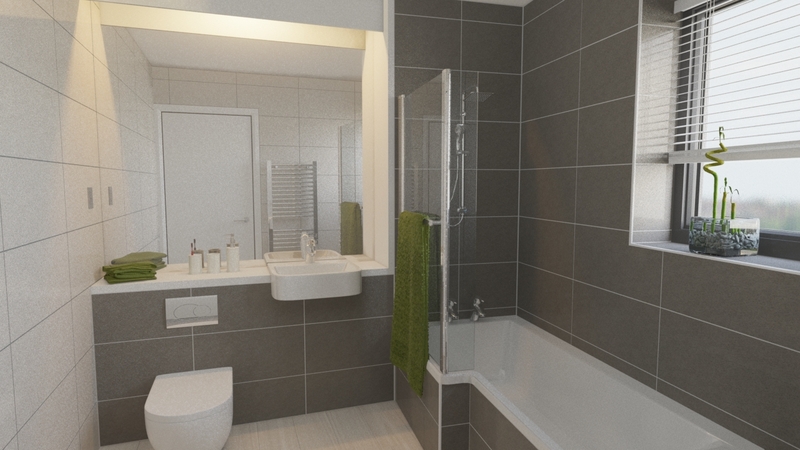 Our role was to take the design from planning through to completion. 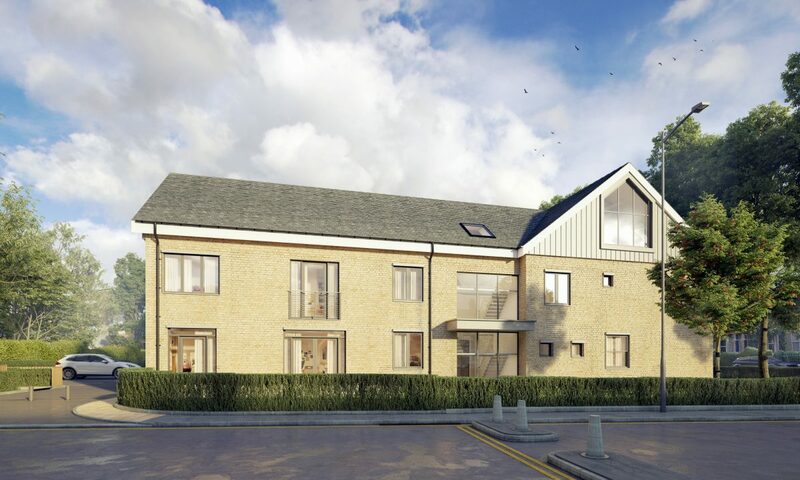 We liaised with the local authority to discharge complex planning conditions and manage the building regulations submission. We prepared drawings for inclusion within legal documentation including phasing drawings, superstructure, site logistics and fire strategy. Working collaboratively using the SharePoint software, we shared our documents with the contractors and reviewed by the client. We provided ongoing support throughout the time on site and reviewed contractor design information and commented for HTM compliance. We also attended the coordination meetings with the NHS Trust. 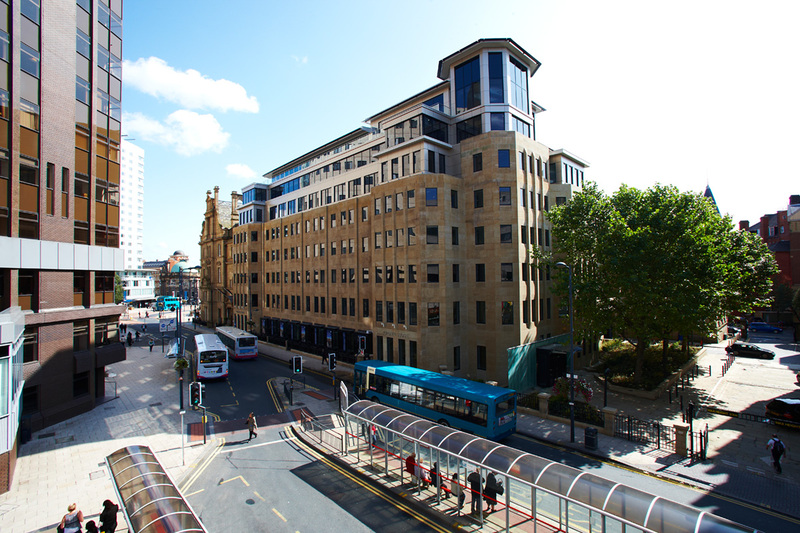 Bowman Riley designed the award-winning Toronto Square, the extension and full refurbishment of an existing five storey building in the heart of Leeds’ professional core. 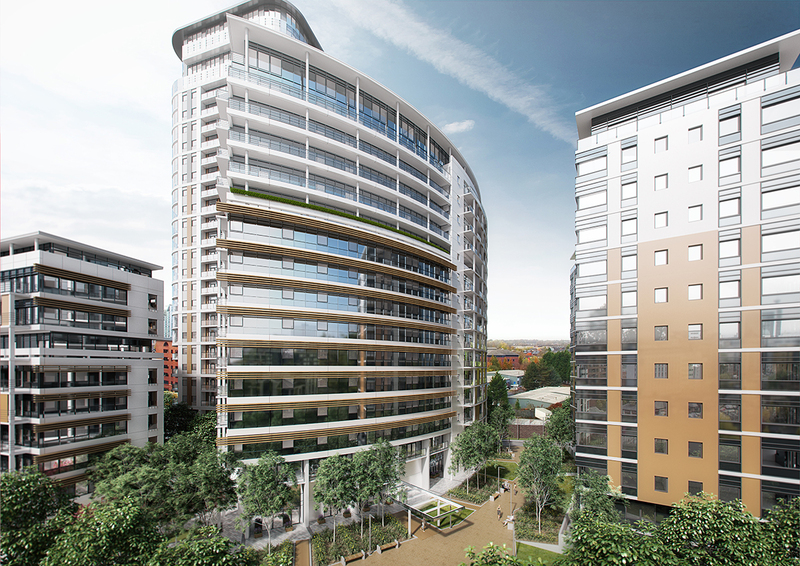 The BREEAM Excellent rated building provides 82,649 ft² of Grade A office accommodation. 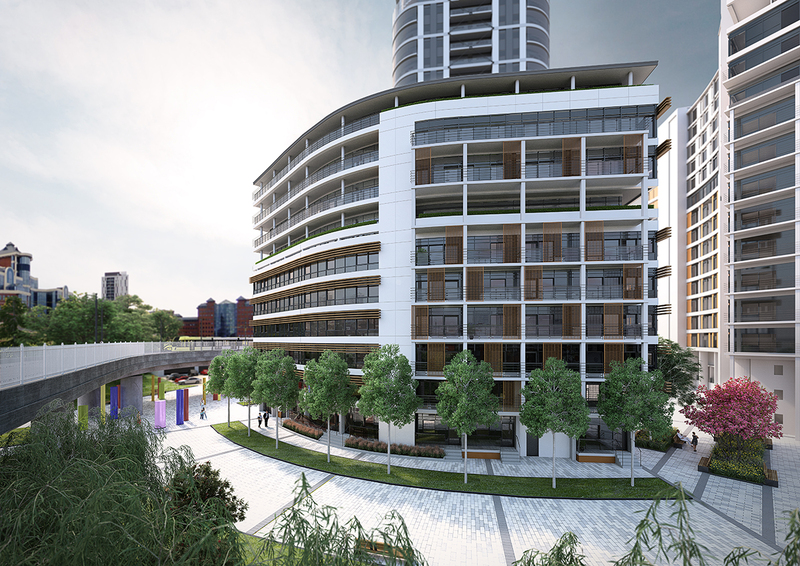 This £10m Toronto Square redevelopment won the Estates Gazette Green Office Development 2009. 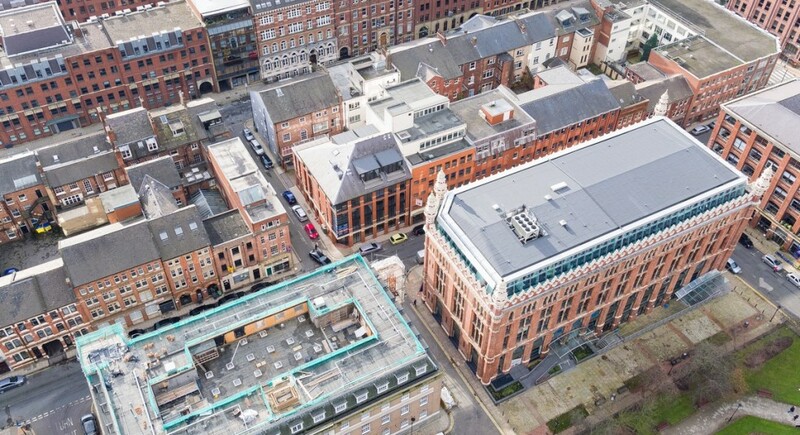 The project involved the demolition of the existing fifth floor mansard roof level and the construction of three new glazed upper levels with views of Leeds’ skyline and a rear full height extension. 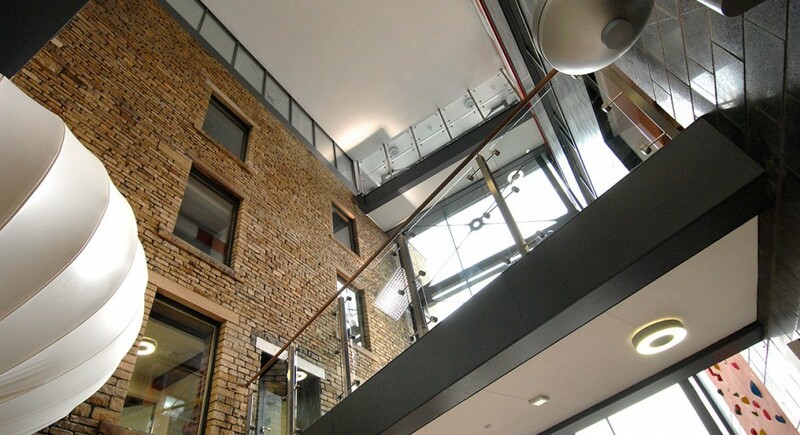 The additional floors, along with an extension to the secure courtyard, provided extra floor space at every level. 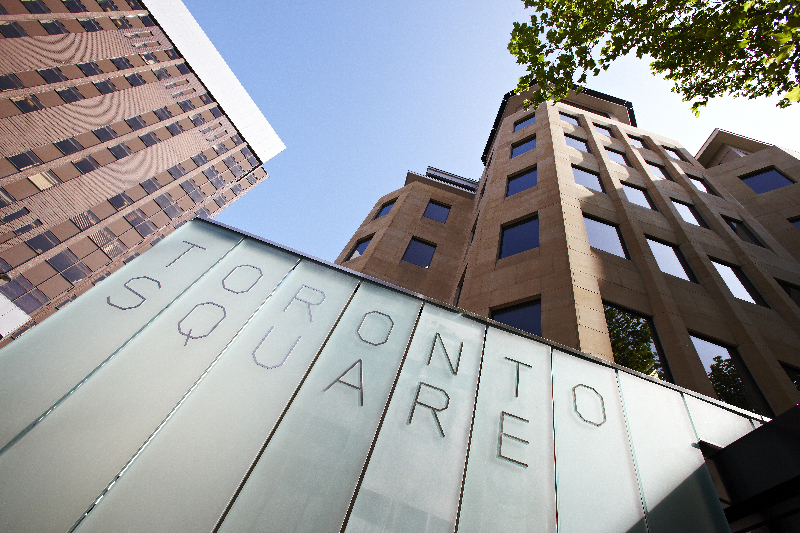 Toronto Square was carefully designed with corporate occupiers in mind providing high quality accommodation. 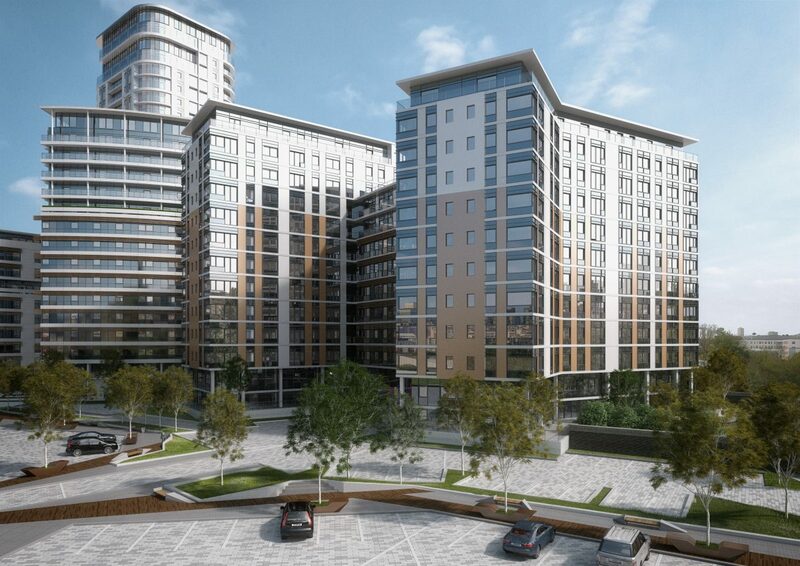 Over 30% of the scheme is newly constructed office space. 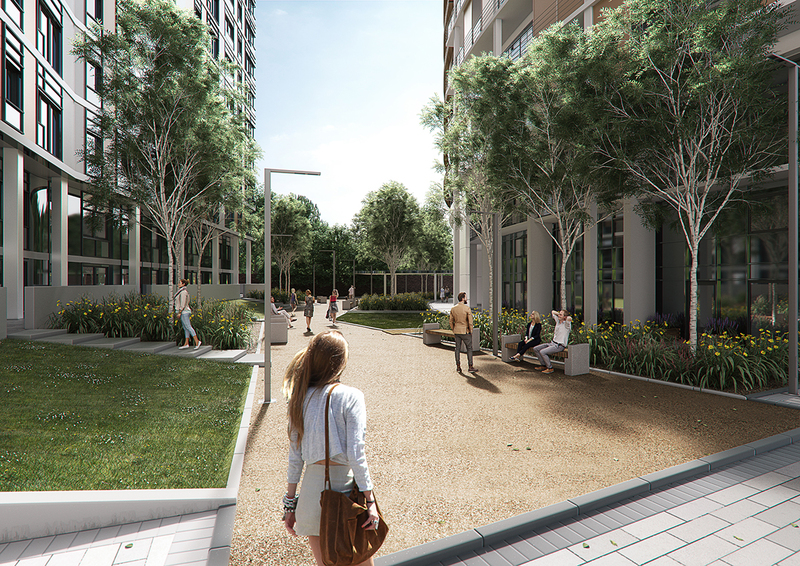 A key part of the scheme was the relocation of the building’s main entrance to front Toronto Street and the central landscaped square which provides a welcome for staff and visitors. 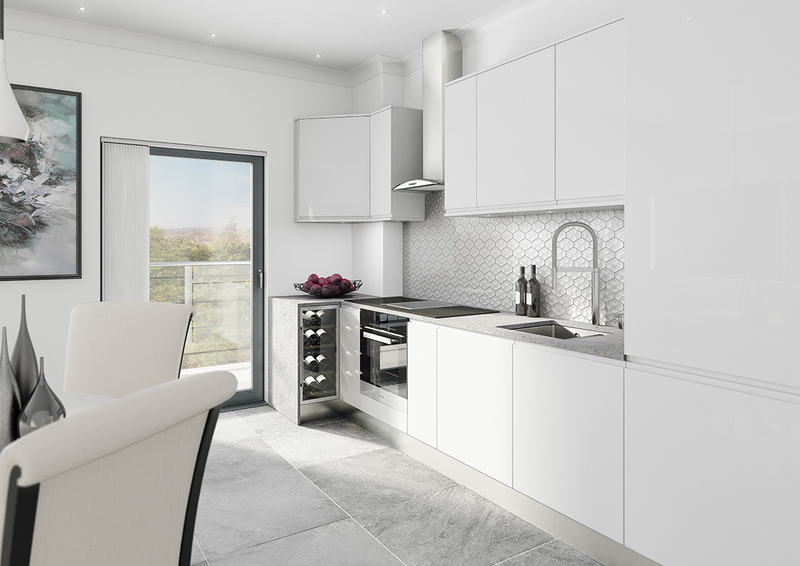 Sustainability and environmental considerations were paramount in the scheme’s design with local and recyclable materials used throughout. All timber came from sustainable supplies / forests. 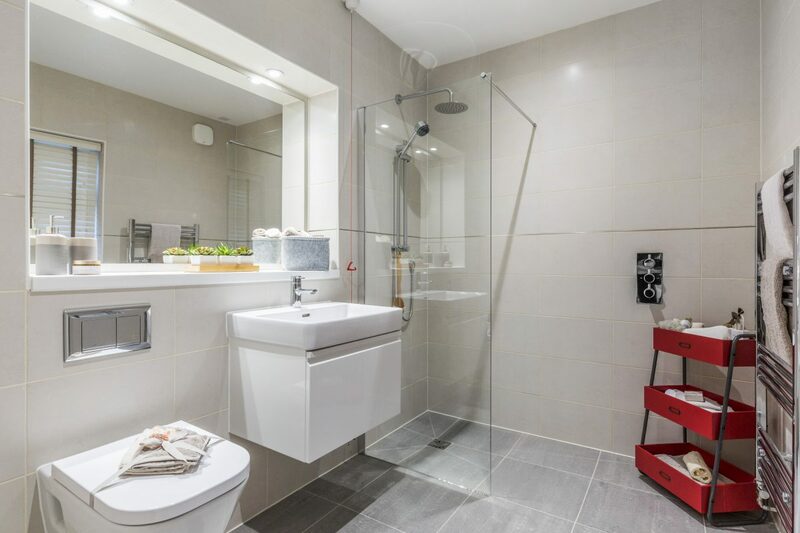 Cycle racks, showers and changing facilities are also provided. 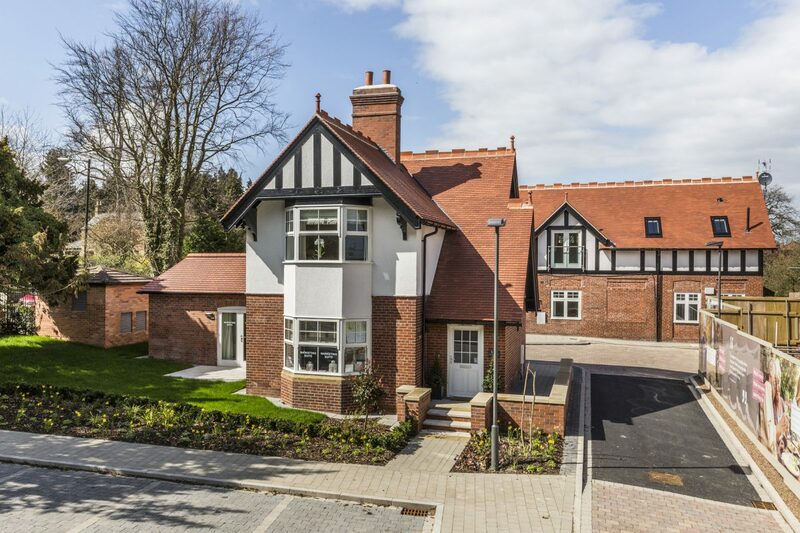 The development achieved a BREEAM Excellent rating. 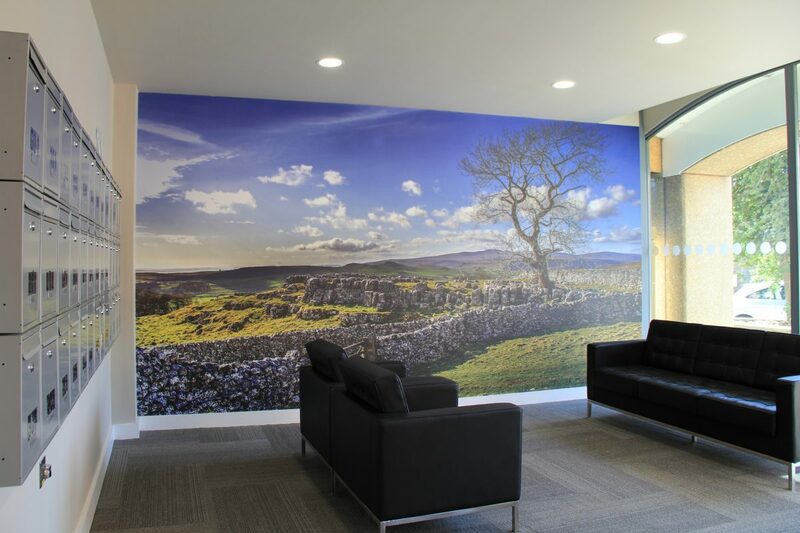 Bowman Riley supported the charity, Christian’s Against Poverty to redesign and refurbish the lower ground floor into flexible staff accommodation within their Bradford head office. 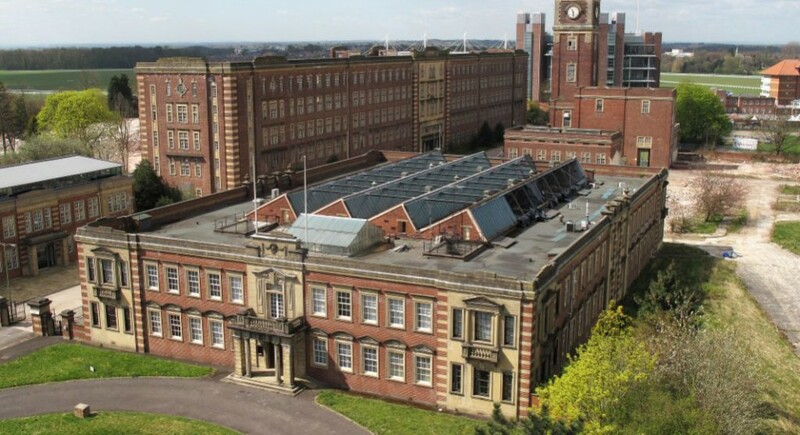 Home to over 300 staff, Jubilee Mill is a large Victorian mill building. 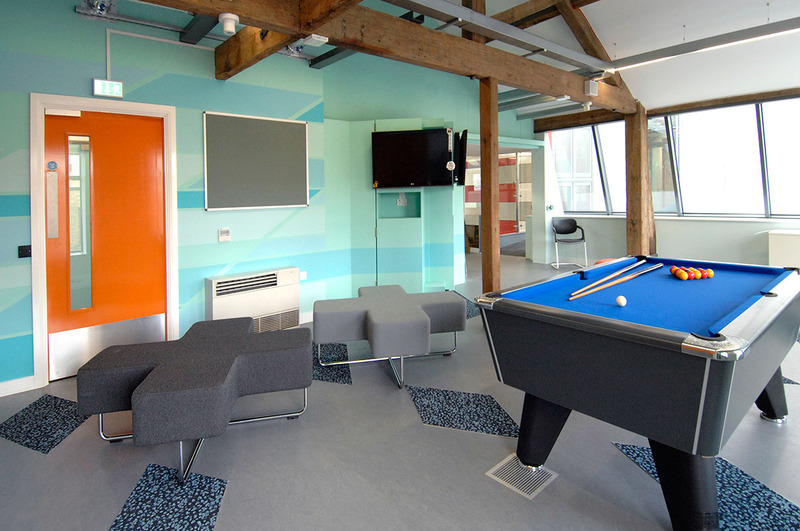 Accommodating over 120 people, the current break-out space had become tired, uninspiring and inefficient. 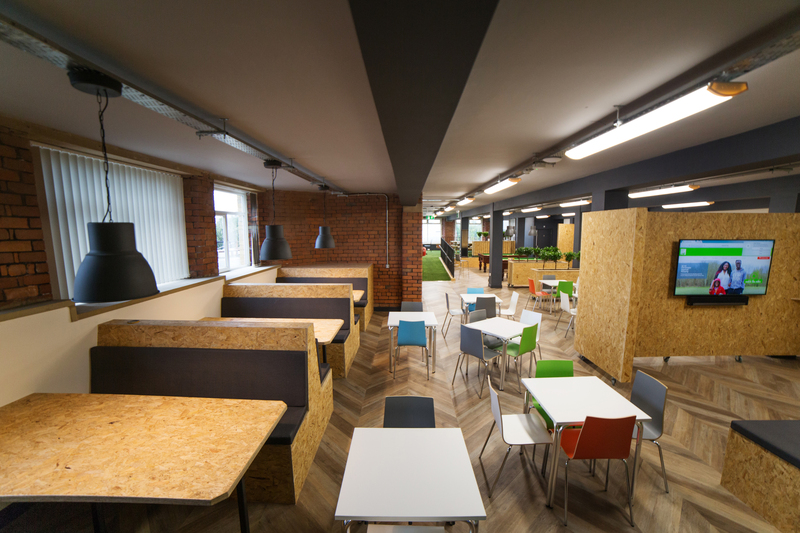 Our role was to evaluate the current space and develop a brief with the client to give the break-out space a complete facelift. 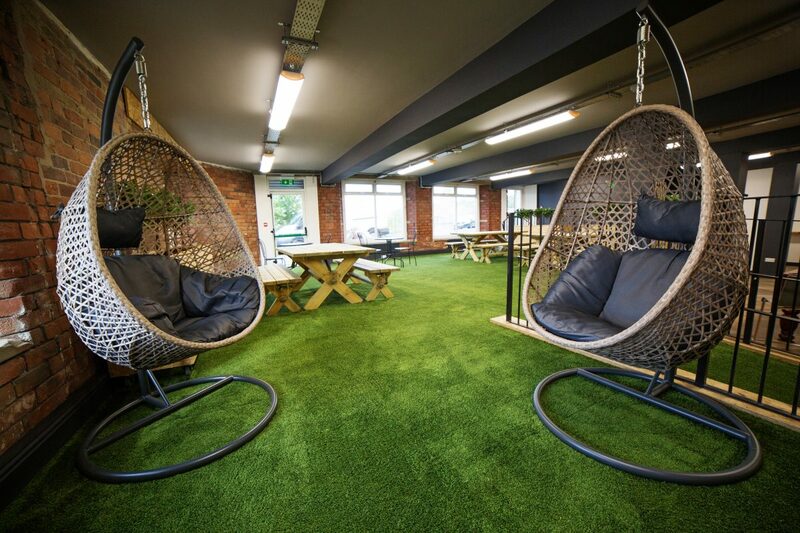 We created a flexible multi-functional space that could be used for collaborative working, socialising, seminars and events. Using 3D modelling, we presented a live walk-through presentation showing the redesign concept to engage with staff representatives. 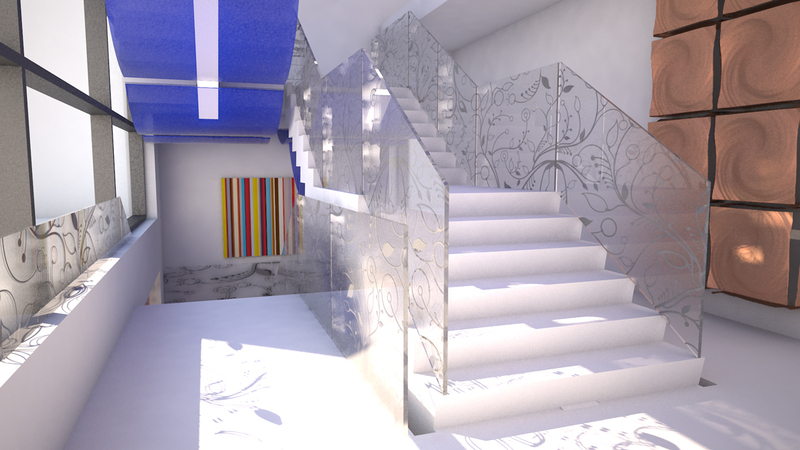 The scheme breaks up the open plan space into distinct zones through the use of colour and furniture. 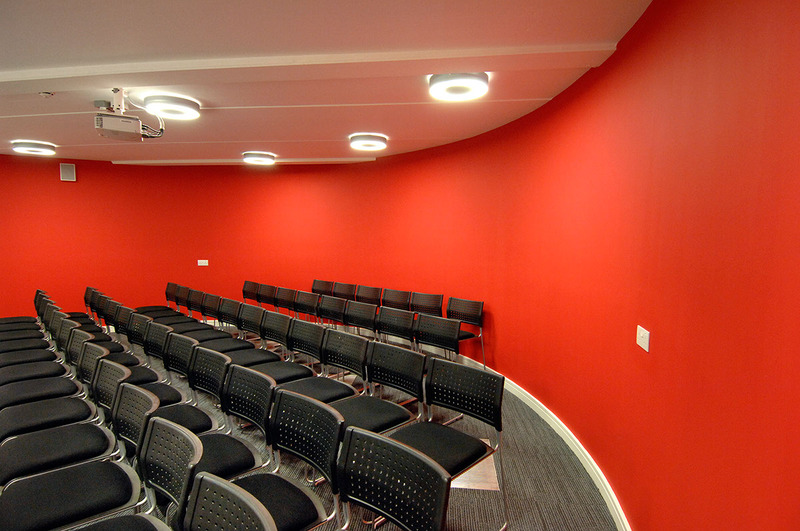 We introduced features such as a focal bar area, picnic area and large flexible auditorium. All of the furniture except the bar is removable to offer maximum flexibility. 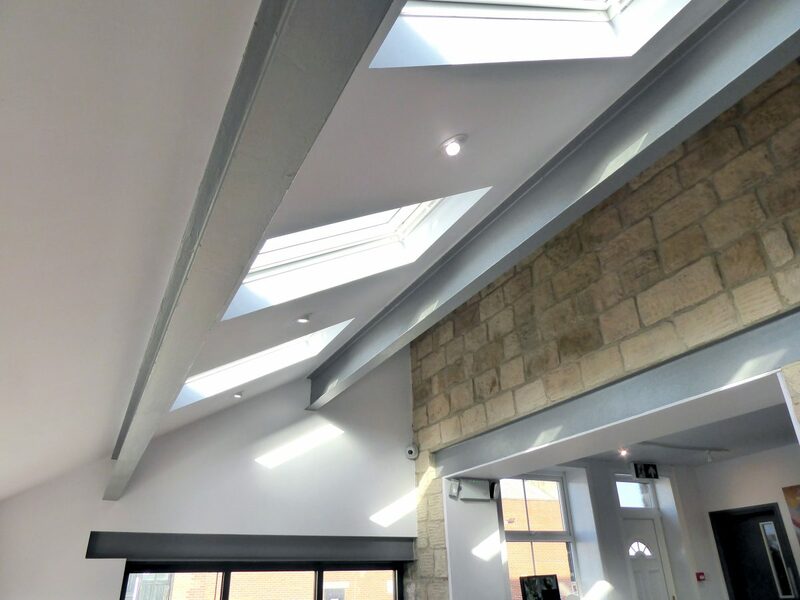 Our design involved the removal of the suspended ceiling to lift the room height and offer a vastly improved appearance with modern LED lighting to illuminate the space. 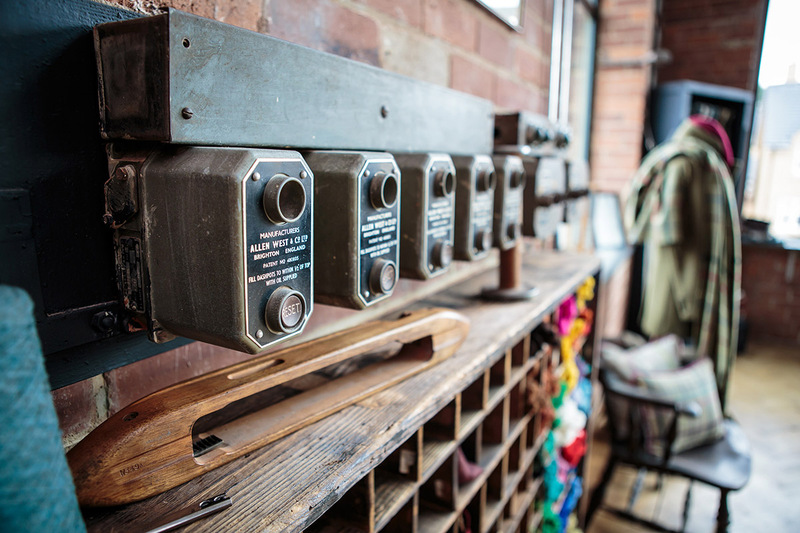 The building’s features and exposed brickwork continue through in the new design to create an industrial aesthetic referencing the building’s history. 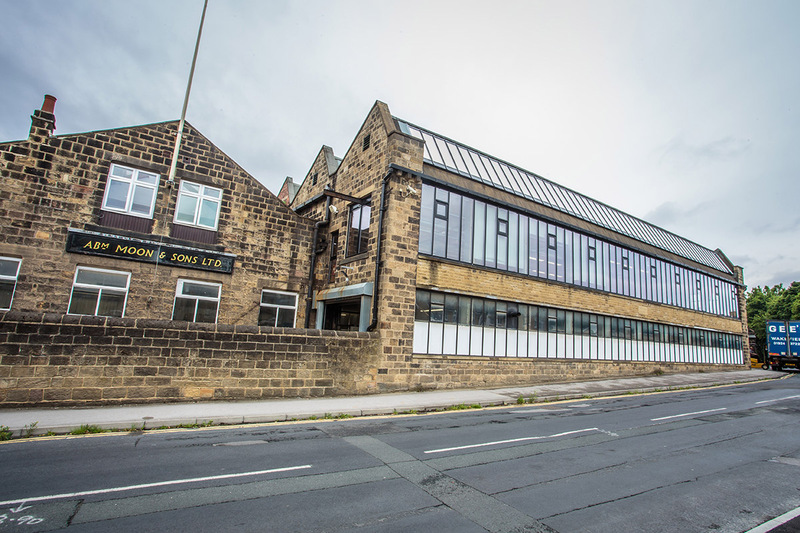 Bowman Riley provided strategic master planning on the Skipton Town Hall complex of buildings located on the High Street . The Grade II listed Town Hall was built in 1862 and today is home to Craven Museum & Gallery, Tourist Information and Skipton Concert Hall. 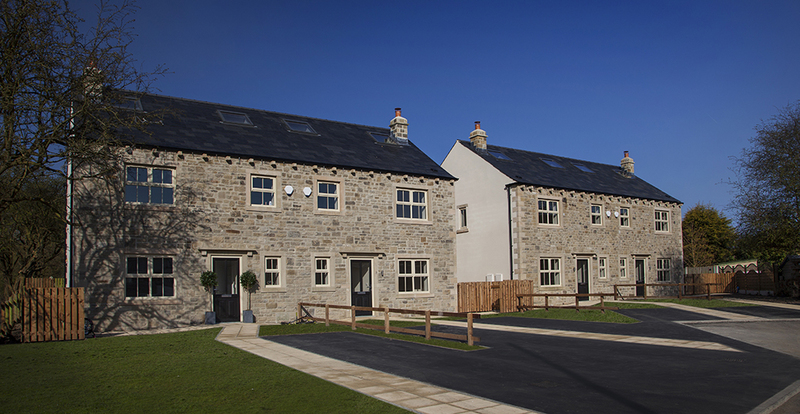 Working closely with Craven District Council, the masterplan was developed into a series of phased projects that could be delivered according to the client’s programme and allocation of funding. 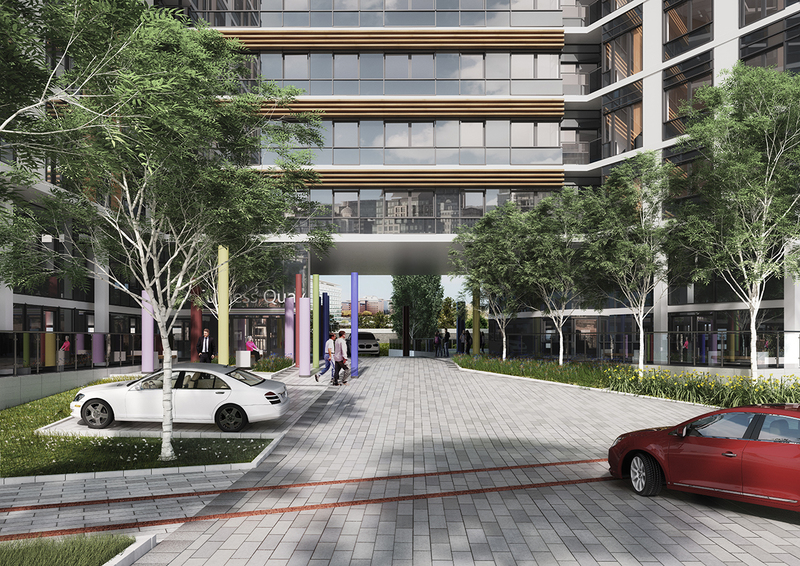 On the first phase of the strategic masterplan, Bowman Riley provided full architectural design, project management, CDM coordination and cost advice from inception to completion. 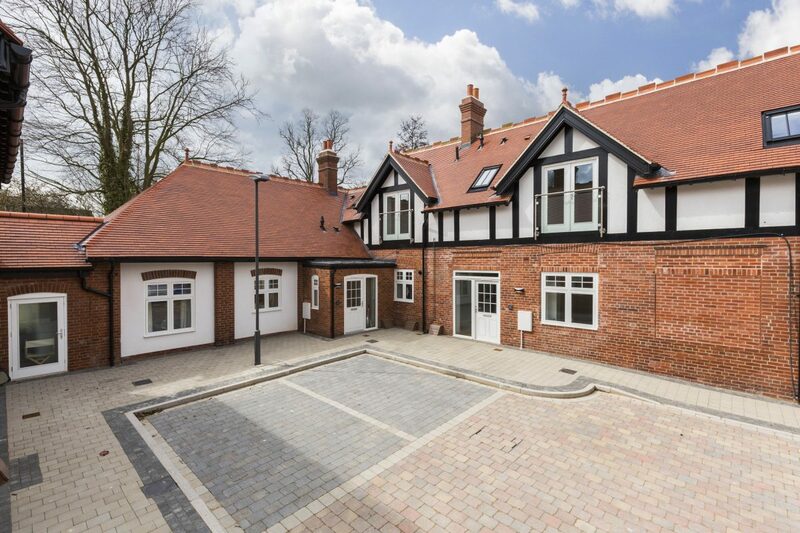 Phase One created a striking contemporary extension providing a new accessible entrance to the side and reinstated the original entrance to the front, replaced the public facilities, created a commercial unit on the ground floor to let and refurbished office spaces. The demolition of an existing building close to a busy public highway required coordination with the local highways authority, the contractor and the client team and resulted in public safety at all times. Careful planning between the contractor and the client team enabled the works to be undertaken while parliamentary elections were taking place within the building. 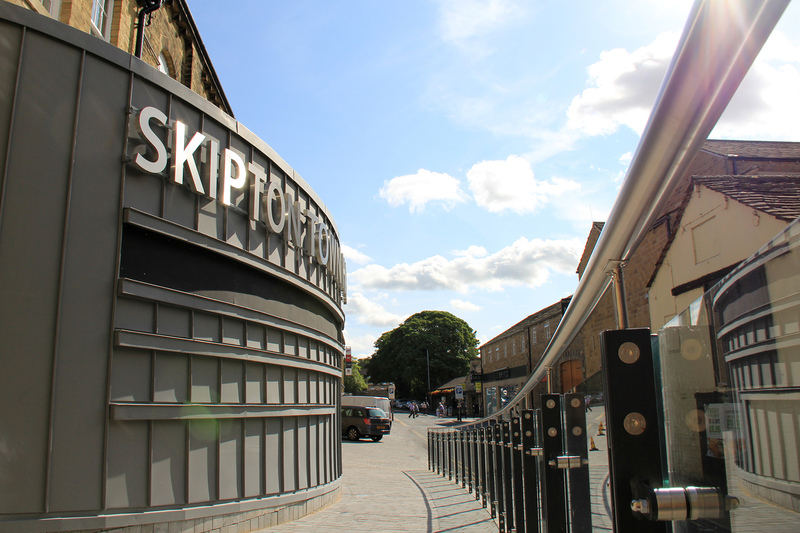 Now complete, the Skipton Town Hall project has restored the building as a key civic asset by providing an active frontage and vibrant street scene. 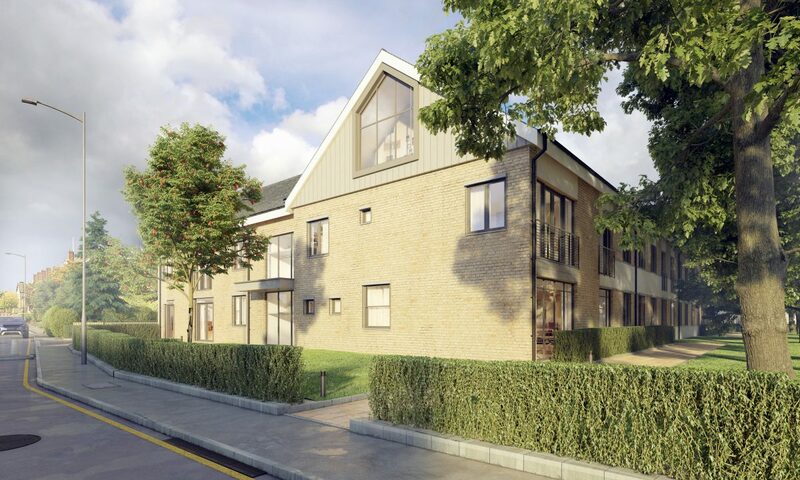 The project sees the sustainable re-use of a public building improving the public realm and community facilities, whilst also providing a source of revenue from the refurbished lettable space. 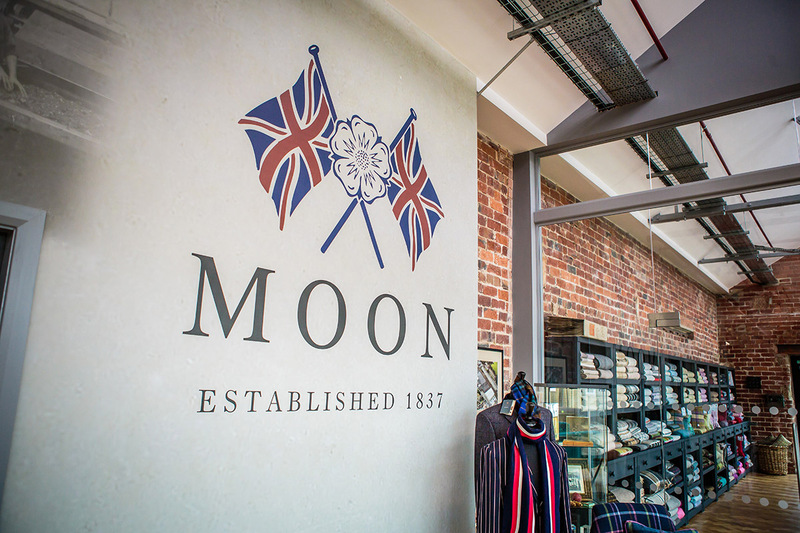 Abraham Moon is a weaving manufacturer in Yorkshire, the traditional home of the English cloth mills. 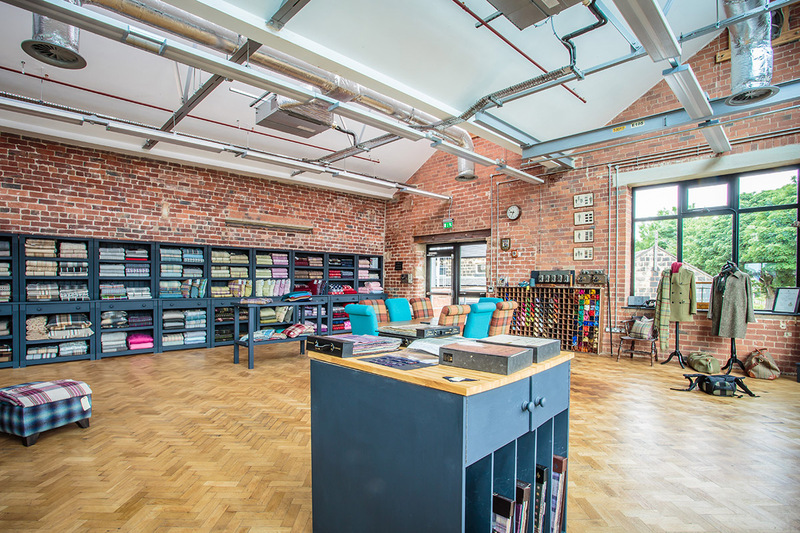 Following a successful project to design the refurbishment of a section of the mill building into a Design Studio, Office and Meeting Room, Bowman Riley Interiors was appointed design a Mill Shop. 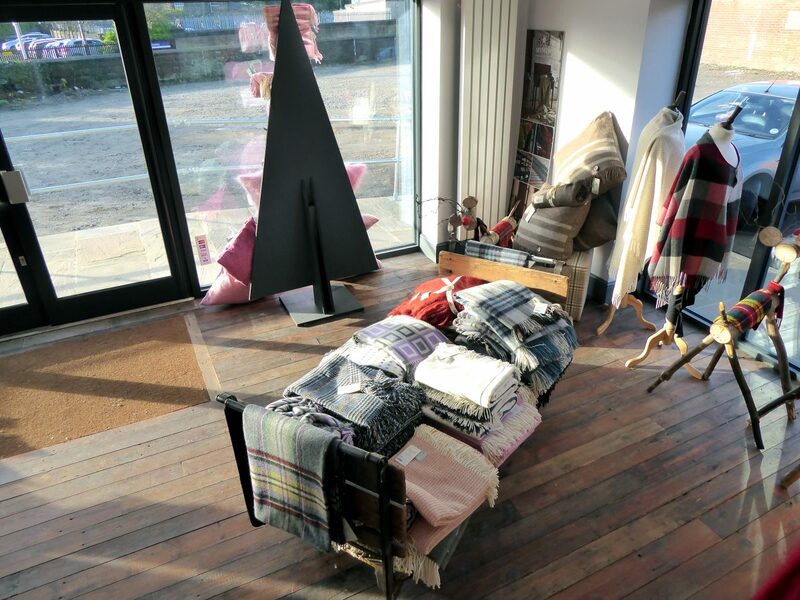 Abraham Moon sells to the trade, however, they operate a successful pop-up shop each December to sell their country apparel, high-end furniture upholstery, off-cuts and end-of -line fabrics directly to the public. 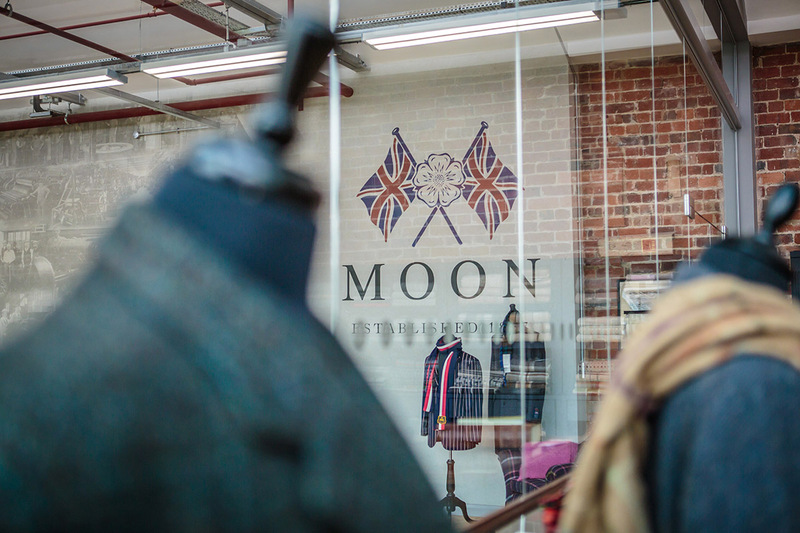 Abraham Moon wanted to create a permanent shop to enable them to trade to the public throughout the year. 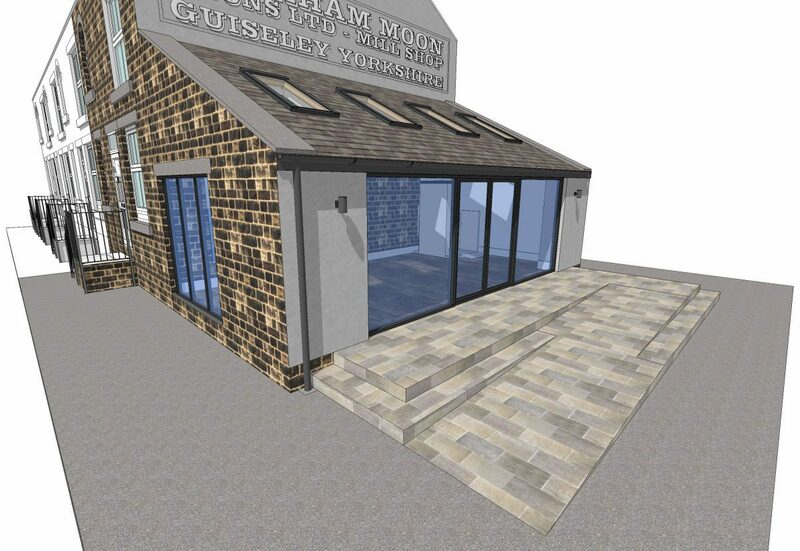 An existing workers cottage was identified on the mill site for conversion and a detailed feasibility was undertaken to explore the design, layout and future expansion for the shop. Following a presentation of the design concept, the scheme was developed into a full construction drawing package for tender. 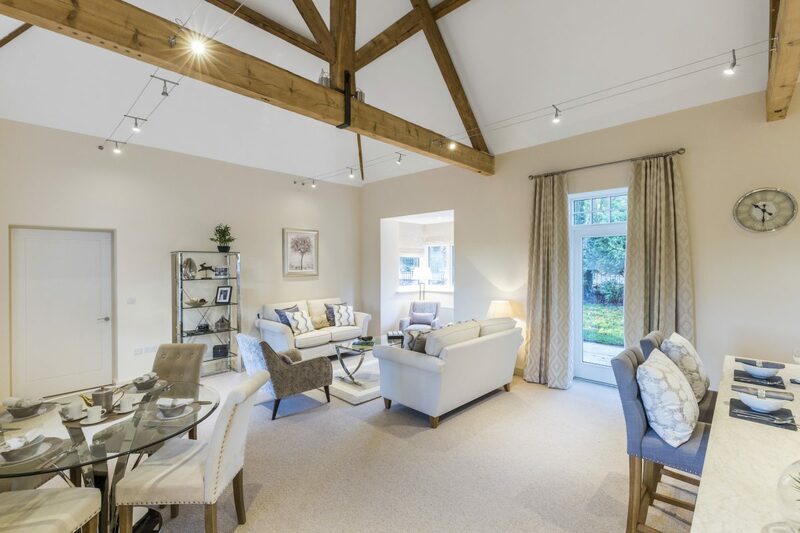 Our design involved removing the cottage’s internal walls and the ceiling to create a flexible open plan space with exposed roof beams. 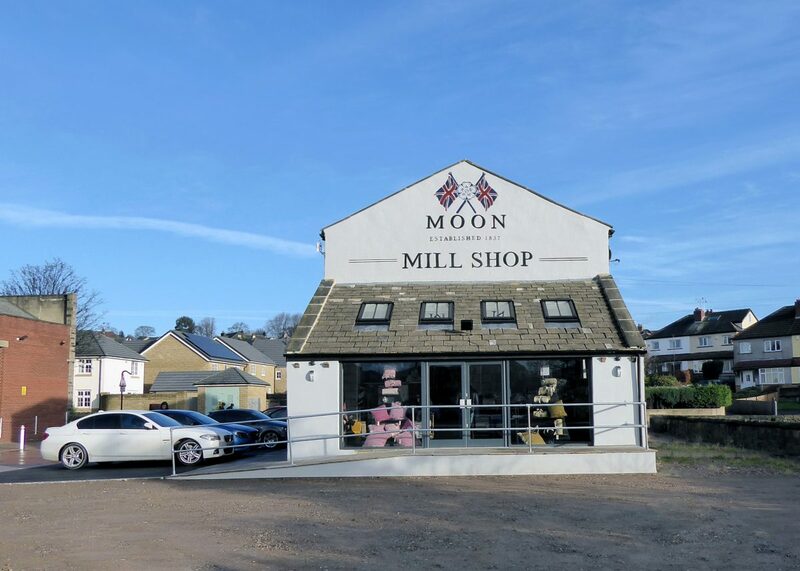 The heritage elements were retained including wooden floors and existing stone walls sandblasted a large feature sign was to be hand painted onto the gable end of the new Mill Shop. 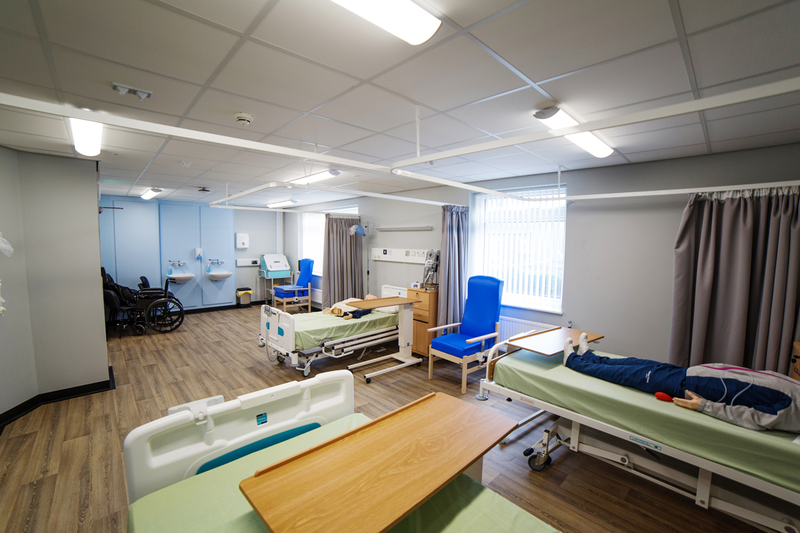 Under a framework agreement with Doncaster and Bassetlaw Hospitals NHS Foundation Trust, Bowman Riley was commissioned to provide the role of Principal Designer on the refurbishment and upgrade of two rehabilitation wards at Montagu Hospital in Barnsley. 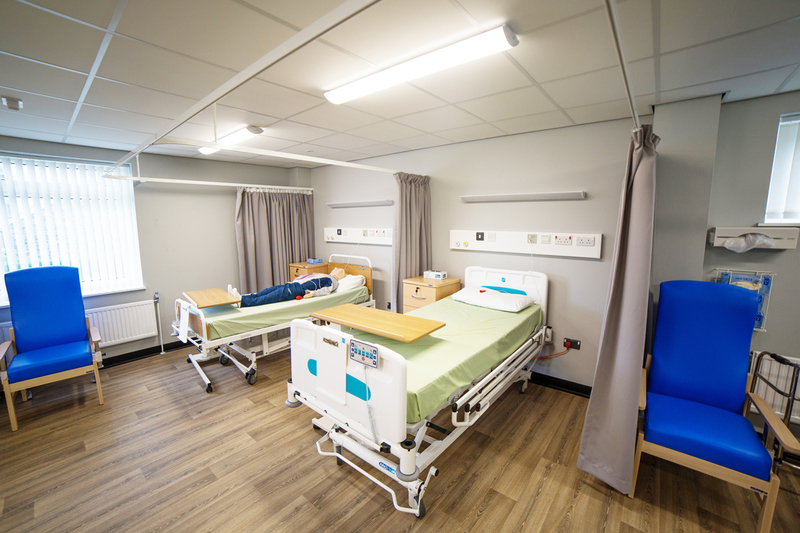 The project involved reconfiguring the Adwick and Wentworth wards from six to four bedroom wards with the provision of new en-suite facilities. 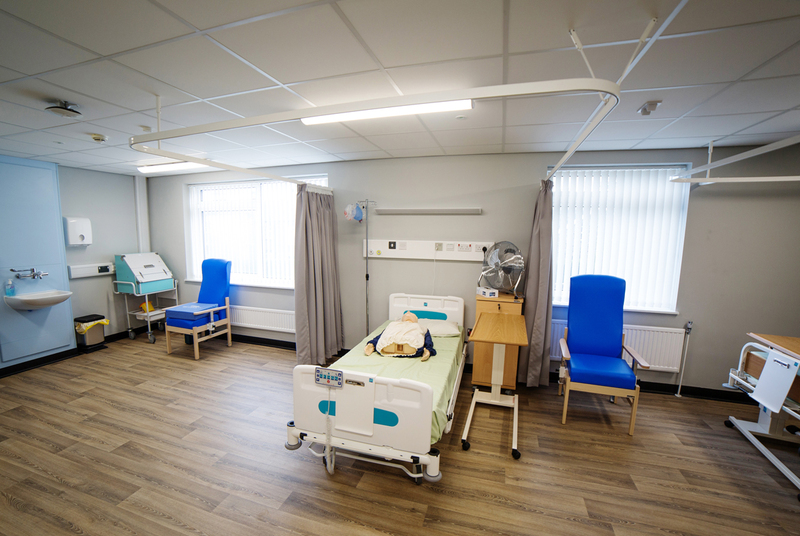 The refurbished wards have been designed to be bright, airy and conducive to the rehabilitation and the healing process. 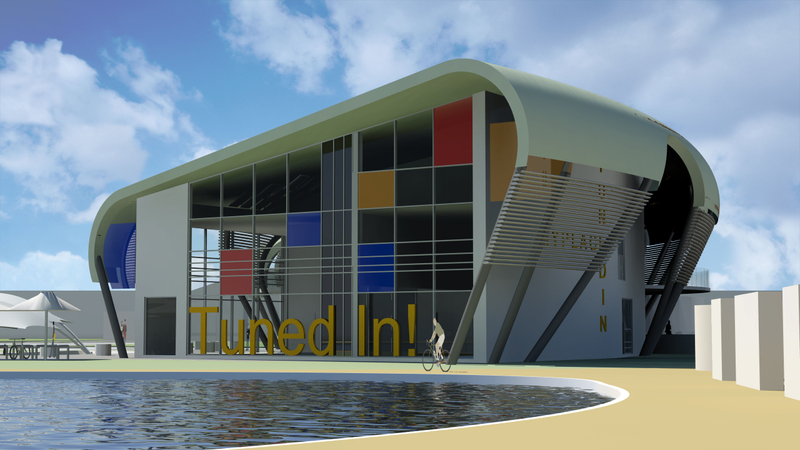 Bowman Riley developed the designs on Tuned In @ Myplace, a new build state-of-the-art media and arts facility for the young people of Redcar and Cleveland. 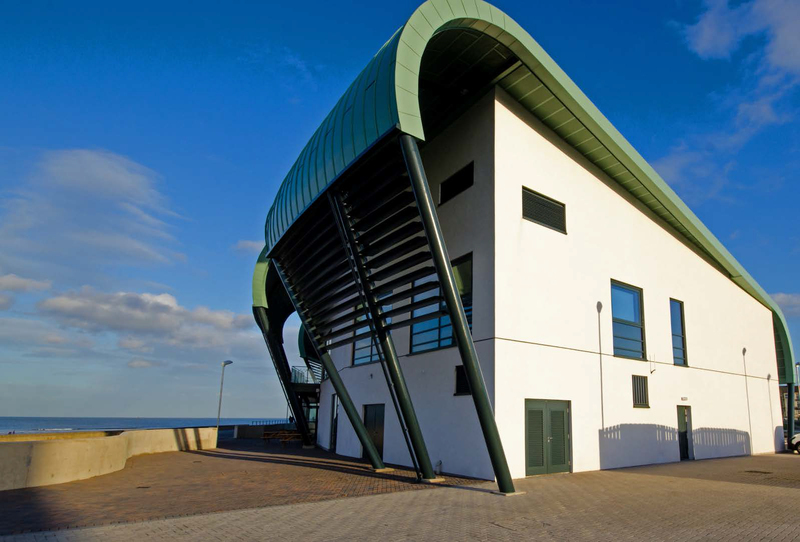 The building forms part of the wider regeneration of Redcar town centre and the sea front area and occupies a prime location on the promenade overlooking the sea. 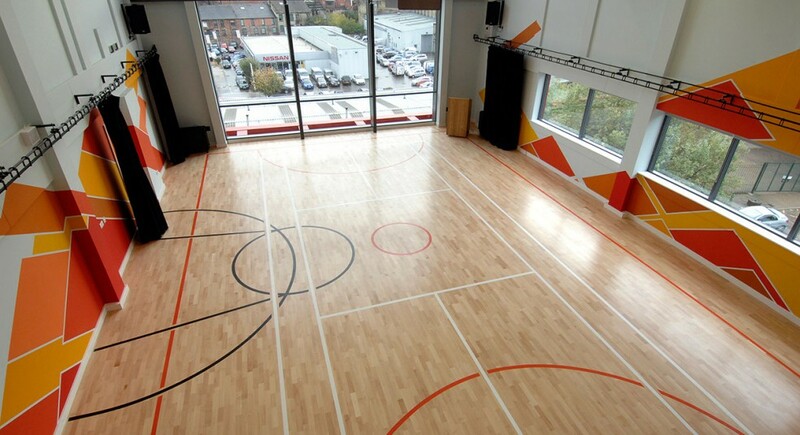 The centre is aimed predominantly at 13-19 year olds and was designed in consultation with the young users. 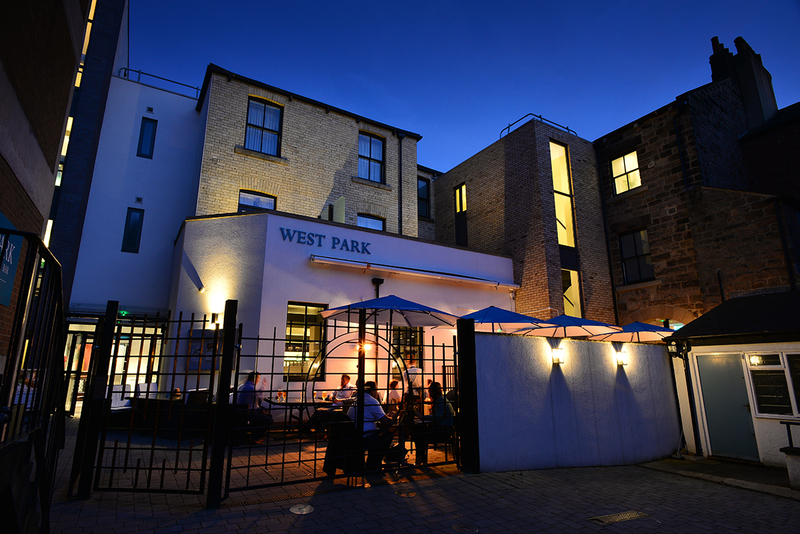 The facilities include a performing arts theatre, dance studio, juice bar, shop, consulting rooms, arts and crafts studios, IT suite, library, hair and beauty studio, gallery space, chill out areas, recording and radio studios, catering facilities and ancillary staff areas. Externally there is an amphitheatre performance space. 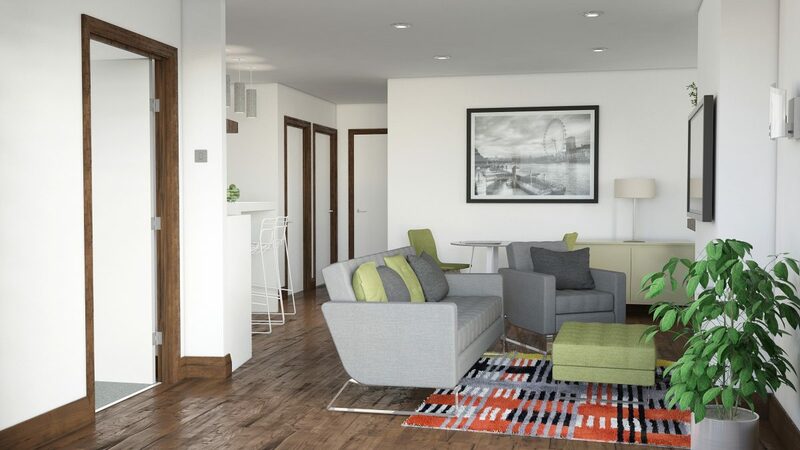 Tuned In@ Myplace was delivered to the client as a turnkey building including information technology and audio visual installations, furnishings, fittings and equipment. 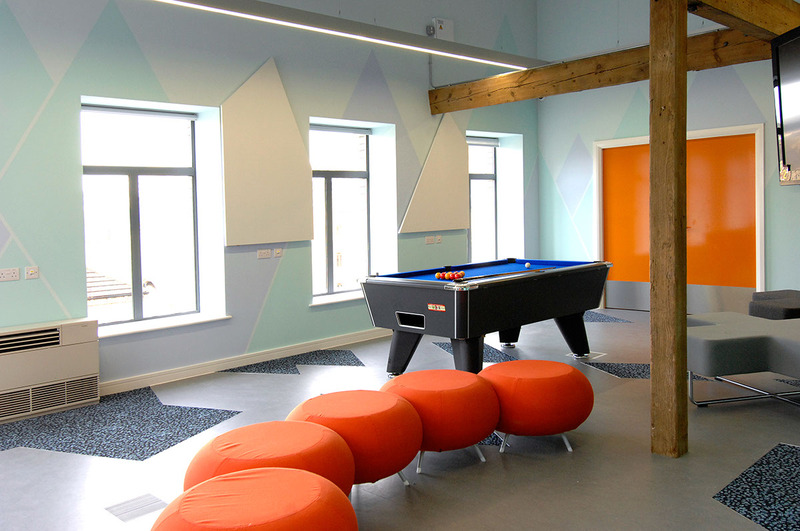 The project was part of the Myplace, Big Lottery Fund to deliver world class youth facilities driven by the active participation of young people and their views and needs. For over a decade Bowman Riley has helped soft drinks maker Cawingredients construct one of the most technologically advanced soft drink facilities in the country. 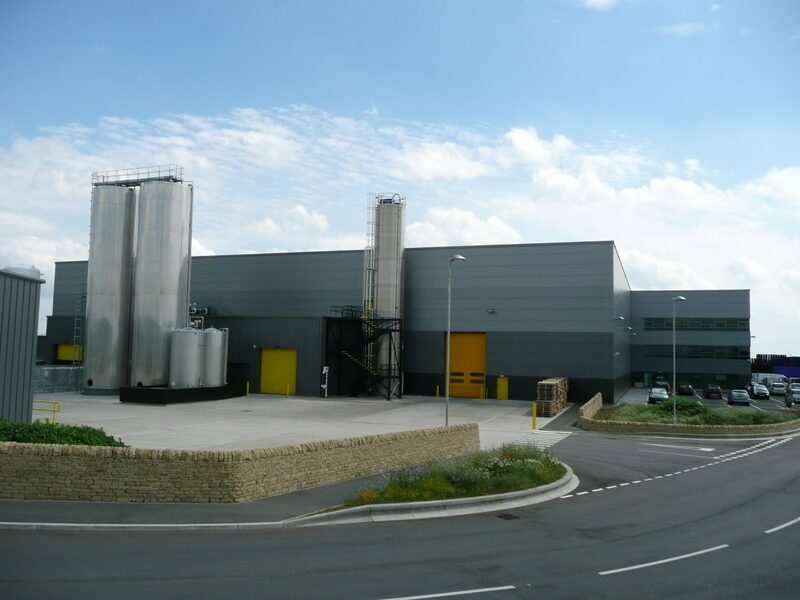 We provided the overall master planning of the site and designed a flagship factory to produce carbonated soft drinks supplying to major UK customers. 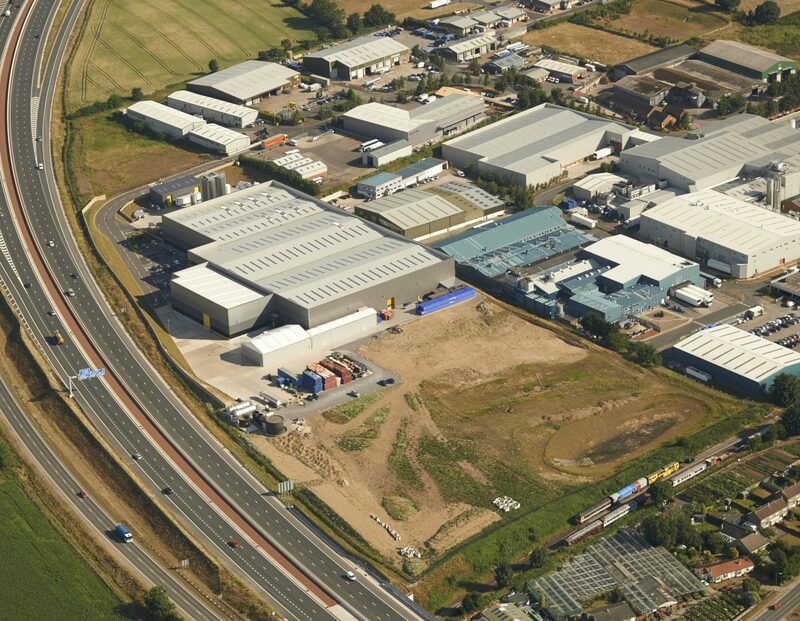 At the outset, we supported Cawingredients in identifying a suitable site (minimum 20 acres) for their new factory with excellent transport links to ensure that the company would not outgrow their premises once operations expanded. 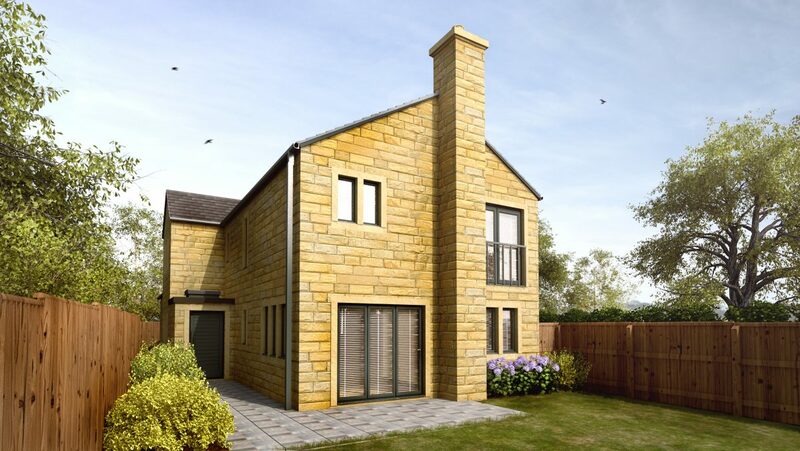 We assessed the viability of a number of potential sites before a plot alongside the A1 was identified. 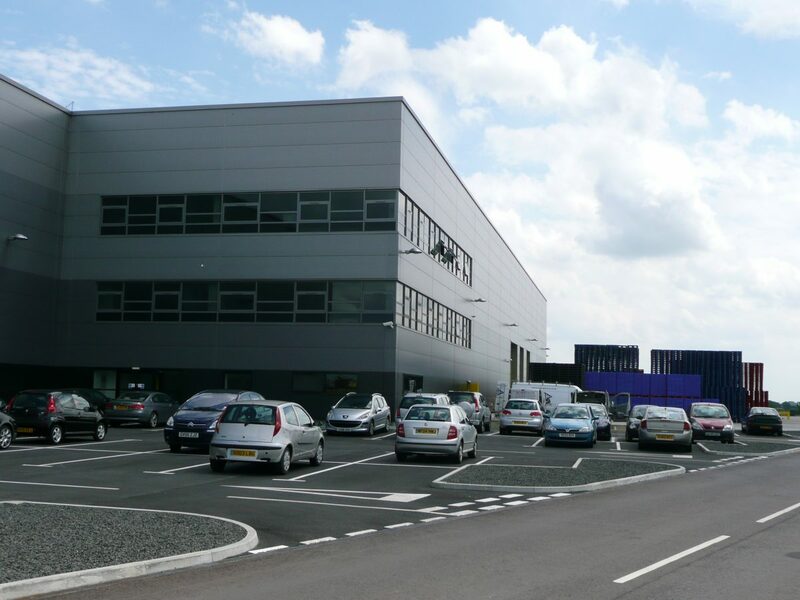 We designed a 11,2000 ft2 purpose-built factory, which houses production and bottling facilities, warehousing, water treatment plant, laboratories with ancillary offices, wagon yard and car parking. 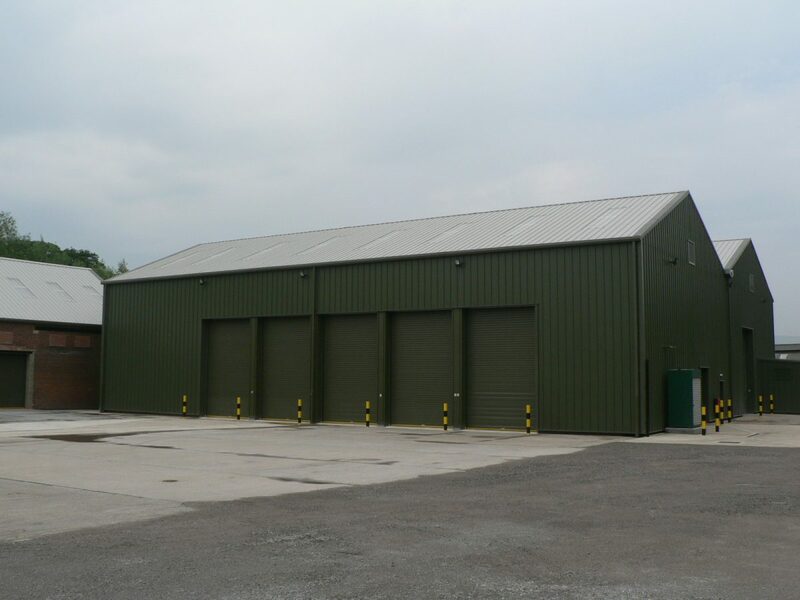 This building accommodated all the Cawingredients functions together with the long-term plan of creating a series of new buildings on site to decant various functions into as the business grows. 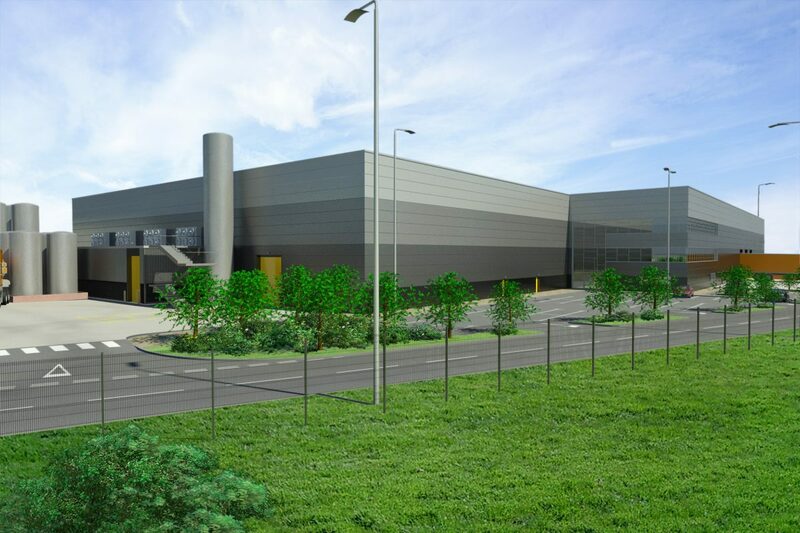 We designed the second phase to provide an additional 12,300 ft2 industrial space and there are now further phases including the creation of a vast 40m high warehouse, new stores, new car parking and water treatment plant. We have also assisted Cawingredients with strategic land purchases. 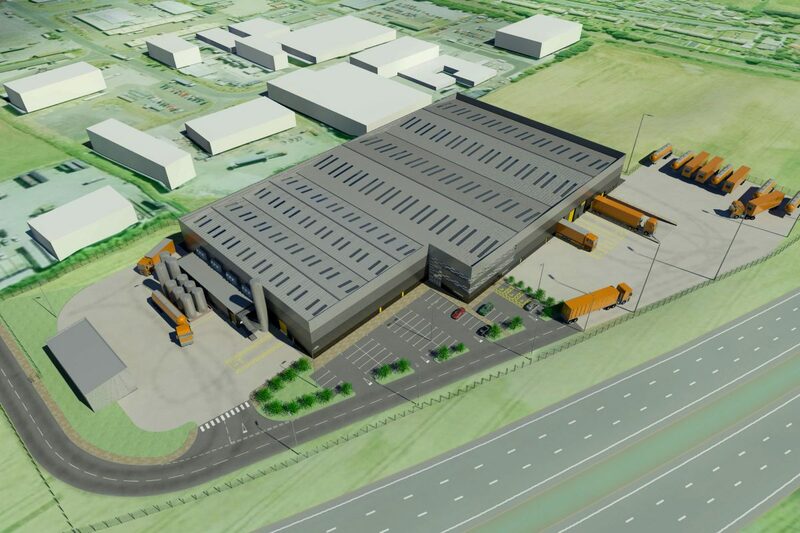 This work has created a new site entrance for all vehicular traffic, a new car park (to facilitate ongoing expansion), a new bespoke trade effluent plant and a new phased employment site (100,000ft2). 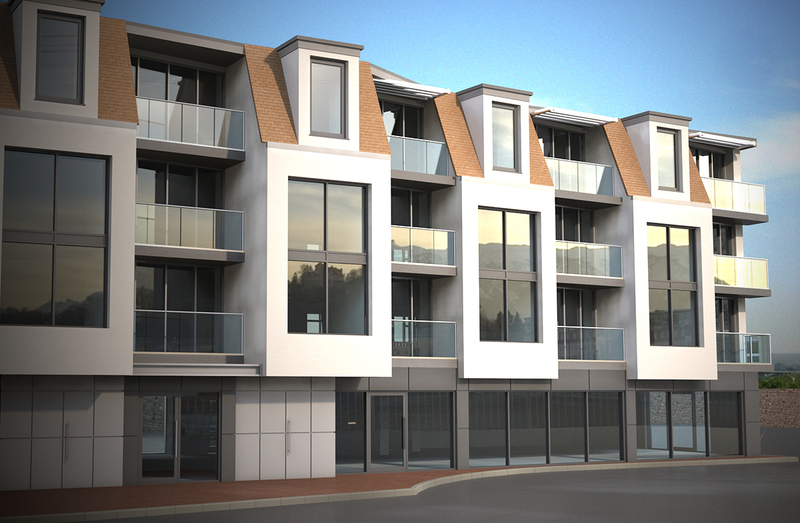 All of which has now secured planning consent. 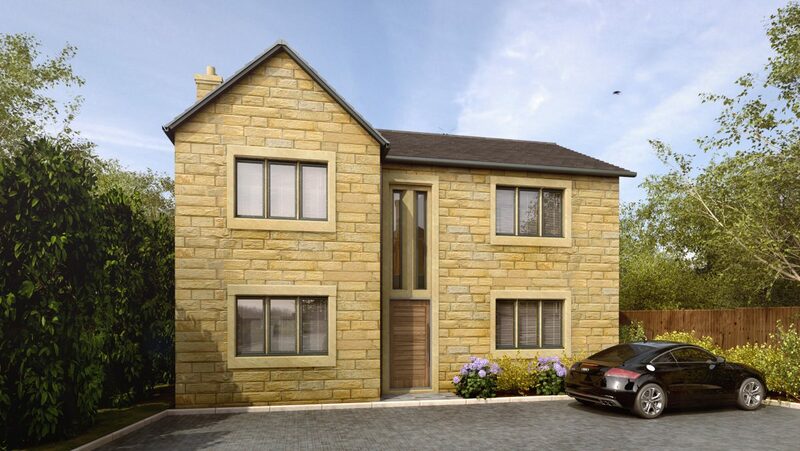 Construction work has now commenced on this latest phase of development. 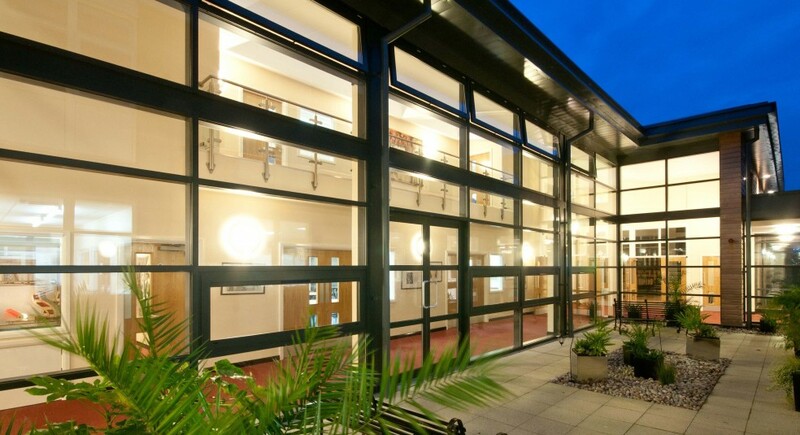 Harrogate Grammar School, an independent academy trust, is a specialist Language and Technology College in Harrogate with 1,700 pupils, of which 400 pupils are in the sixth form. 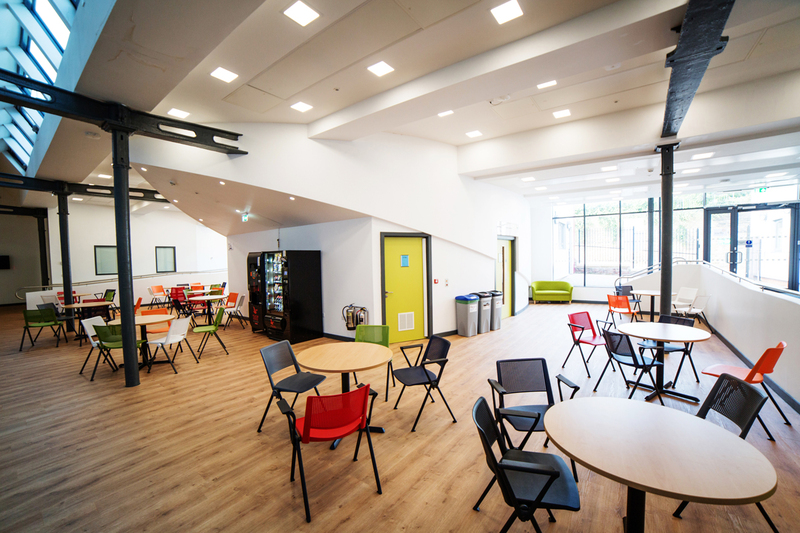 To accommodate the school’s ever-expanding further education 16-19 section, Bowman Riley was commissioned directly by the School to design and provide CDM coordination on a new £2 million Sixth Form Pavilion to replace temporary classrooms. The new Pavilion provides purpose-built, world-class facilities for the students to learn, succeed and be prepared to take the next step into higher education or employment. 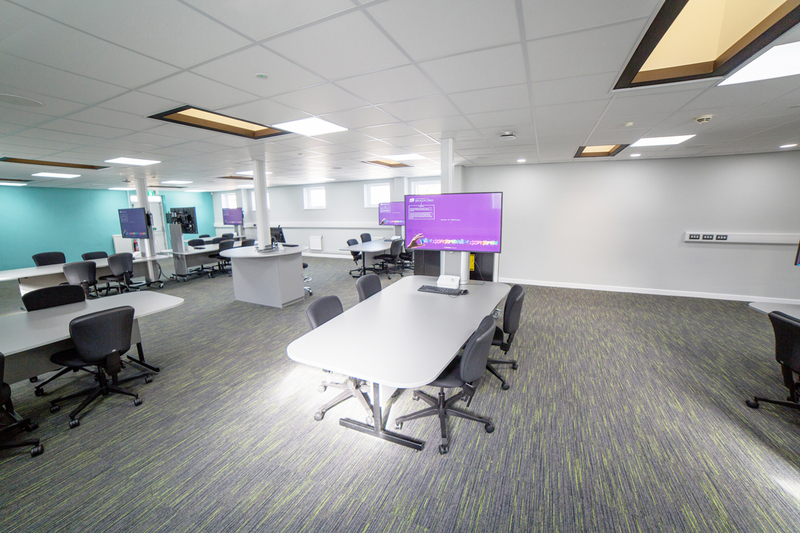 All sixth form facilities are now housed together on one site that contains well-equipped teaching classrooms, supervised areas for independent study, spaces for students to work collaboratively, laboratories, social spaces and a cloister garden. 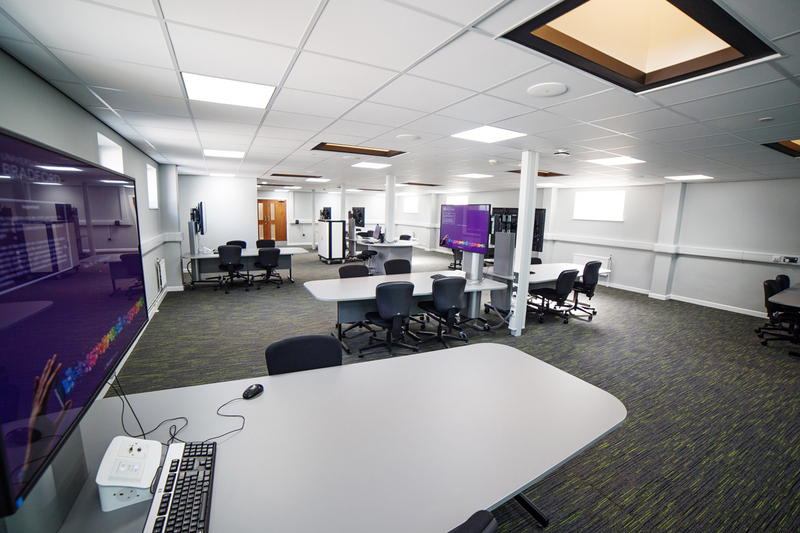 The laboratories are specifically for sixth form use and are fully equipped for the study of all three sciences at an advanced level. 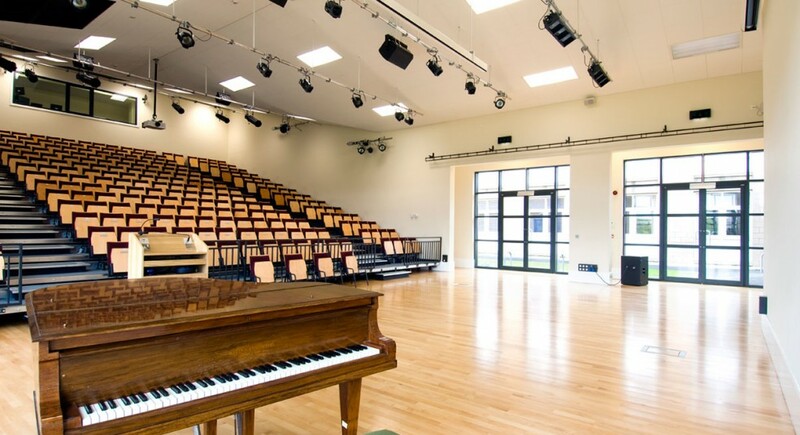 The Forum is a lecture theatre with retractable seating of 300, which provides a focal point for the academic work of the school and accommodates a variety of events including conferences, open days and student performances. 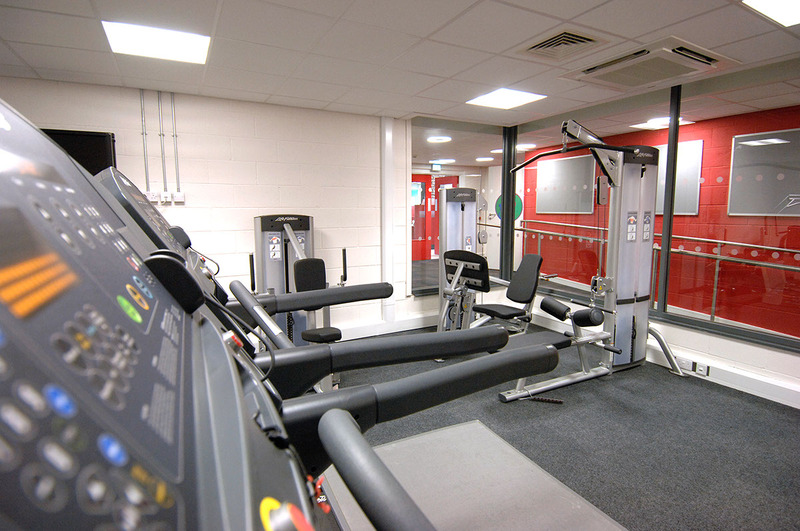 Harrogate Grammar School is proud of their outstanding sixth form facilities, which are matched by the outstanding achievements of their students. 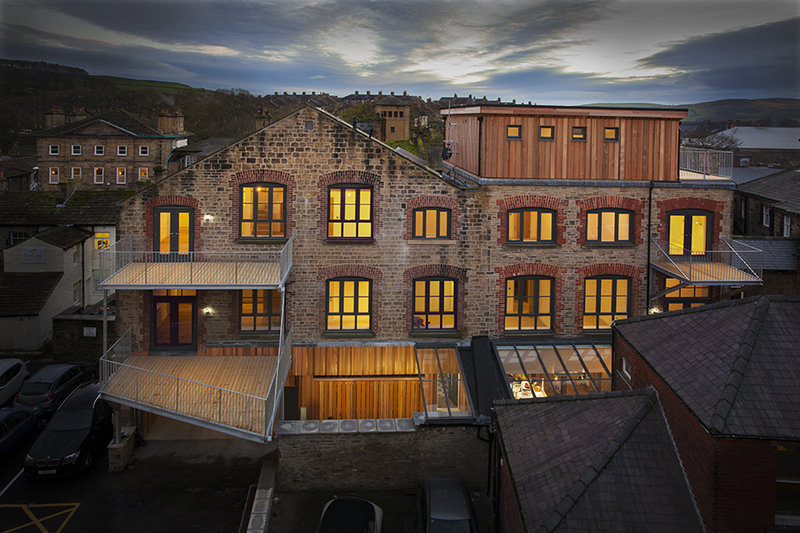 Bowman Riley provided the roles of architect, client’s agent, party wall surveyor and principal designer on a new research and innovation centre for The University of Bradford and the Digital Health Enterprise Zone created to support the research and development of digital health innovations to improve the lives of people living with long-term conditions. 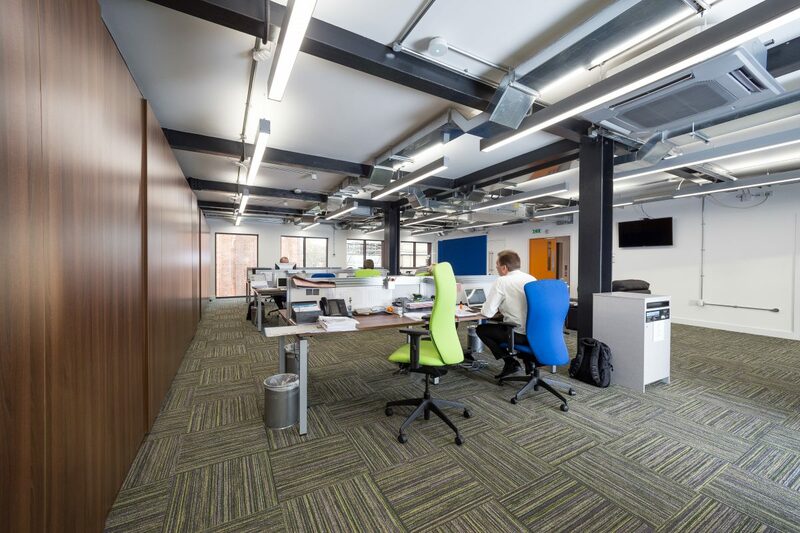 The rambling and under-used 19th-century mill complex, Phoenix South West, on the University’s campus has undergone an extensive transformation to become a leading edge digital health research facility entitled the Digital Health Enterprise Zone Academic Building. 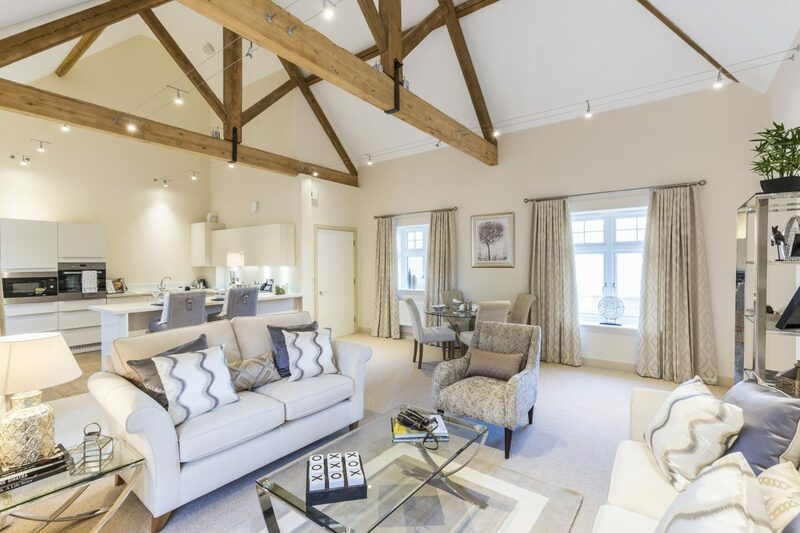 The design retains many original features including cast iron columns and a structural frame supporting a north-light roof profile to a large part of the building. It is the University’s focal point for access to the newest technology, research, and projects in digital health. The key design challenge involved creating a visual identity for the various parties housed in the Centre as a unified community and to provide a gateway to the campus that is accessible to the public. 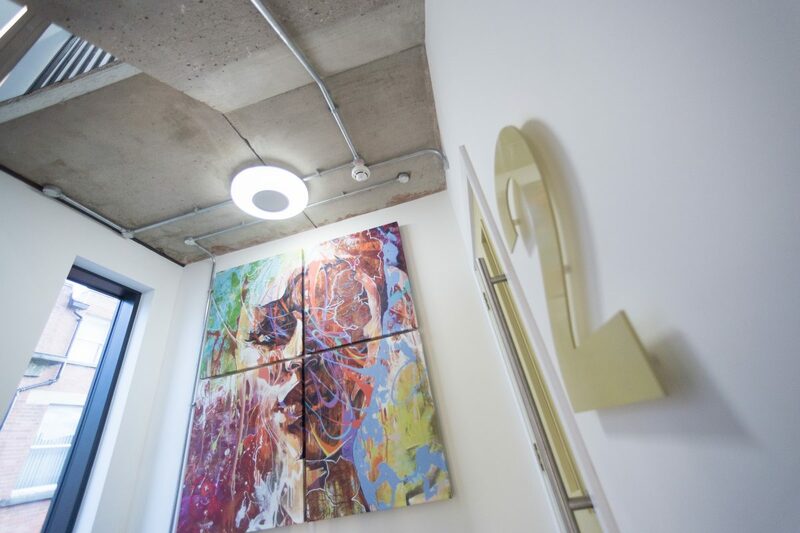 The centre offers four floors of research, learning, exhibition and business incubation space. It has public clinics for physiotherapy, eye examinations and reviews of patient medicines. 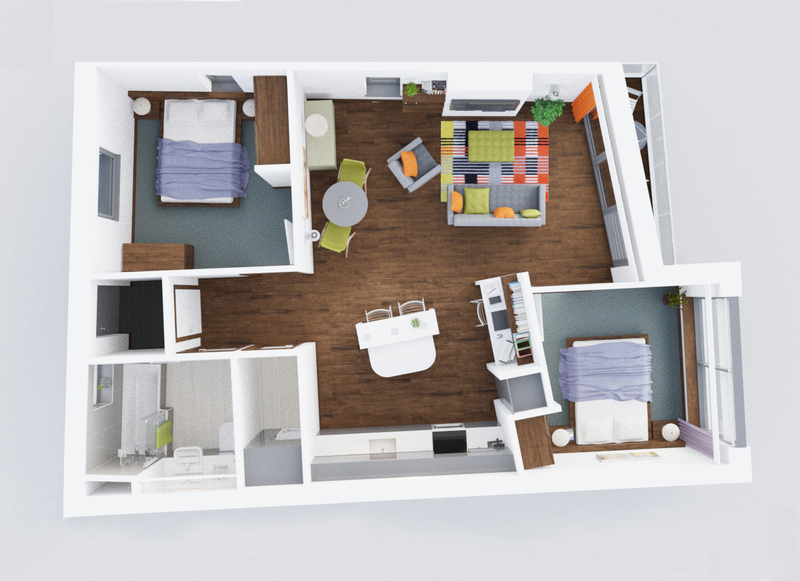 A key feature is a full-size two bedroom Technology Smart House that links to a 50-seat lecture theatre. 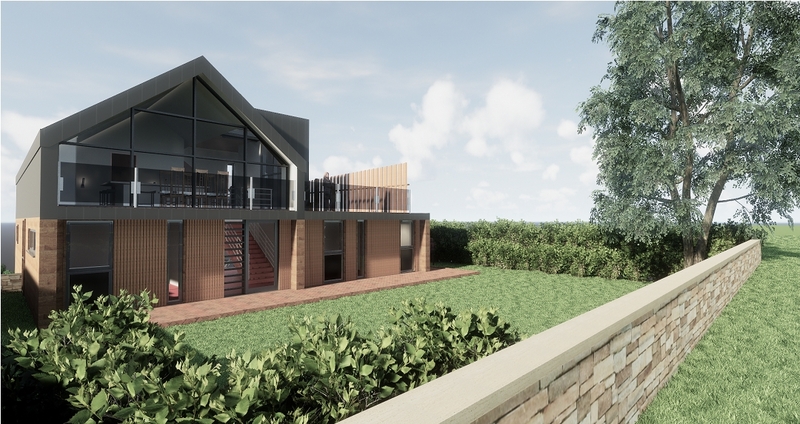 The Technology House will serve as a dynamic demonstrator of research and undergraduate and postgraduate projects to showcase technological advancement in digital health that can benefit people in their homes. 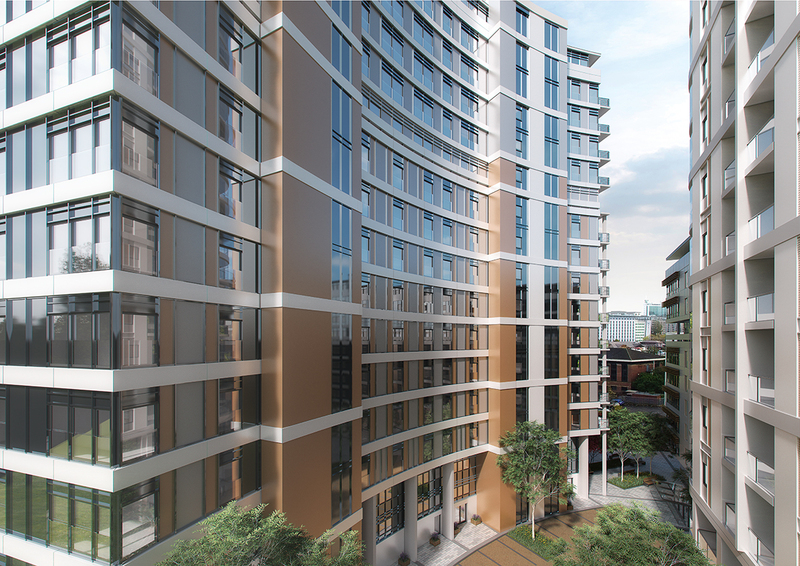 Bowman Riley has played a pivotal role in the delivery of the building from condition surveys and feasibility reports to the full design of the project. 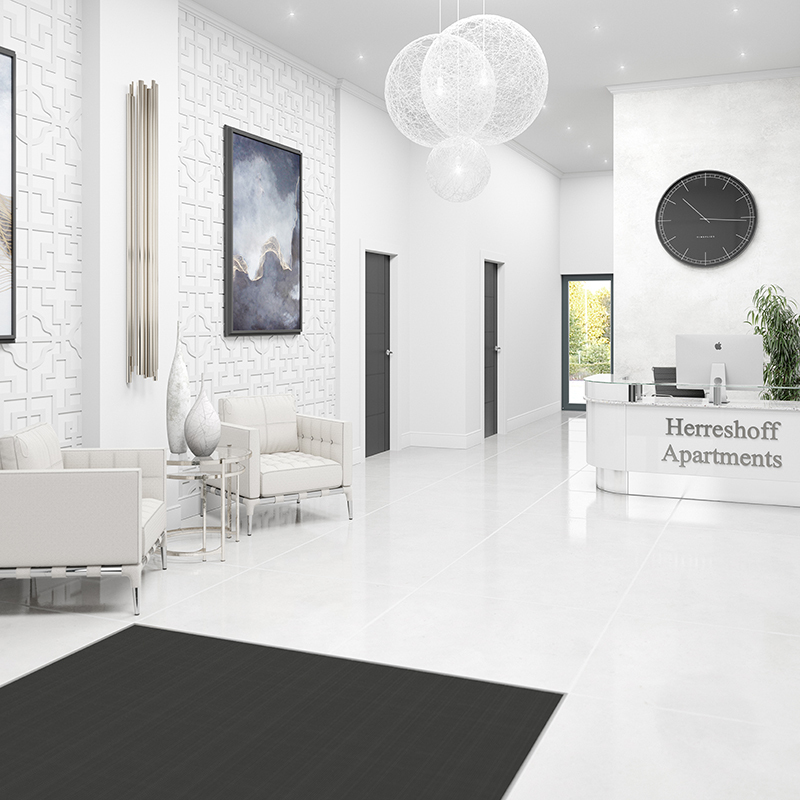 Our client’s agent oversaw the project’s delivery to ensure that the client’s vision was maintained and the works were completed to the highest standard. 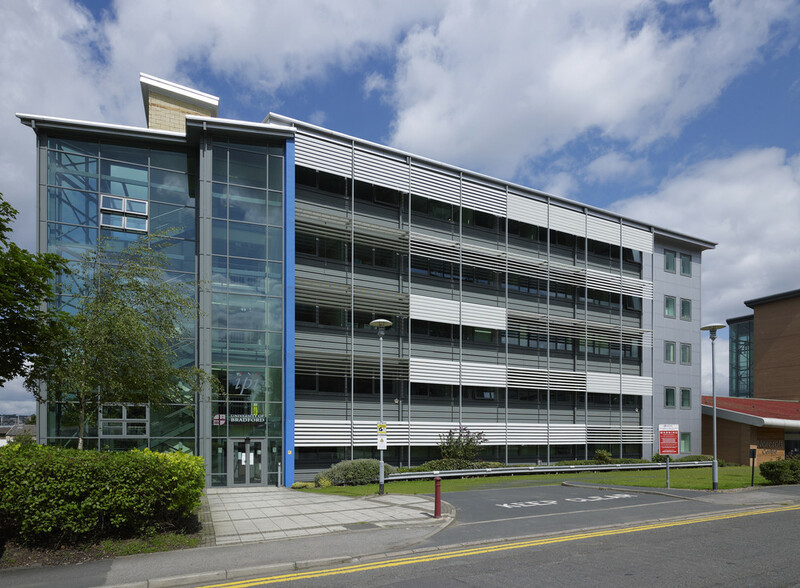 Bowman Riley Building Consultancy was commissioned to provide design and management and the role of principal designer on the refurbishment of facilities within the 1960s Richmond Building and Norcroft Building on the University of Bradford campus. 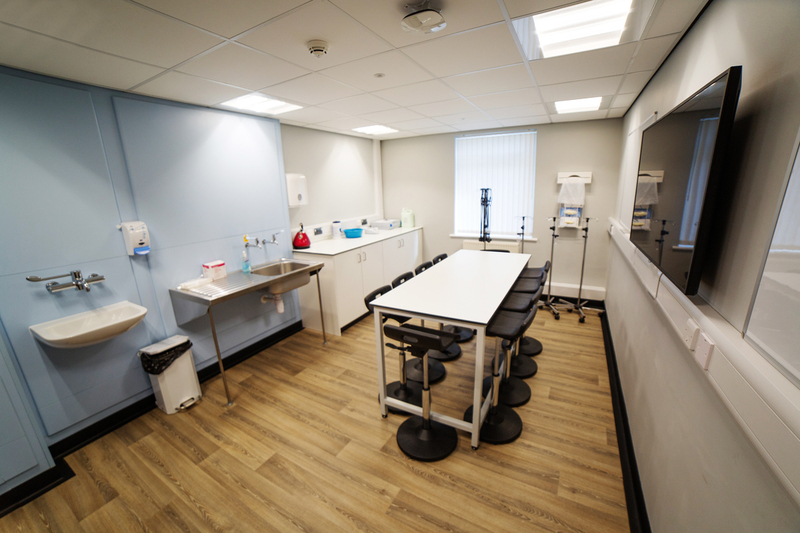 The University needed to refurbish a combination of Cat 2 and general laboratories, radiography facilities, 3D printing facilities with offices and high quality exhibition areas for the School of Life Sciences. 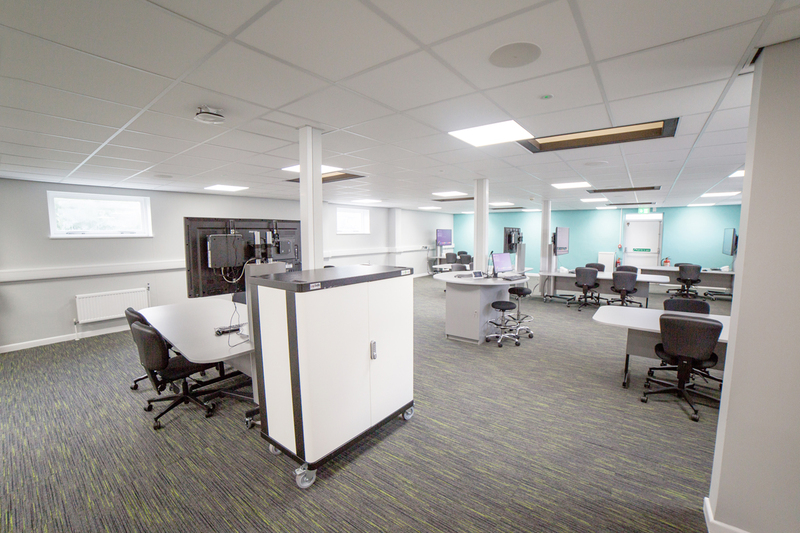 It was important to ensure that the structure and services in the building were suitably designed in terms of load and vibration to accommodate the high-tech laboratory equipment. 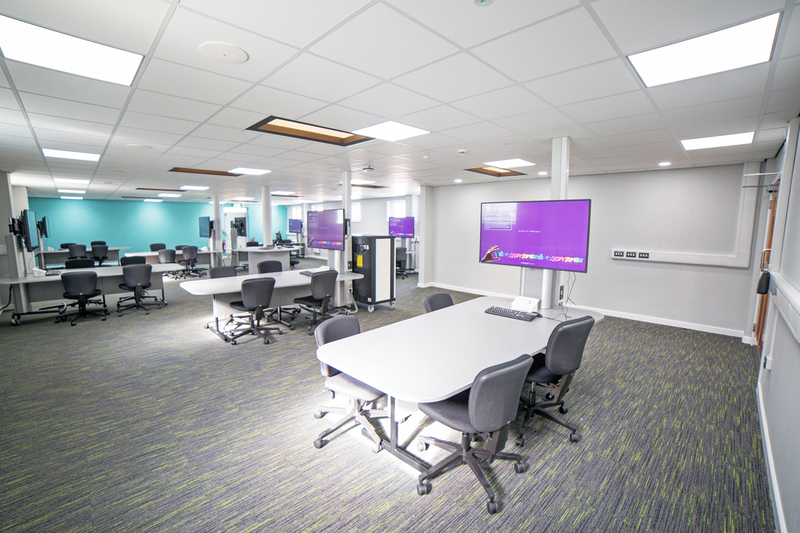 The new facilities were designed to achieve technical performance whilst creating high quality, contemporary teaching facilities that represent the first class standards the University aspires to provide for its students. 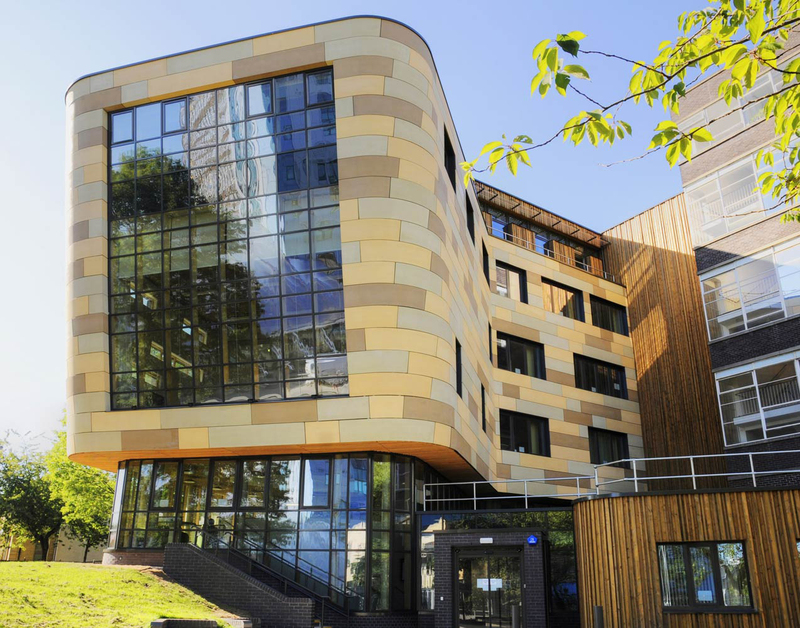 As part of the wider campus development, the project was designed to enable the University’s new Health & Wellbeing Centre come to fruition by decanting the School of Life Sciences into the Richmond Building. 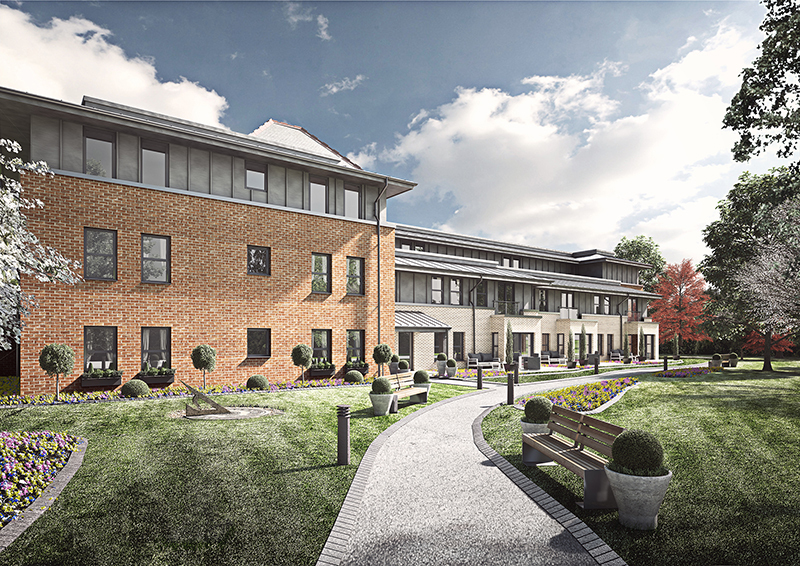 The project involved working across three sites with the management of multiple stakeholders within tight time scales. 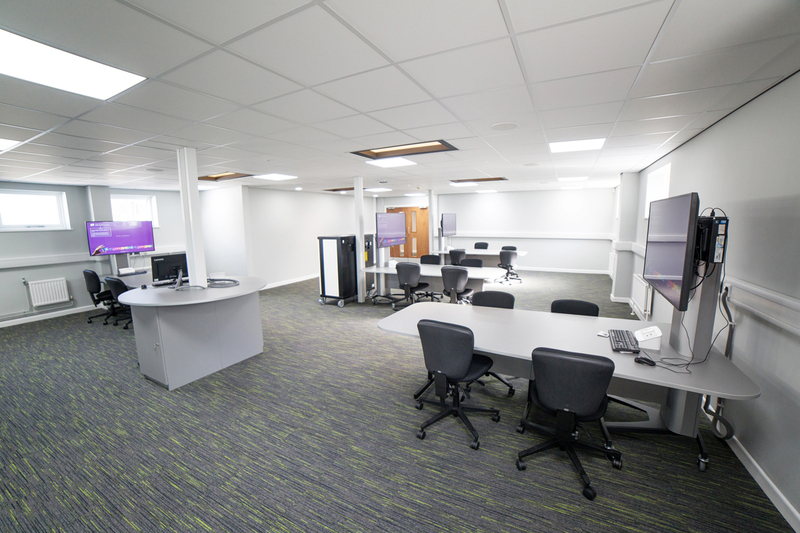 The refurbishment was undertaken in a live teaching environment. The management of the works was cognisant of noise levels and University staff were relocated as necessary during the project duration. Won through competition, Bowman Riley was commissioned to redesign the interior of the University’s Atrium building adjacent to the 1960s Richmond Building on the city campus and also provided the role of CDM Coordinator. 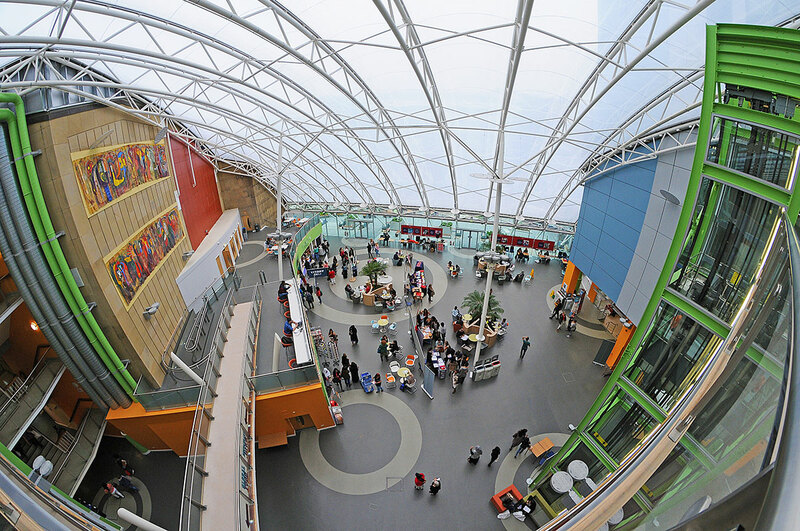 Built in 2006 the light and airy Atrium is a flexible dynamic space used by the University for informal meetings, open days, recruitment fairs and graduation shows. 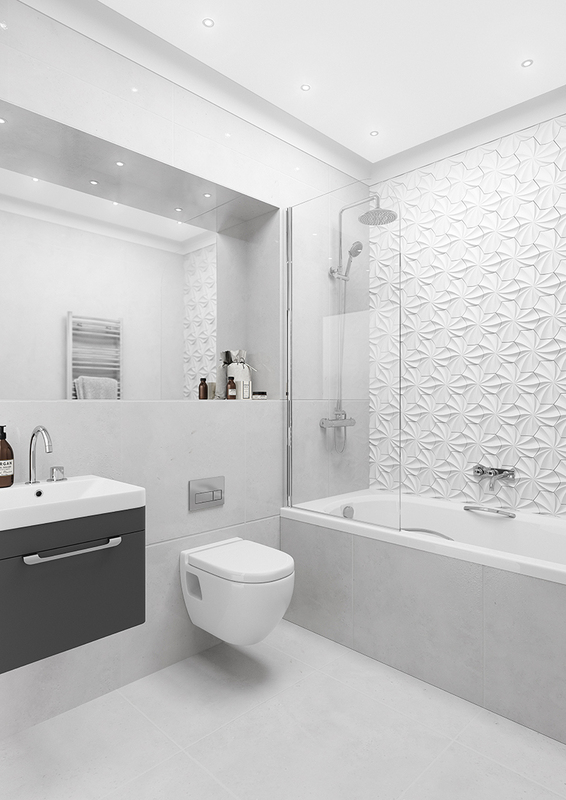 Our design focus was to refresh the space and overcome issues concerning sound, drafts and heat, which were detrimental to the space usage. Dual purpose solar shading in the form of Acrylic discs was suspended across the space to act as an acoustic barrier and create a scriptural feature. 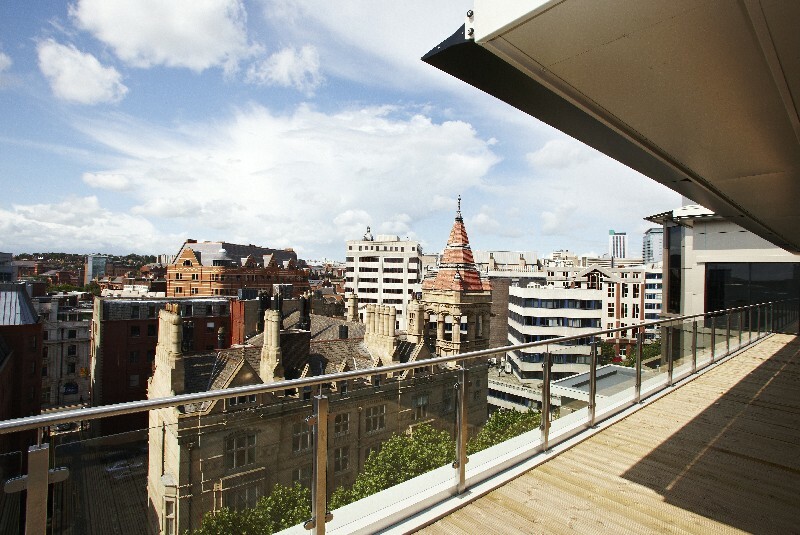 The flooring and furniture were replaced with contemporary furnishings and the balcony balustrade was refurbished to enable a built-in LED video wall displaying imagery. 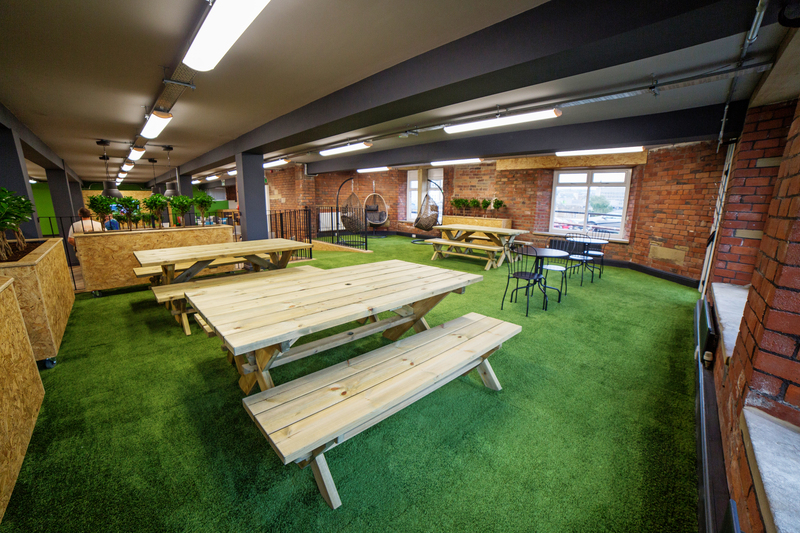 We also worked in collaboration with a landscape architect to regenerate the under-utilised external space adjacent to the Atrium providing a green breakout space. 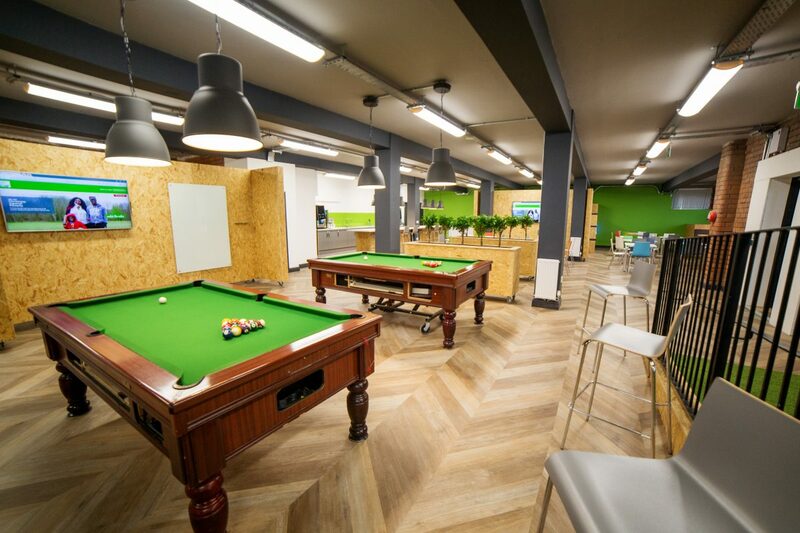 Our designs have enhanced the Atrium creating a more appealing environment for staff and students and for external hire bringing additional revenue to the University. 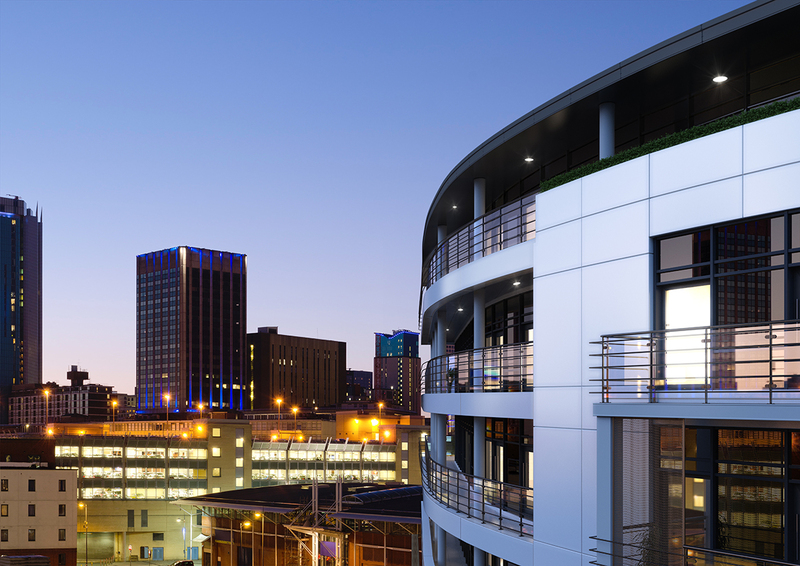 Bowman Riley’s solution was to create a new external lift shaft and walkway. 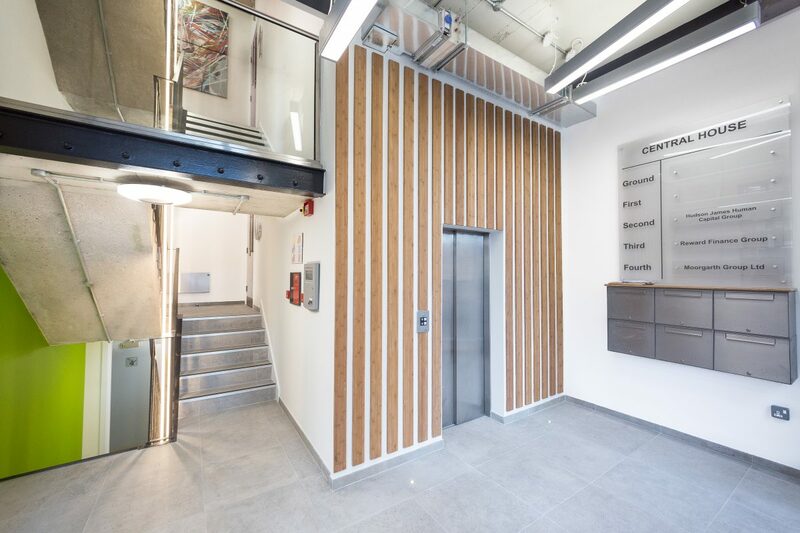 Centrally located, the lift provides access for all library users and improves the fire evacuation process for disabled users. 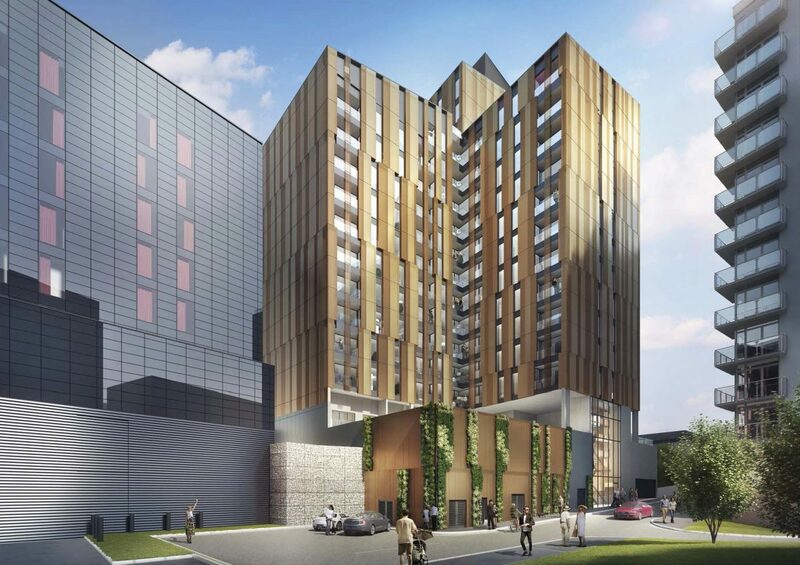 Initially the planners insisted on a traditional brick construction for the new lift, which is labour intensive, costly and has increased health and safety risks. 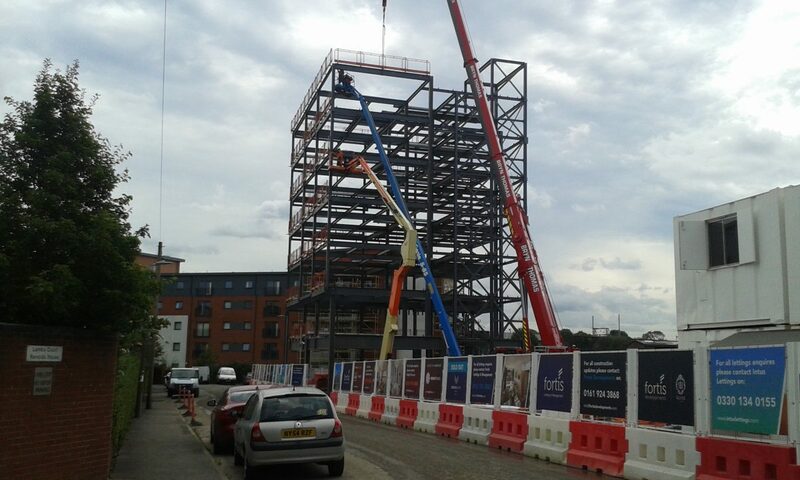 We actively engaged with the planners in the design process through early and continued consultation, which resulted in the agreement to install a steel frame lift shaft with a robust high performance cladding system. 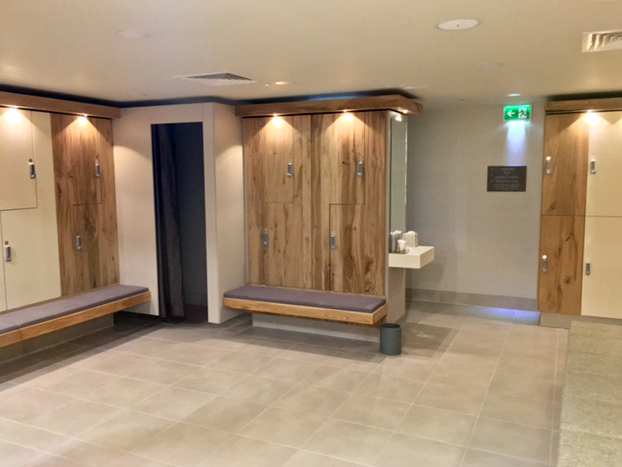 This reduced the construction programme on site, provided a financial cost saving and reduced disruption to the day to day activities of the highly utilised library facilities. 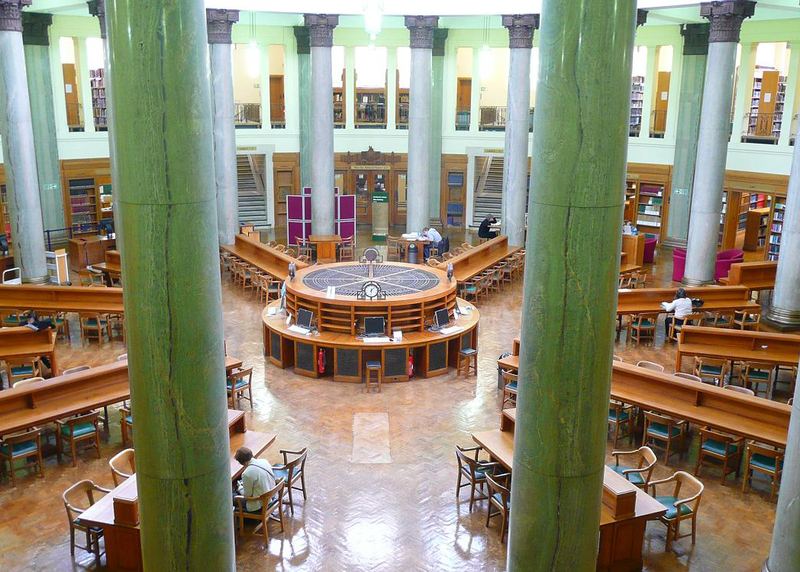 The design enables wheelchair users to obtain access to all floors of the Brotherton Library independently and with assistance if required. 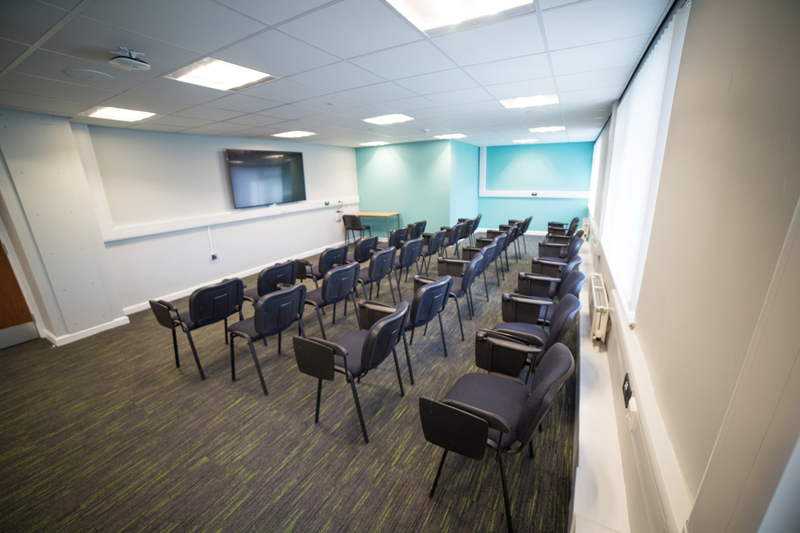 Bowman Riley was commissioned to provide project management, design and specification, CDM coordination and cost consultancy services to transform an existing conference facility into an IT centred Team Based Learning suite. The University introduced Team-based Learning, as a structured, student-centred learning and teaching strategy designed to promote active learning through a process of preparation, testing and application of knowledge. The University advocates that by regularly participating in team-based learning, students develop transferable skills that will develop their capabilities for the workplace, enhancing their employability. 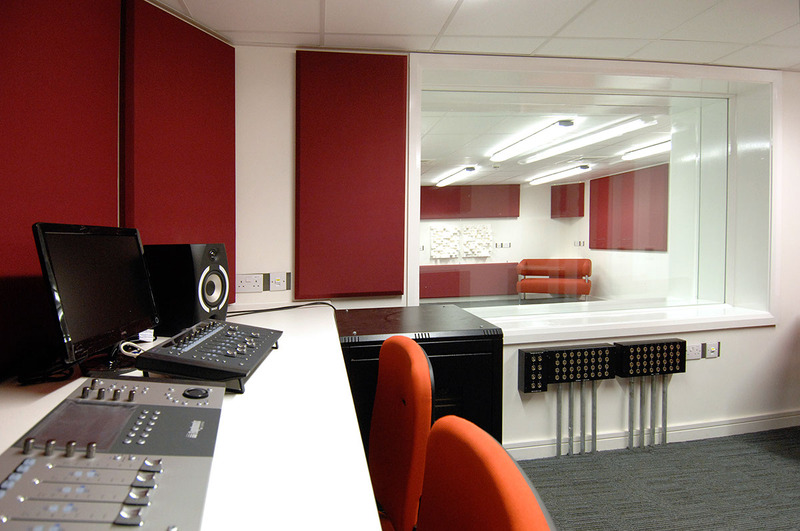 Bowman Riley worked closely with the University to integrate and coordinate audio-visual technology, IT and electrical installations. 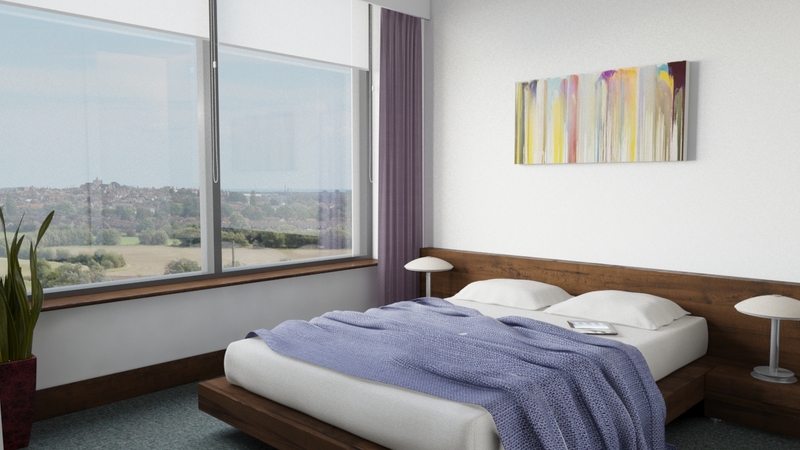 This was critical to ensure the furniture layouts and equipment achieved full capacity and performance. 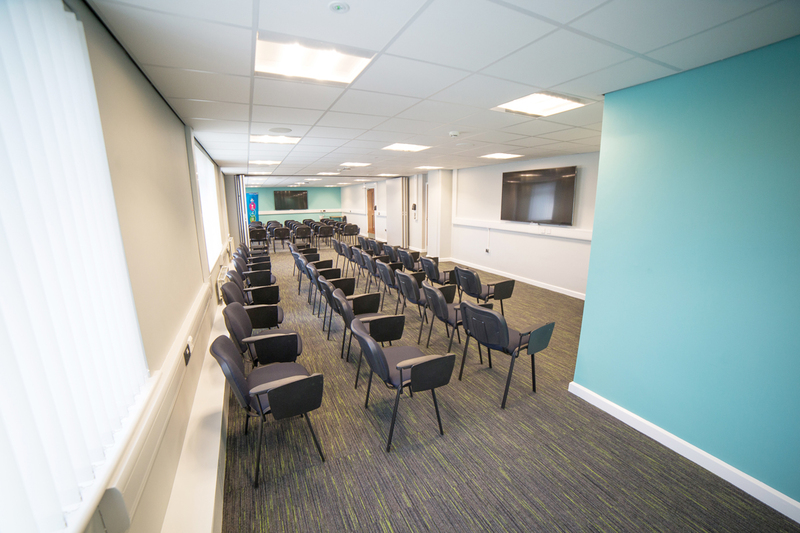 The existing conference facility was completely stripped out and a new internal ramp, raised access floor and acoustic doors were installed. 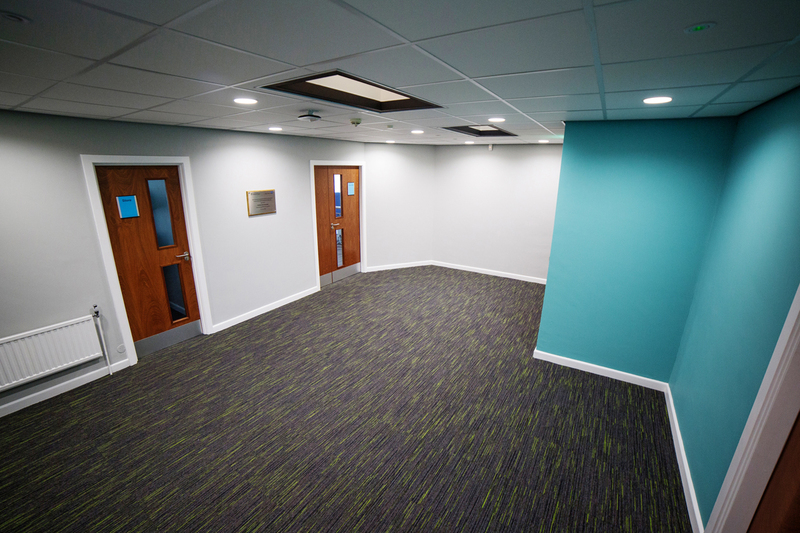 High quality ceilings, carpets, doors and wall finishes were installed to create a first class learning environment. The result is a new state of the art computer based learning facility for University students designed to promote active, engaging and sustainable learning. 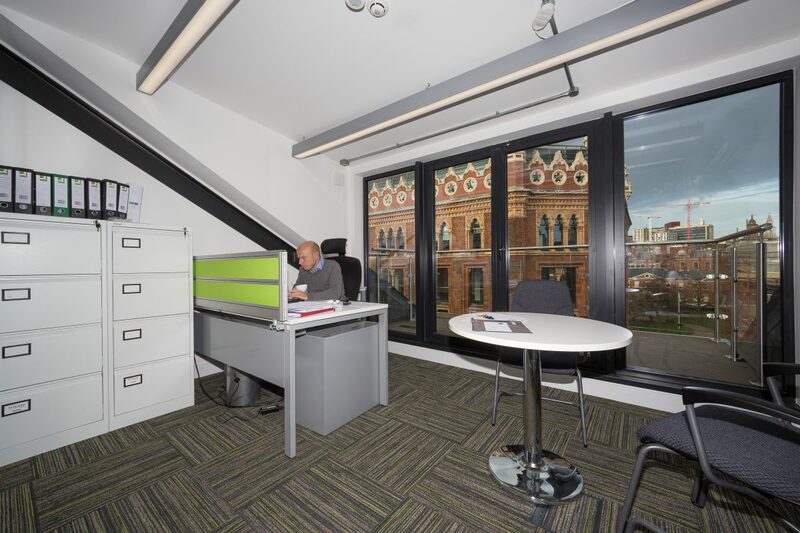 Bowman Riley was commissioned by the University of Bradford to provide design services, project management and CDM coordination on a number of refurbishment projects on the Horton and Chesham buildings. 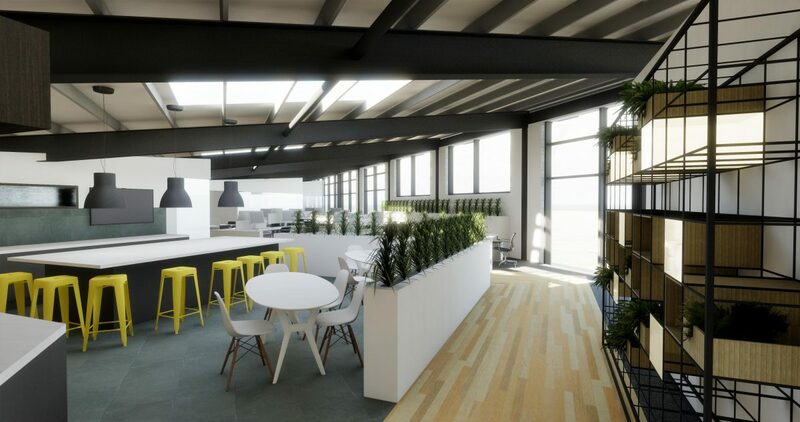 Both 1960s buildings needed substantial refurbishment works to improve their aesthetics, functionality and energy efficency. The Chesham Building is occupied by the School of Engineering, Design and Technology and houses an Art Gallery. 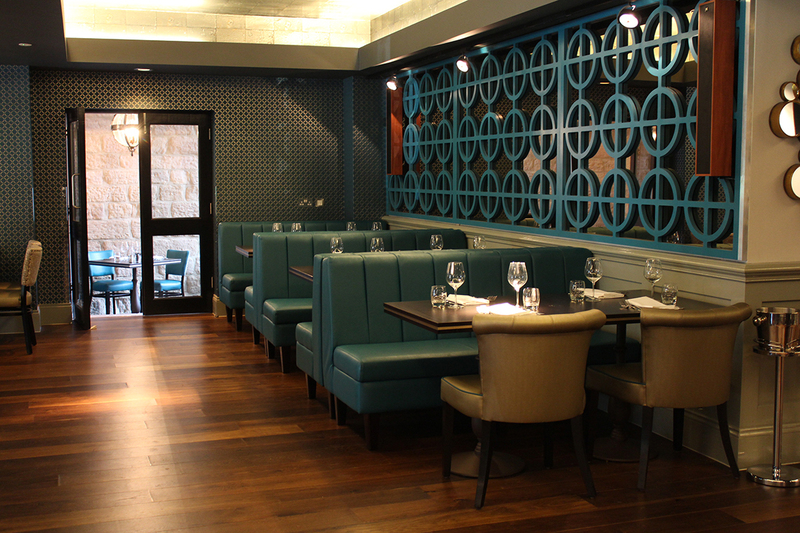 We designed and managed the internal refurbishment of the building. 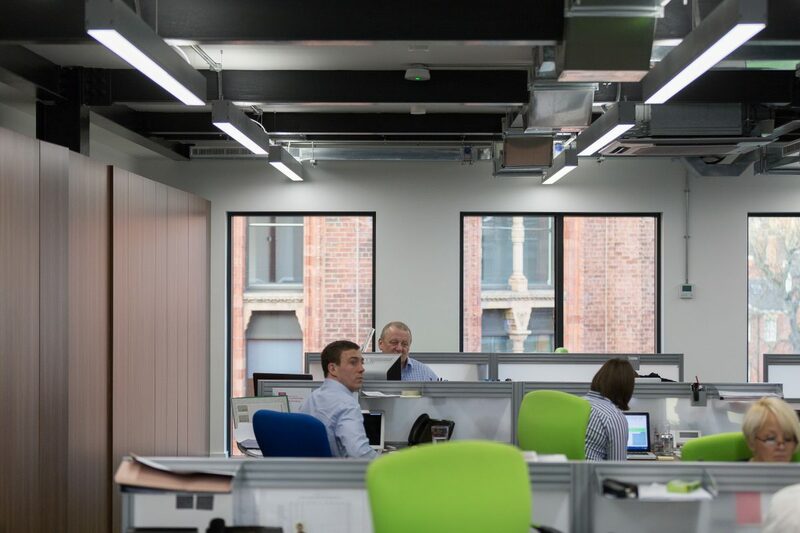 This involved stripping out the existing offices and academic spaces and reconfiguring the spaces to create open plan offices, meeting rooms and cellular offices with new air conditioning. 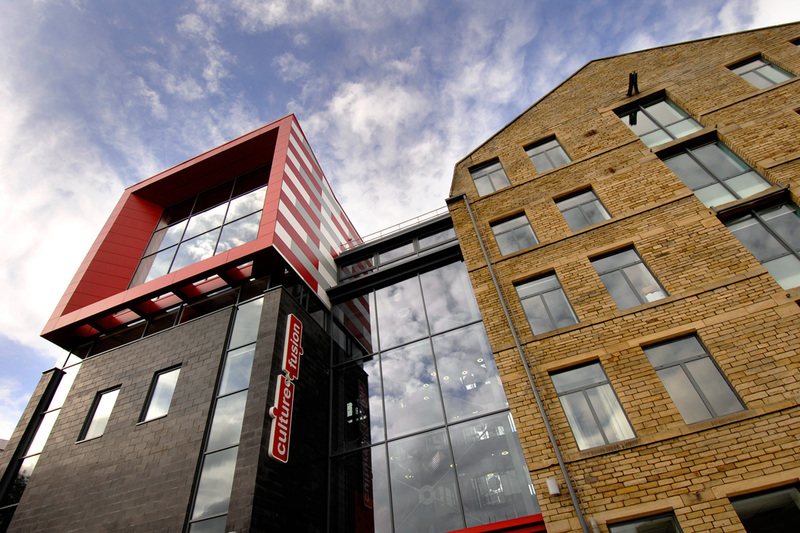 The Horton Building is occupied by the School of Computing, Informatics and Media and houses computer suites and media laboratories including a TV studio. 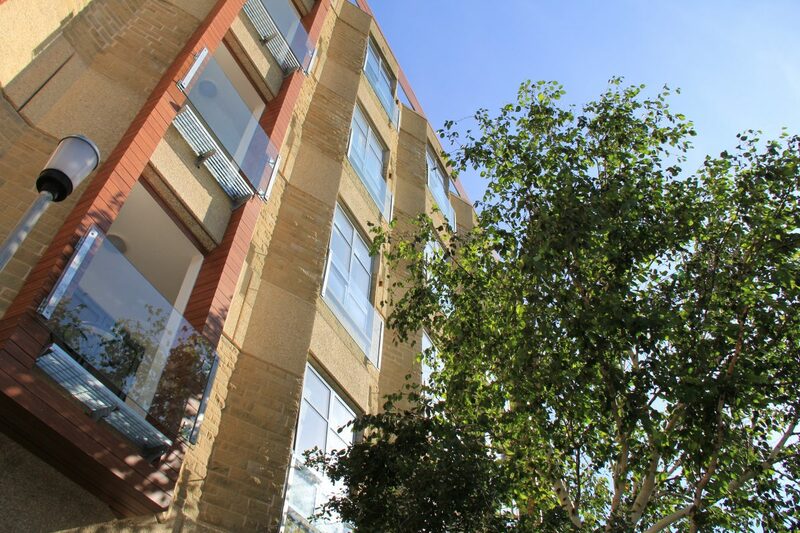 We were involved in the re-cladding of the building to enhance its appearance and energy efficiency and the internal refurbishment of three floors. 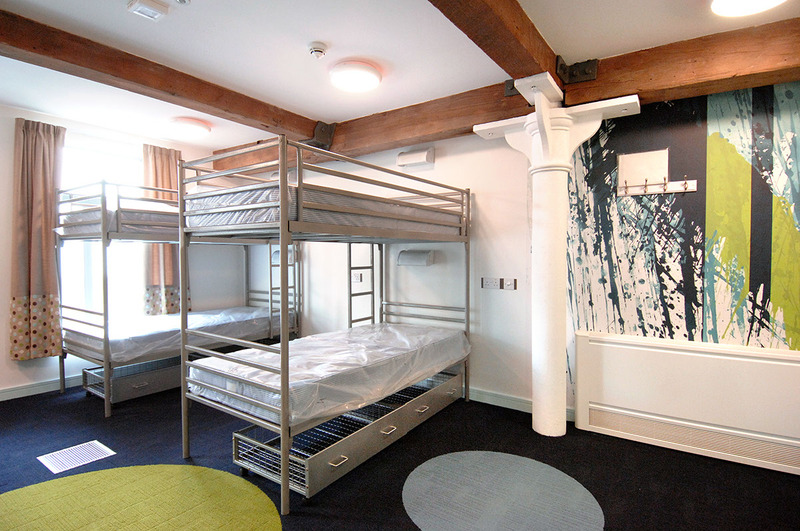 All projects were successfully all undertaken in occupied and operational student-centred buildings. 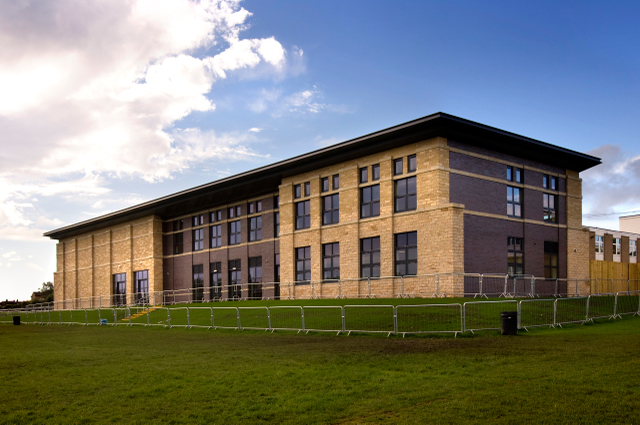 Bowman Riley provided CDM Co-ordination on the Carnegie Pavilion in Leeds, a unique dual-use higher education and sports facility that is occupied all year round. 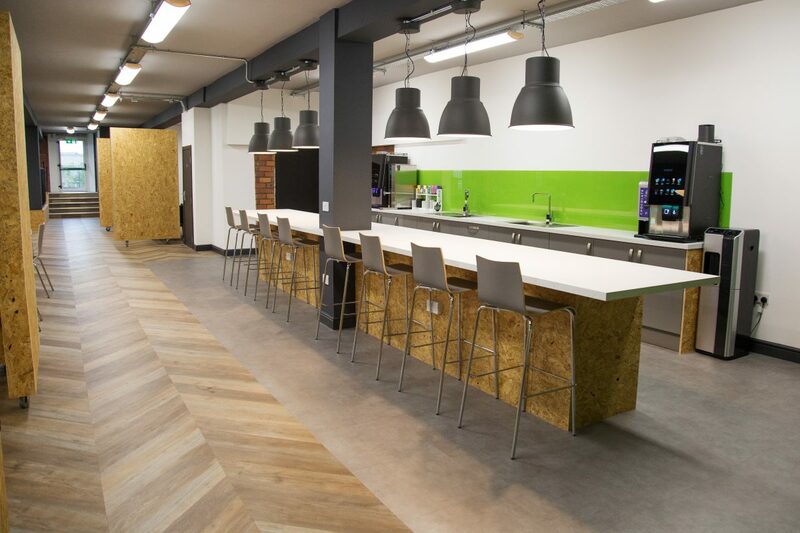 The Pavilion accommodates Leeds Beckett University’s School of Tourism, Hospitality and Events, where students benefit from direct exposure to real life sporting events and hospitality. 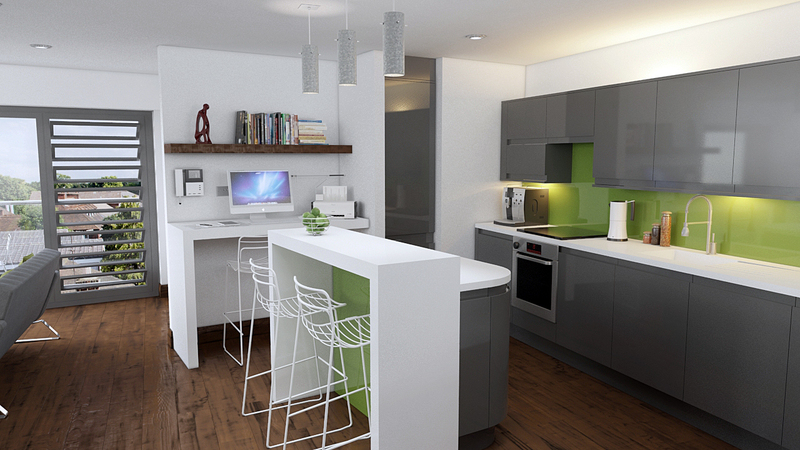 The development incorporates a full-scale teaching kitchen as well as lecture theatres and faculty offices. 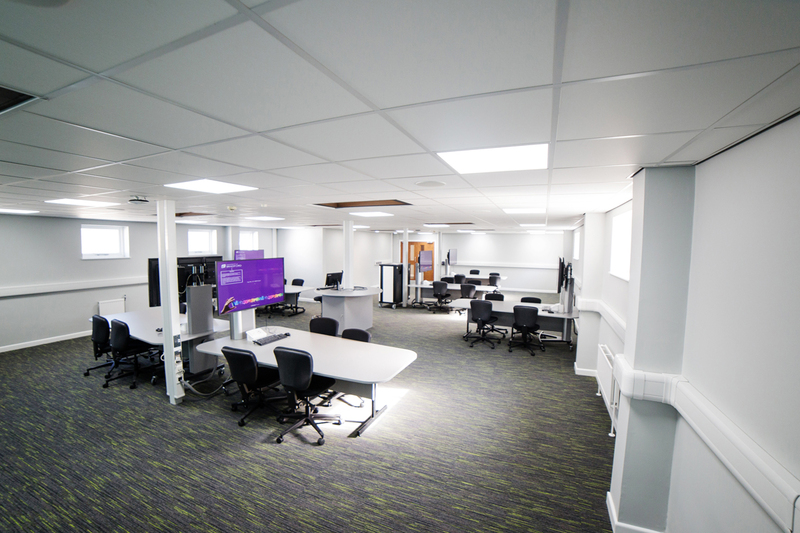 Students of digital journalism will also be based in the building, and work hands-on with the high-tech facilities, designed to meet the latest standards for both TV and radio sports broadcasting. The dual-use 150 seat auditorium, converts into a 100 seat press box for cricket journalists, with uninterrupted views of the cricket action. 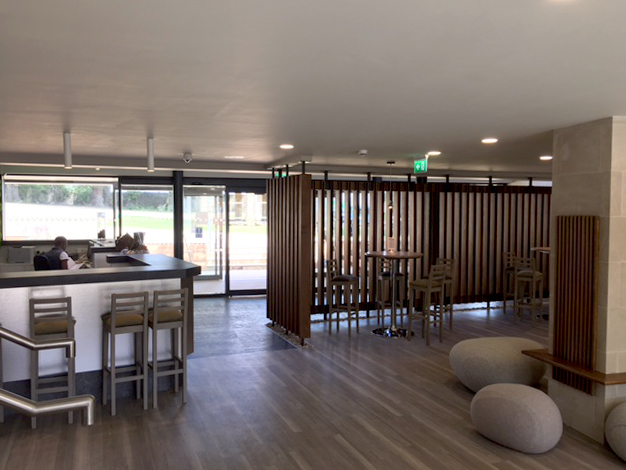 The Pavilion has achieved BREEAM Excellent standard whilst complying with ECB cricketing requirements including the south facing glazed wall providing uninterrupted sightlines. Sustainability was a key theme throughout. 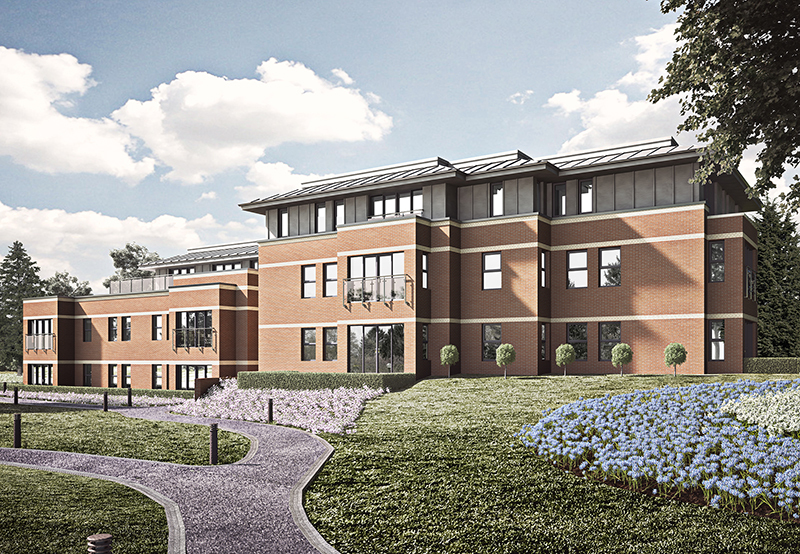 Offices and lecture rooms benefit from natural ventilation, supplemented by a VRF system that distributes warmth around the building as required. 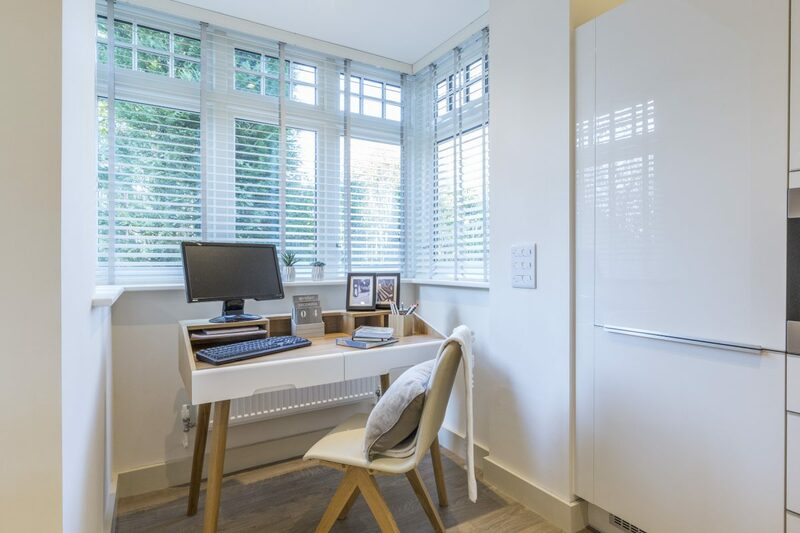 Air source heat pumps provide hot water and electrical supplies are sub metered on distribution boards to enable a more stringent monitoring of power usage. 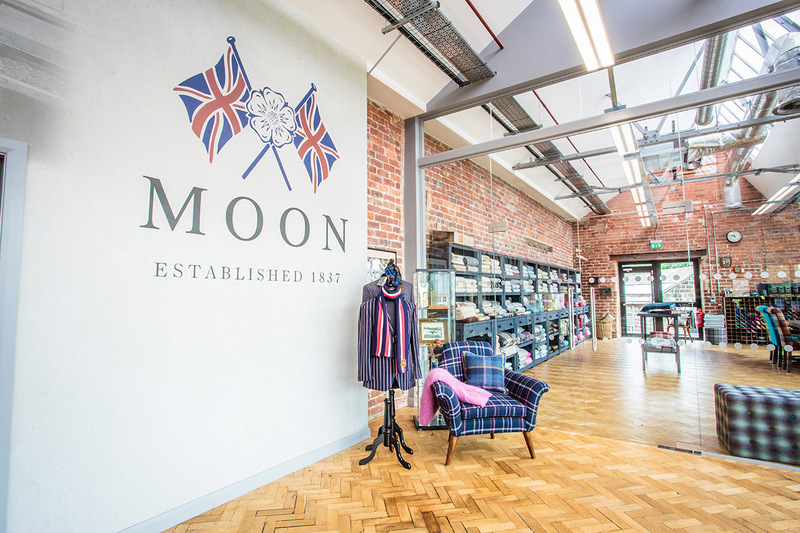 Abraham Moon & Sons is a weaving manufacturer located in Yorkshire, the traditional home of the English cloth mills. 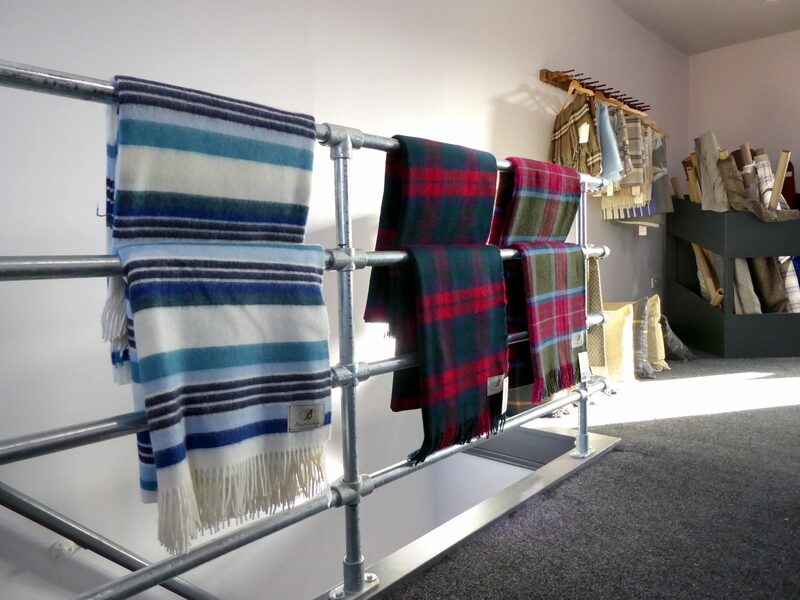 The manufacturer had outgrown their premises and needed to expand to retain their location and modernise working methods. 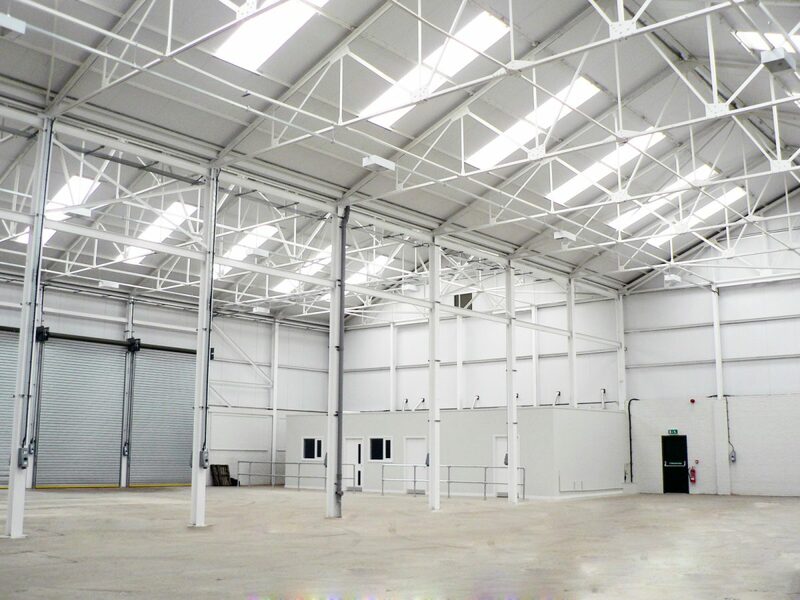 Bowman Riley was commissioned to provide architecture, interior design, contract administration and CDMC to extend the factory by 45,000 ft2 bringing all machinery into one location in an open plan space. Considering the site’s adjacency to a railway line, we communicated with Network Rail to ensure the factory and railway line were kept safe throughout construction. 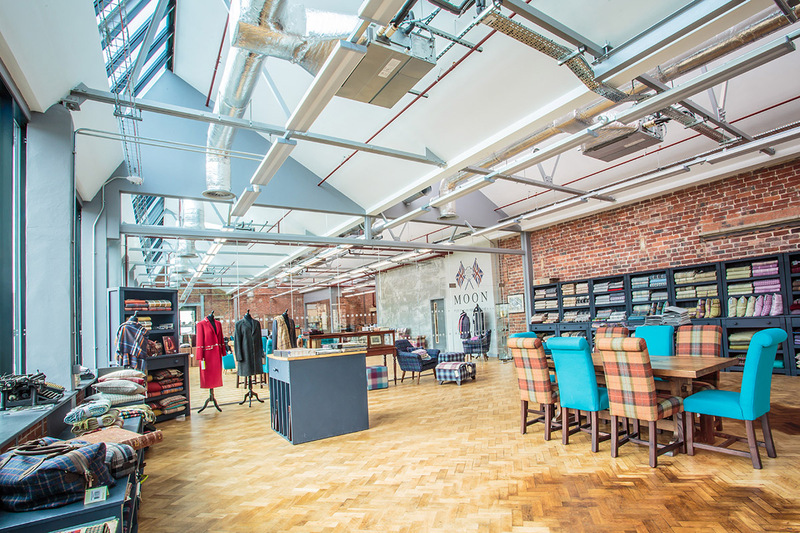 Following the successful completion of the extension, we designed the refurbishment of a redundant first floor space within the mill into a dynamic design office and showroom. 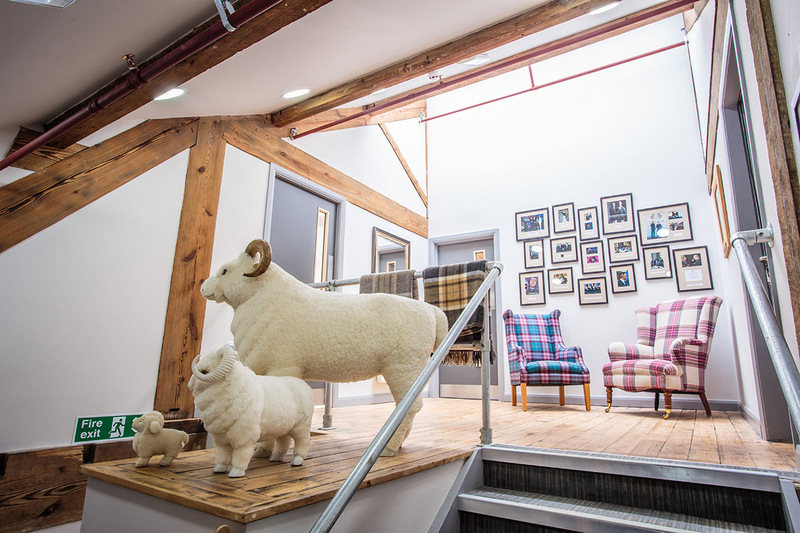 Over 70% of the cloth produced by the factory is exported to America and Asia with clients visiting the factory from overseas to source traditional tweeds and cloths. 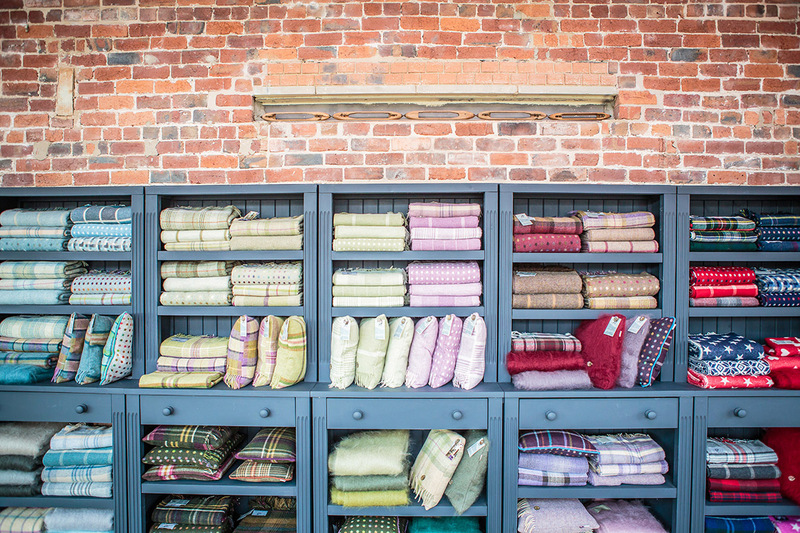 The existing design studio was unable to handle large client meetings with no facility to display the fabrics. 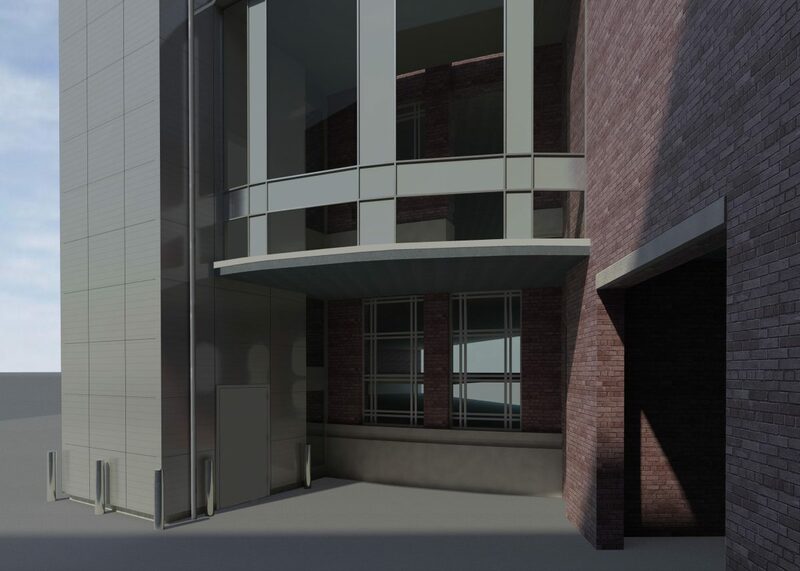 The brief involved forming a new entrance with vertical circulation providing direct access to staff and visitors. 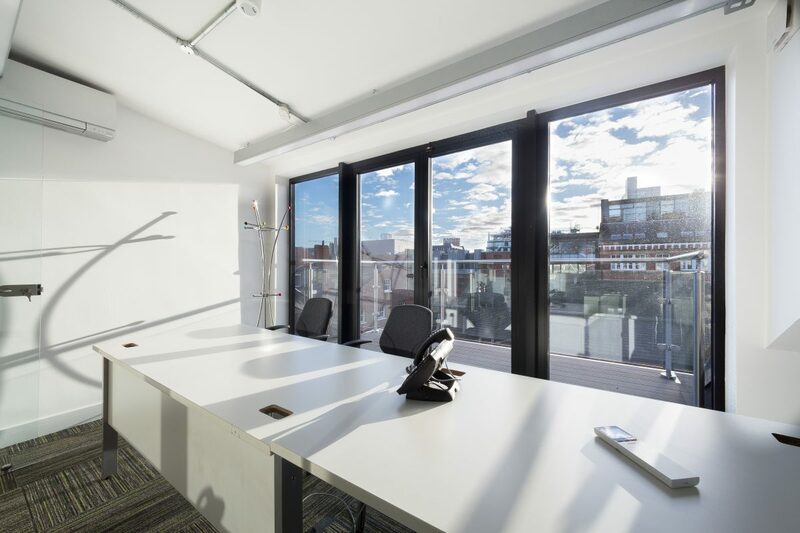 A state-of-the-art heating and cooling system was required to convert the factory space into a comfortable office and showroom. 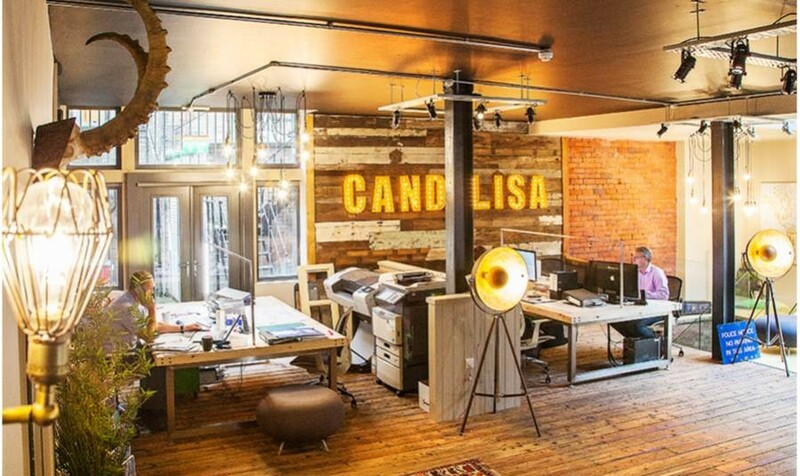 Historic features were retained and the whole space was sandblasted exposing the original brickwork and stone details. 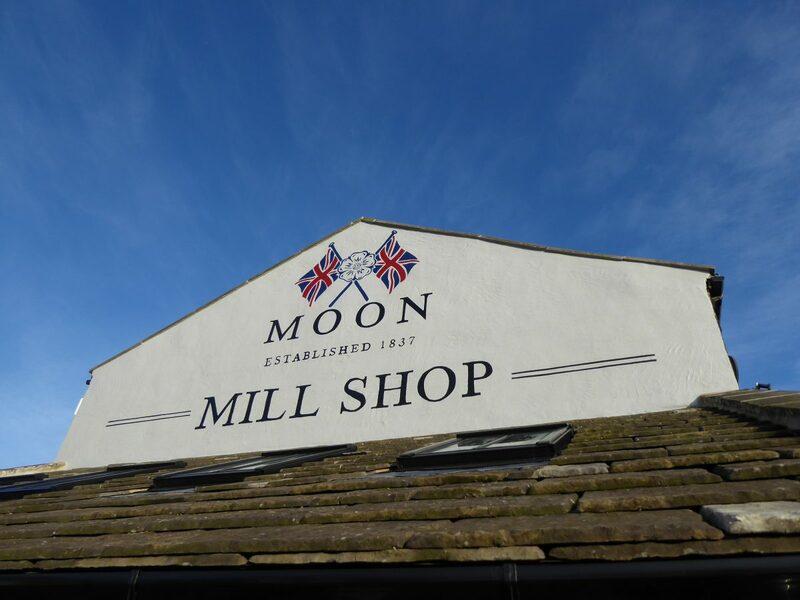 Located within a conservation area, the mill was fully operational during the construction. 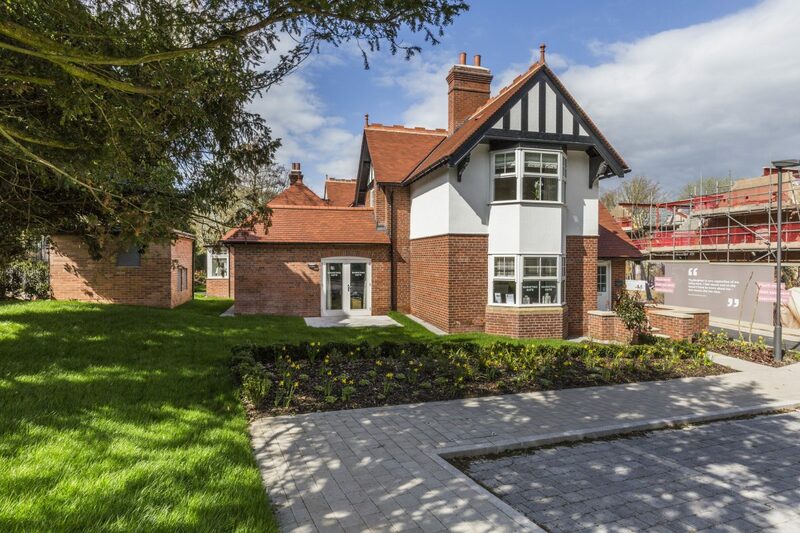 The design pays respect to the local vernacular and the site planning and logistics were carefully considered to deliver a traditional appearance with modern facilities. 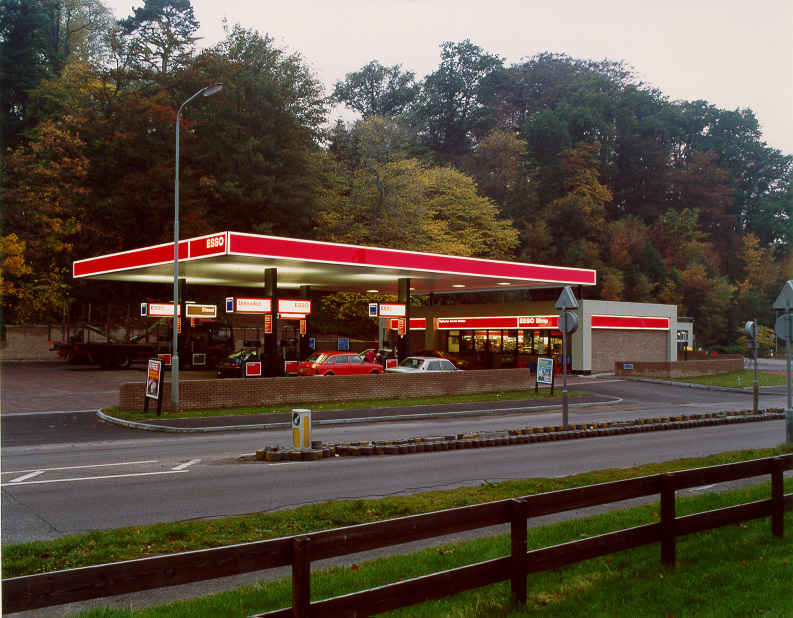 Bowman Riley’s unparalleled experience in petroleum projects can be traced back to the 1970s when the practice was first appointed by Esso Petroleum to undertake projects relating to their retail forecourt network across the UK and Ireland. In the 1990s, we took responsibility for managing the archive of information relating to Esso’s national estate portfolio. This resulted in our appointment by Esso Europe (Exxon Mobile) to develop European standard drawings to form the basis for all retail forecourt developments in Europe. We played a pivotal role in the development and coordination of these standards. Today we continue to work with them to maintain their standards library to reflect the latest European trends and legislation. 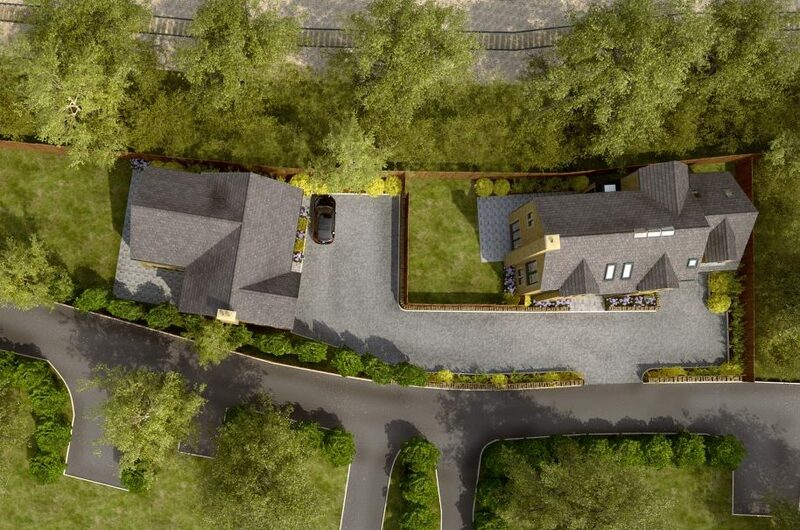 This involvement has kept the practice at the cutting edge of forecourt developments. 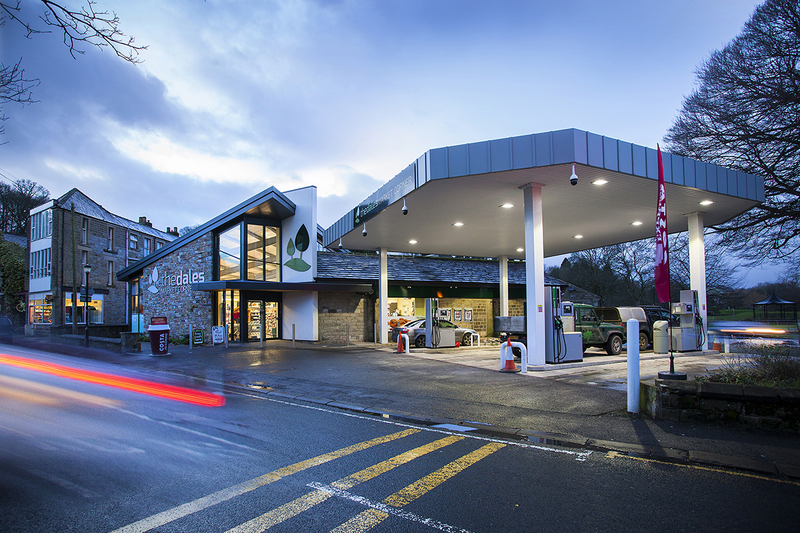 We have also been instrumental in managing the national programme of forecourt upgrades to ensure access compliance on over 600 sites. Our current activity for Esso reflects their current strategy for consolidation and technical upgrade of their estate resulting in the completion of a significant number of tank and line replacement projects as part of an on-going programme. We are also involved in minor works projects on 40 sites to update the site image to the latest low energy standards. We have an on-going brief to prepare and update the Dangerous Substances and Explosive Atmosphere Regulations drawings for Esso on a countrywide basis. 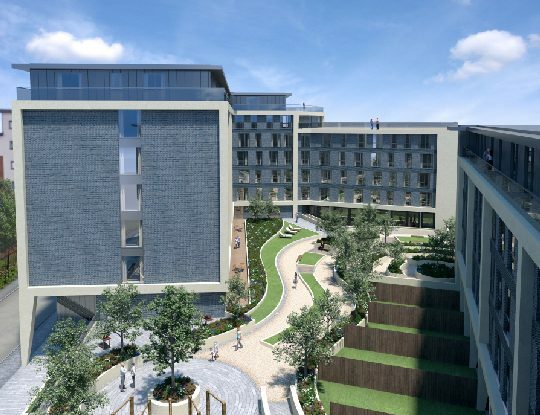 Bowman Riley was commissioned to provide Project Manage, Design and Specification, CDMC and Cost Consultancy services on a new Post Graduate Facility. 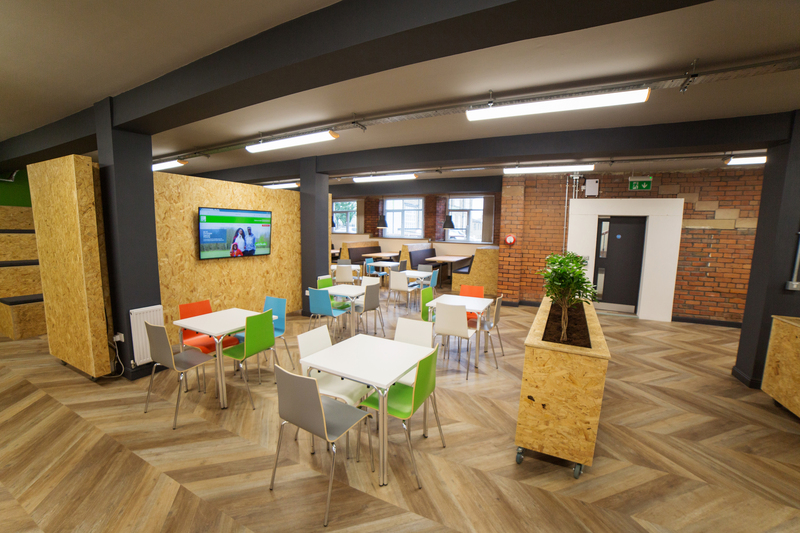 The project was to transform a redundant bank and café area into a new mixed use area to include meeting rooms at the University of Bradford. 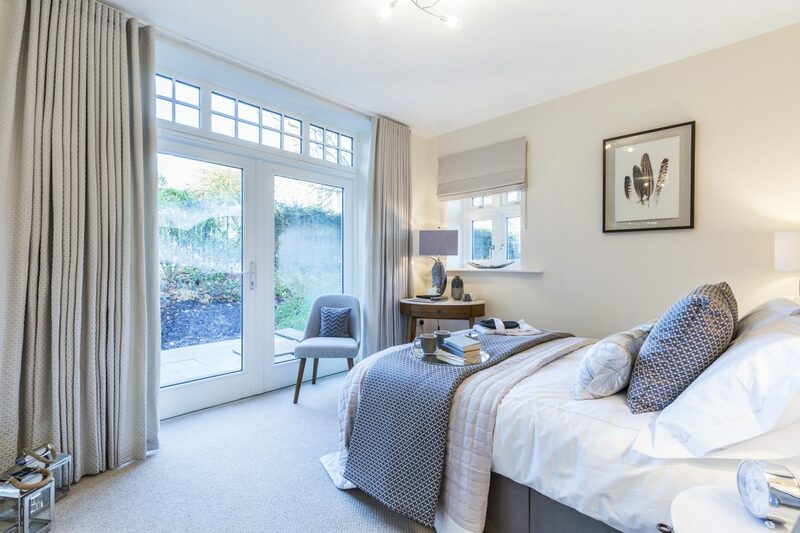 The building was at lower ground floor level with windows situated on two sides of the property which caused significant loss of natural day light. 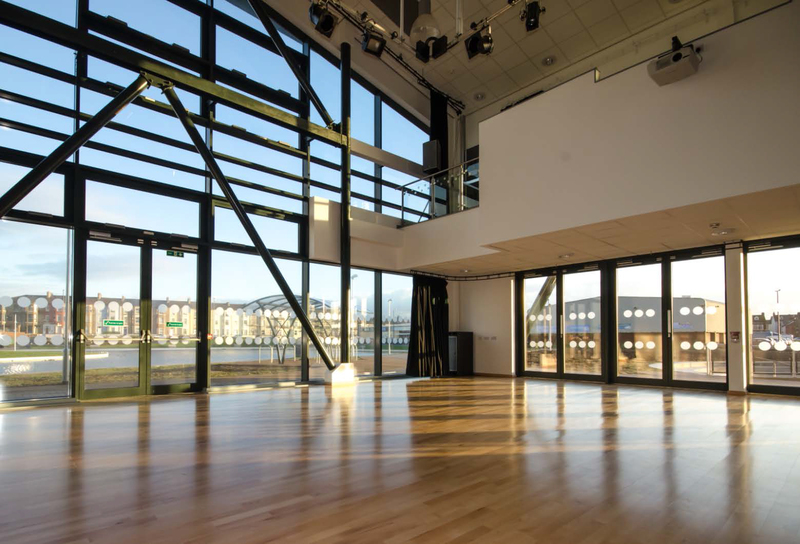 The existing area was completely stripped out, external openings were increased and large structural openings were formed to create natural light through the building. Existing concrete waffle slab was retained to act as thermal mass and new roof lights on automated openers were installed to generate natural ventilation to the heart of the building. New double glazed windows and doors were installed to increase thermal insulation of building. 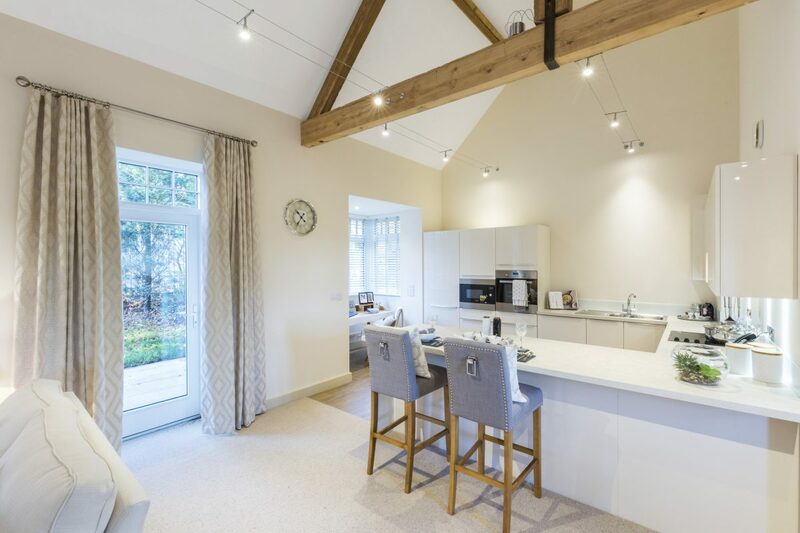 Many products were sourced and reused from previous refurbishment projects including; internal glazed screens and existing high quality kitchen units.High levels of internal insulation were installed to reduce energy usage. 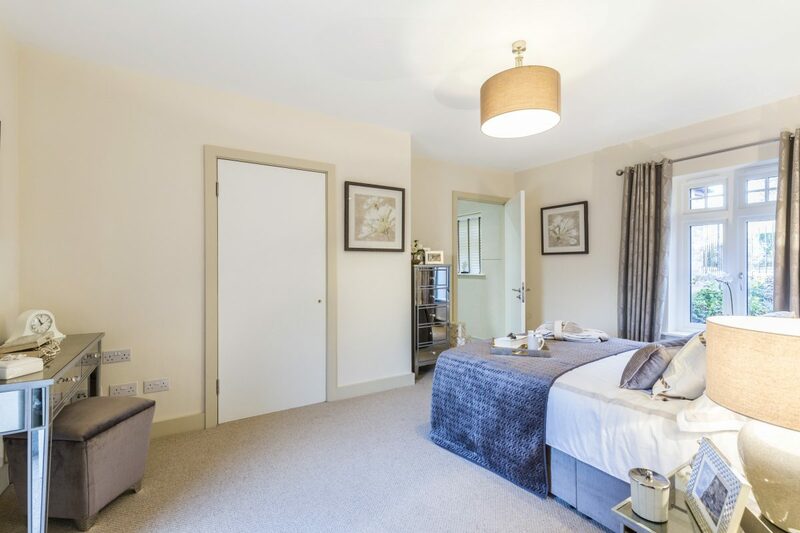 High levels of internal insulation were installed to reduce energy usage. 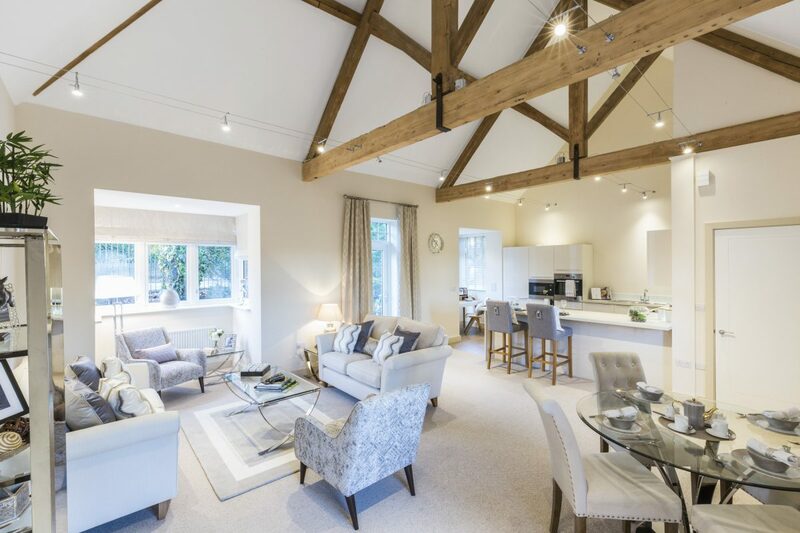 Bowman Riley was commissioned to convert a 19th century fire damaged Methodist chapel and attached cottage into bed and breakfast accommodation set in an Area of Outstanding Natural Beauty in County Durham with views over the Selset reservoir. Built in 1888, the chapel was still in occasional use until it was badly fire damaged in 2012. 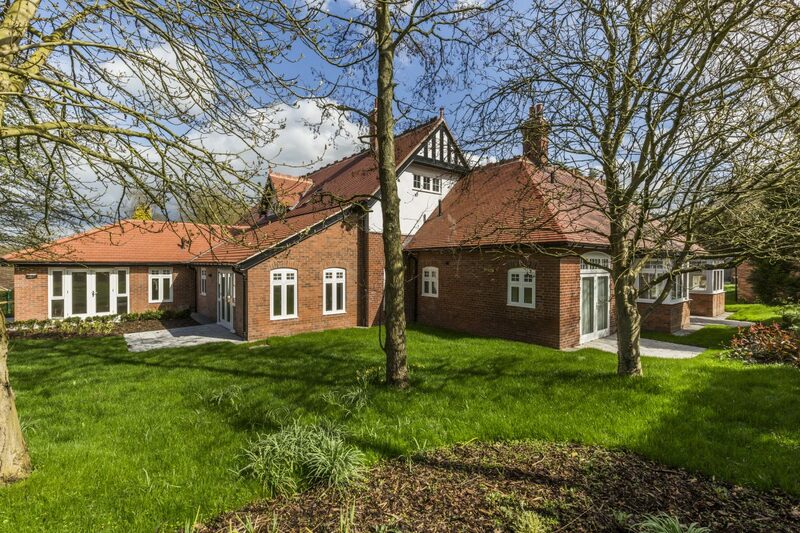 The property was purchased by Wemmergill Estates in 2014, a grouse shooting business formerly owned by the Queen Mother’s Bowes-Lyon family for 444 years. Wemmergill Estates operates a successful grouse shooting business and needs additional on-site accommodation for estate staff during the shooting season. 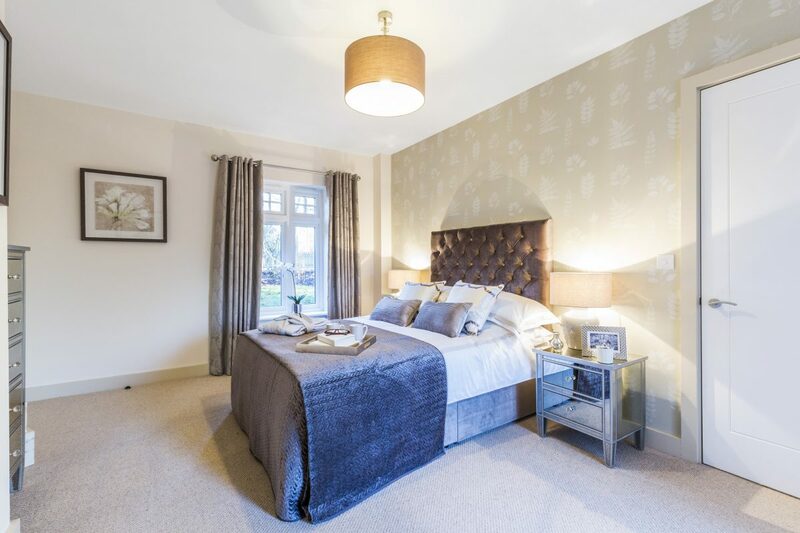 To supplement the income of the estate at other times of the year, it is intended that the property will be used as bed and breakfast accommodation. 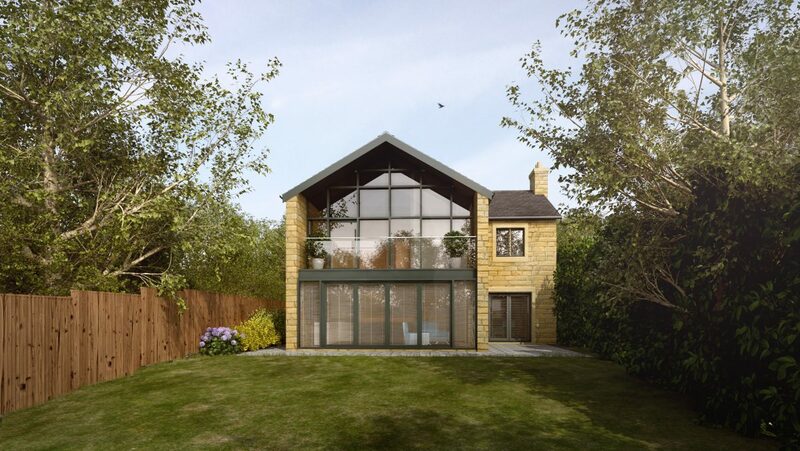 We have designed the renovation of the historic building and a new build extension providing views across the landscape to enable the effective re-use of this vulnerable isolated property. 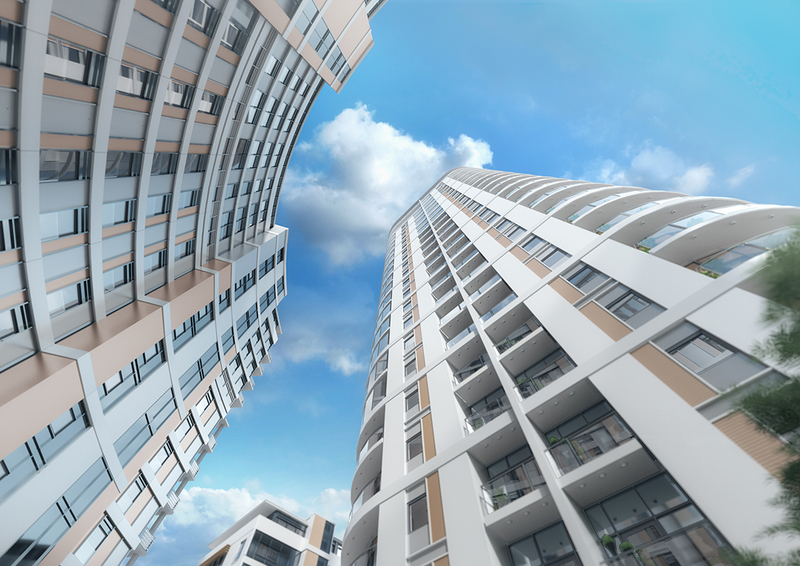 Our design solution allows for construction in a very tight time-scale without clashing with the shooting season or severe weather conditions. 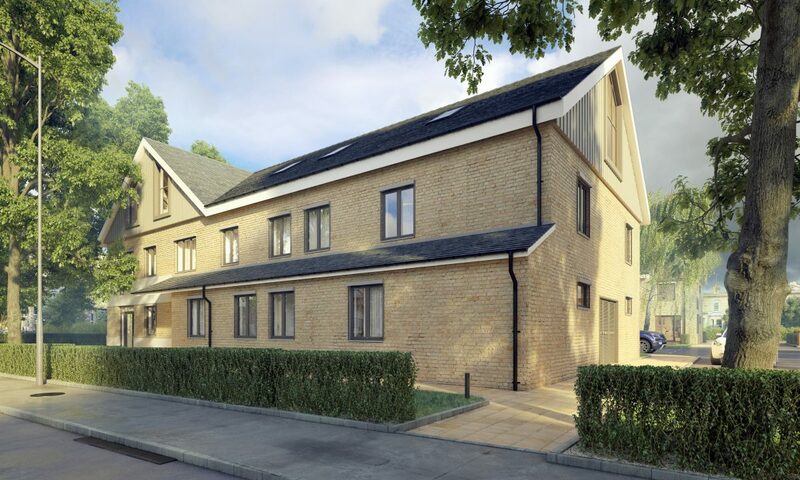 For the new build extension, we propose the off-site construction of stone-clad timber SIPS panels for off-site quality and quick erection on site. This will also help overcome the challenges presented by the remote location in terms of the delivery of materials and skilled tradesmen. Ultimately, this solution will minimise delays to the programme and save costs. 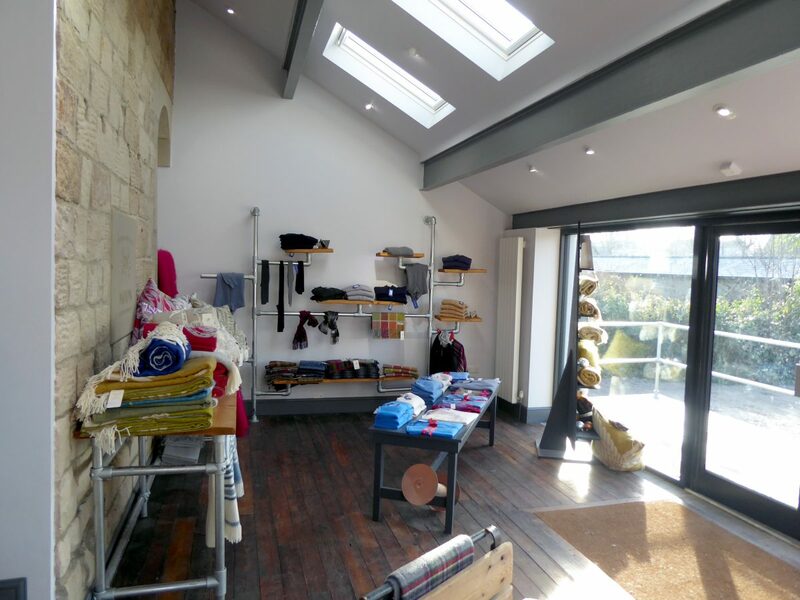 Bowman Riley designed the flagship Boundary Mill Store in Colne, for one of the UK’s largest mill store retailers offering discounted branded clothing and homeware products. Our design replaced the former store on the site with a new contemporary piece of retail architecture, located in a prominent position at the head of the M65. 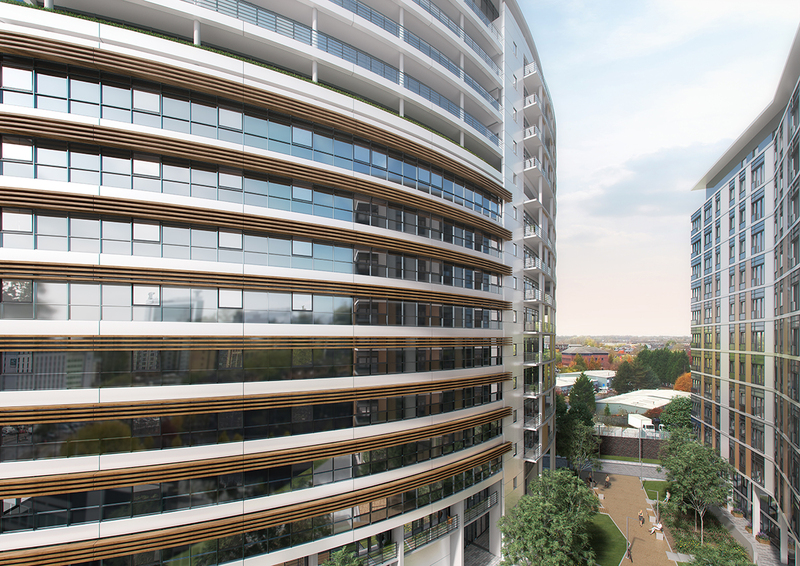 The building incorporates a double height curved glass façade, restaurant and café facilities with spacious balconies providing views over the surrounding countryside and a central glazed atrium with escalators and lift access. 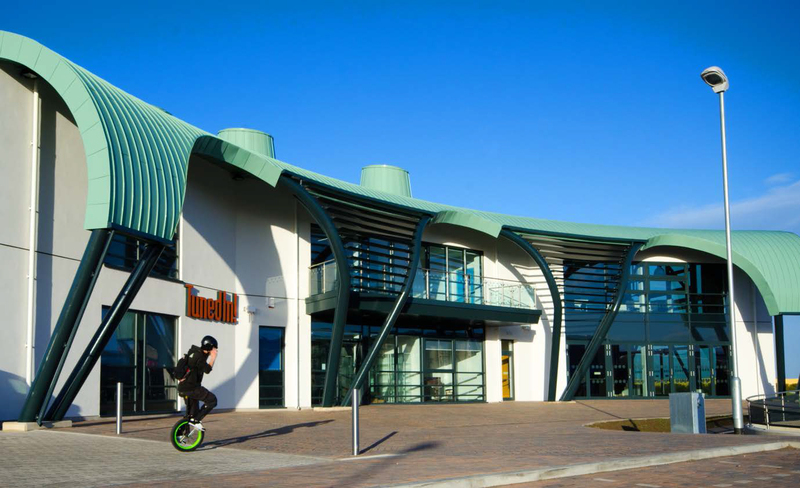 Alongside the two storeys of retail space, we designed the associated warehousing, offices, and ancillary accommodation, along with external works to support approximately 1000 car parking spaces and a bus park. 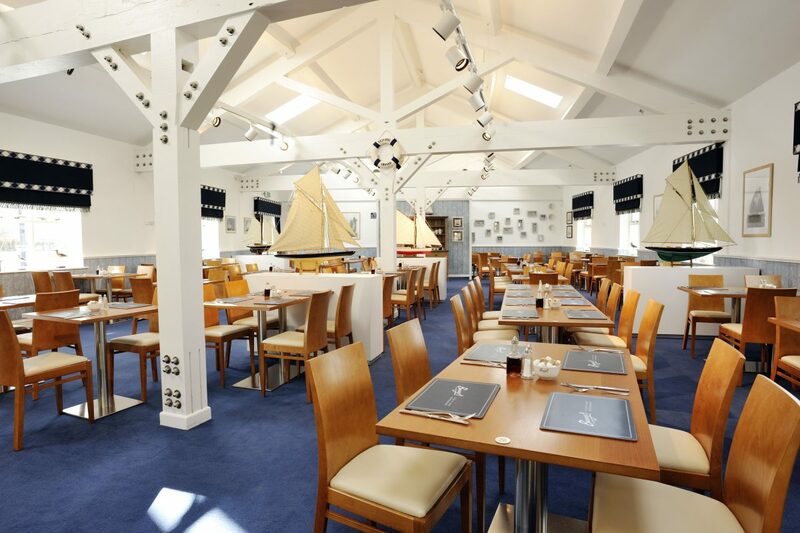 The project incorporated a separate traditional style restaurant with 300 covers, tourist information, retail pavilions and a maintenance store with generators and a sprinkler plant. 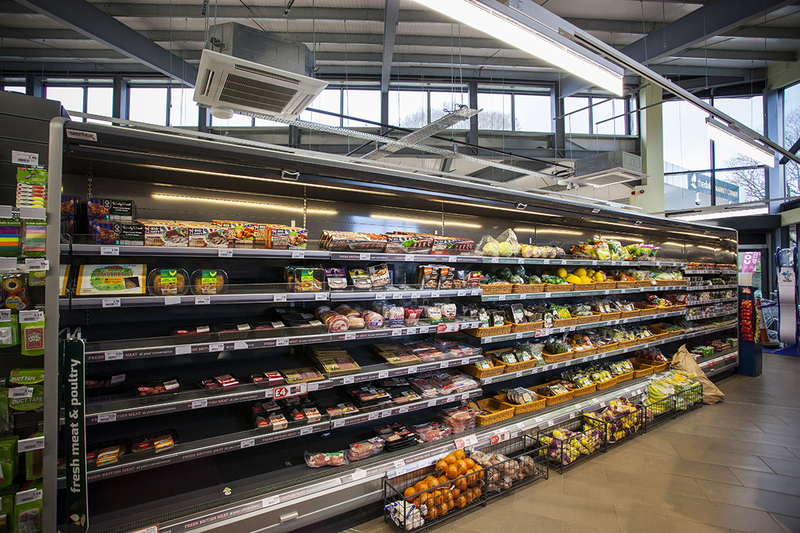 Delivered on time and on budget, this successful development allowed Boundary Mill Stores to attract more customers, operate more effectively and grow their business at this flagship site.